These are surprisingly dramatic yet relatively anonymous mountains, a mere preview to what looms just across the State line. They are absolutely worthy of many an expedition for certain, but remain in the reputational shadow of what awaits in Colorado. To its credit, a mere glimpse of these small peaks reveals a warm and distinct beauty, truly inviting. Everything about this small range says “jump up here for a day!” Like so many people just passing through, this place was passed by in order to reach the Rocky Mountains of Colorado. 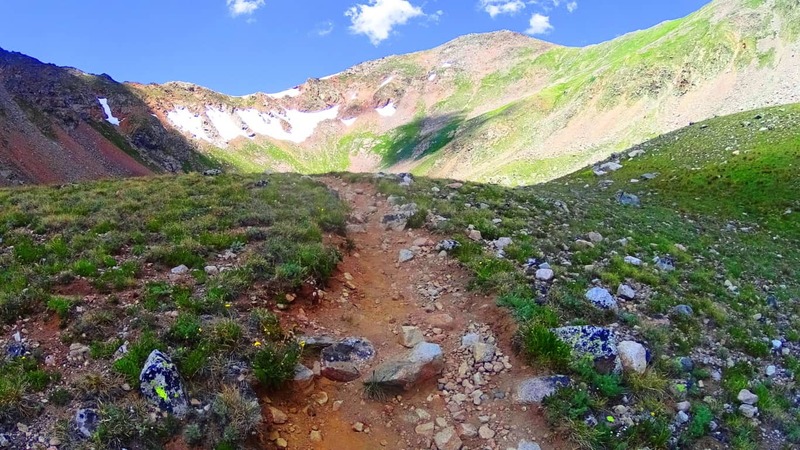 Clark Peak Trail: The feel of Colorado is vast and rustic, and yet it leaves natural space for significant delicate statements also. Trails are thickly bedded with wildflowers of every possible color, like the approach to the mythical city of Oz. Brown Bears and Moose roam the mountains and forests, but for the most part steer clear of the trails. The high plain sits about 9000 feet above sea-level, supporting a universe of fauna. 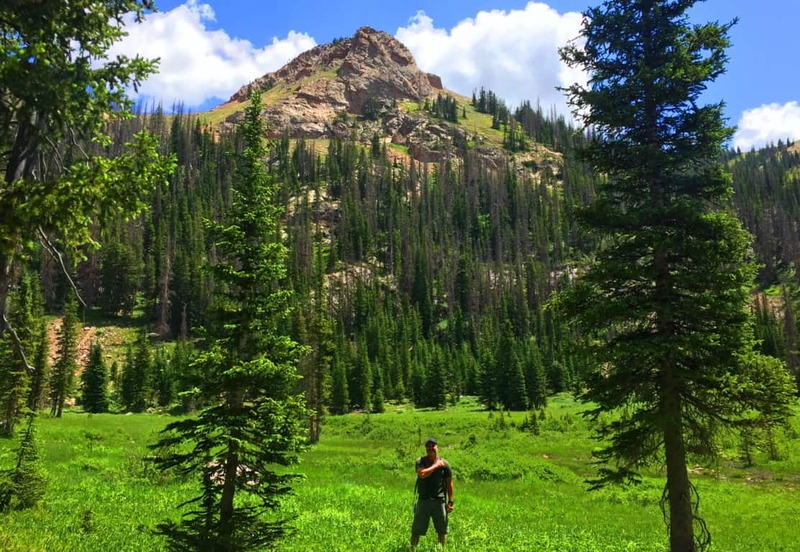 Accessing the elevated trails of Medicine Bow National Park in high country like this requires a 4×4 vehicle, plain and simple. The highest peak of Medicine Bow’, above the northern Rockies, is Clark Peak, looming just shy of 13,000 feet above sea-level. There are basically three levels of trail-heads, each a bit further up the Trail than the next. The first trail-head approaching Clark Peak is at the end of a wide dirt track that passes a small lake on the far edge of the mountains. To start from the first trail-head could basically take more than a day to complete the ascent and return. Most hikers attempting the peak desire an entry that reaches to at least the second trail-head. You should not attempt the second or third trail-head without a 4×4 truck, and prepare to rent a 4×4 for your excursion. Below is an image of the Clark Peak approach. Above the high basin on the left is your destination, where a large still-water pool awaits. 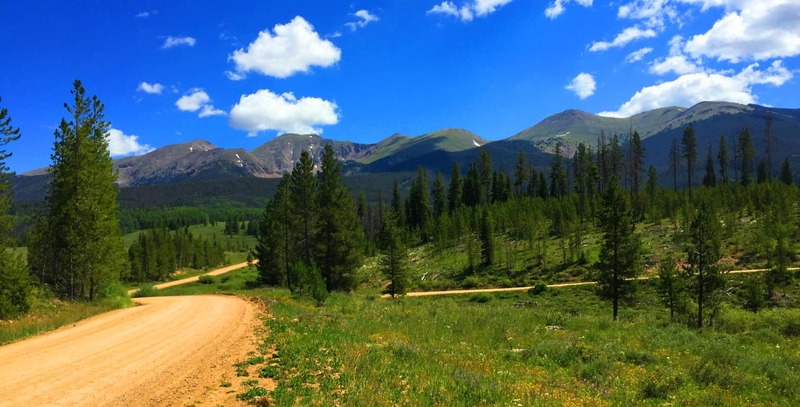 The second trail-head begins about 5 miles into the lower vale, so when you ditch the truck on the side of the track, the forest will already be surrounding you, and perhaps in a way it has never done before (even for seasoned cross trainers.) 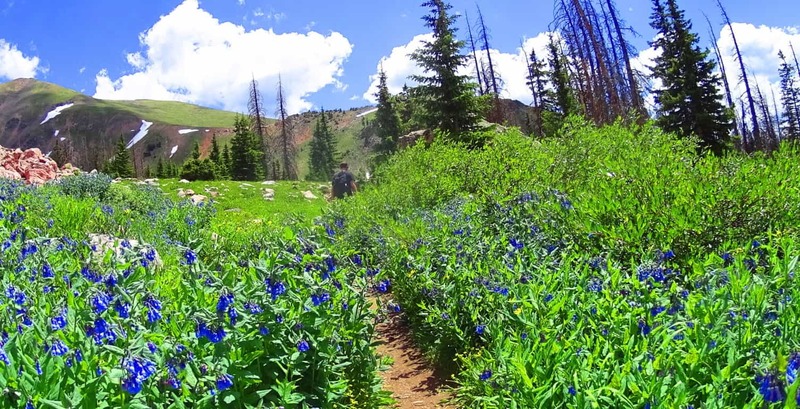 If this is your first hike in Colorado, you are stepping into a type of hiking phantasy from the moment you get out of the truck. 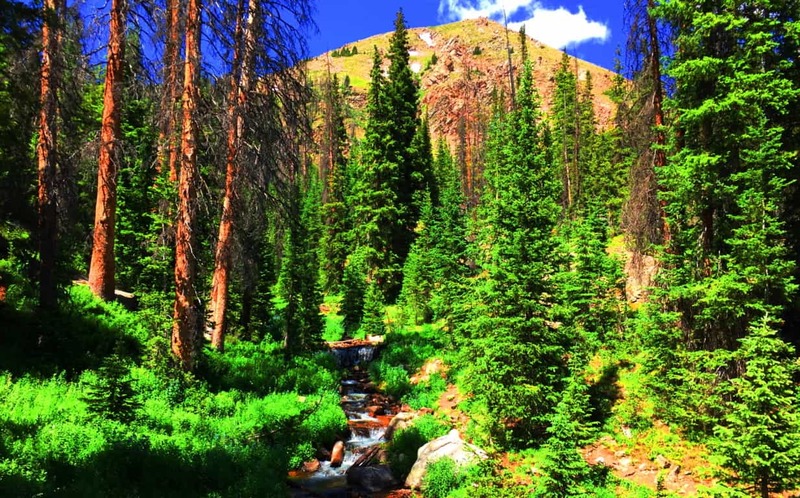 The tallness and fineness of the Aspen trees, Blue Spruces, Douglas Firs, Ponderosa Pines, and Lodgepole Pines, creates a literal euphoric vibe in the forest. From a distance, the woodlands seem to be blending into each other somehow. When the shafts of sunlight hit these trees, it is hard to focus on any single thing; it’s as if the trees are literally vibrating into each other. There is a type of enchantment here, a vastness to these glades that gives a very physical impression. The thickets here look as dense and deep as any ocean, and just like the ocean, to go too deep un-prepared could prove fatal. Respect this wilderness, pack properly, study-up, and stay on the trail when inside the forest. The basics here are about being aware of ‘forest-fire warning-levels’ and the restrictions to using flame, the possibility of bringing bear-spray (or even a fire-arm), and never leaving cooked food/food goods unburied or littered in the forest; it will draw the Brown Bears if you are lazy and careless with your goods. Stay sharp and aware, ready to have a great experience. 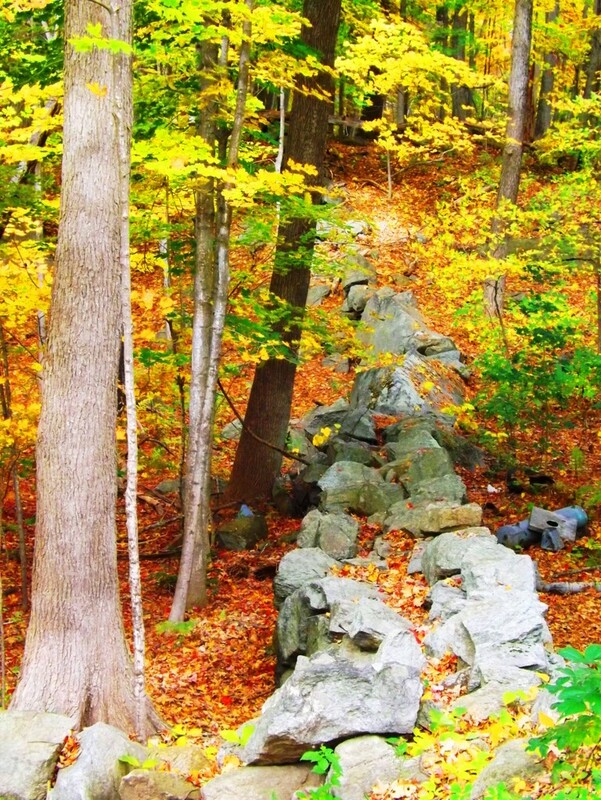 Very much like in the Mourn Mountains in Ireland, after the lower valley roads begin to elevate, they usually blend into a stone road trail that is almost certainly an ancient pathway. I wondered if I would find such a thing in a wilderness so far removed from Celtic characteristics, and to my delight I did. The look of these rocky tracks are surprising in the initial heights of any mountain range. 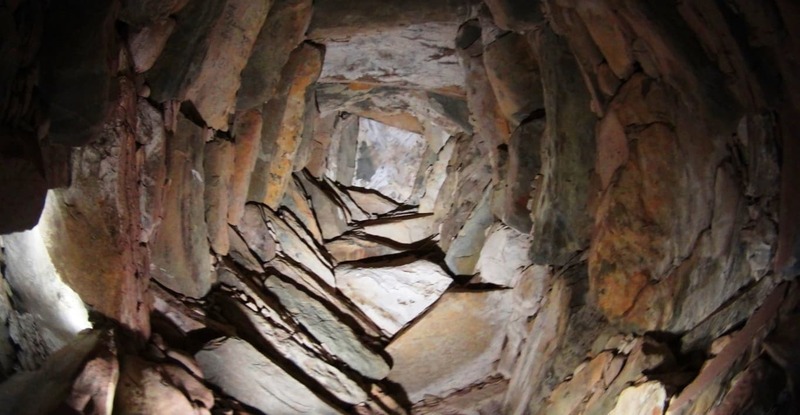 In many places it seems that these ancient pathways were the very first roads on Earth, navigating the high mountain passes built by the most ancient Culture on Earth, the Neolithic Culture. Here is a look at the ancient stone-road at Mount Bearnagh in Ireland. 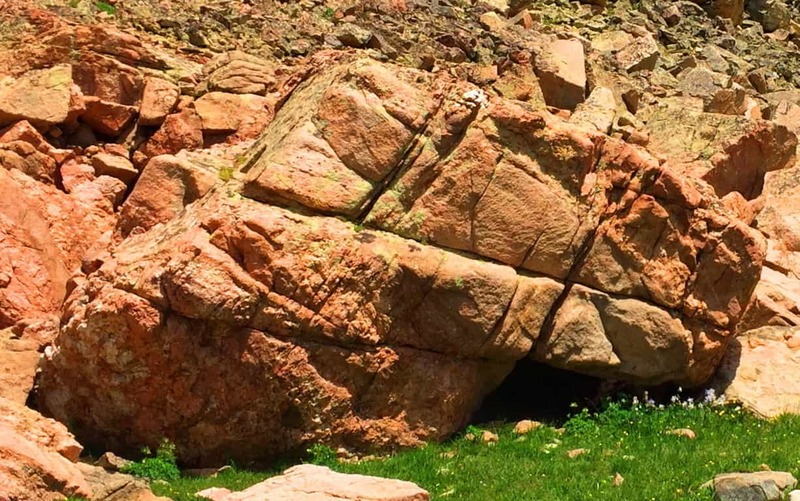 (Image/Below) And now here is a look at the nearly identical width grade, and angle of an ancient stone-path in Colorado. (Image/Below) Many of these approaches have been re-worked from a much older original path that has been there (for all intents and purposes) forever. In Ireland it would be the Gaelic/Celtic Culture that identified and revised the ancient paths, while in Colorado, the Native Americans would have been the first to observed and acknowledge these trails as “sacred pathways”, or “pathways of the spirits.” These origin roads had existed long before even their earliest ancestors had arrived. The point is, there is very good reason to believe that an even more ancient culture existed here before the natives, a culture capable of building and engineering with megalithic stones. To my great wonder, some of these signs of “cut stones” and a singular pathways with a specific measurement (roughly 4.5 feet across) in the high mountains appeared here on Clark Peak Trail. A deciphering look at the old pathways alone, however, is not enough evidence to support the idea of a Neolithic existence in this place; it will be in the heights that Wedge Tombs, Cairns, Standing Stones, and Vantage Stones reveal themselves, as we know from Celtic ranges. I admit that this was on my mind as I ascended the beautiful valley with one of my oldest and best friends. There are also “seat boulders” at the pass at Bearnagh, which absolutely look to have been placed at a cinematic point on the valley, as a place where you could sit and watch anyone approaching slowly from below. 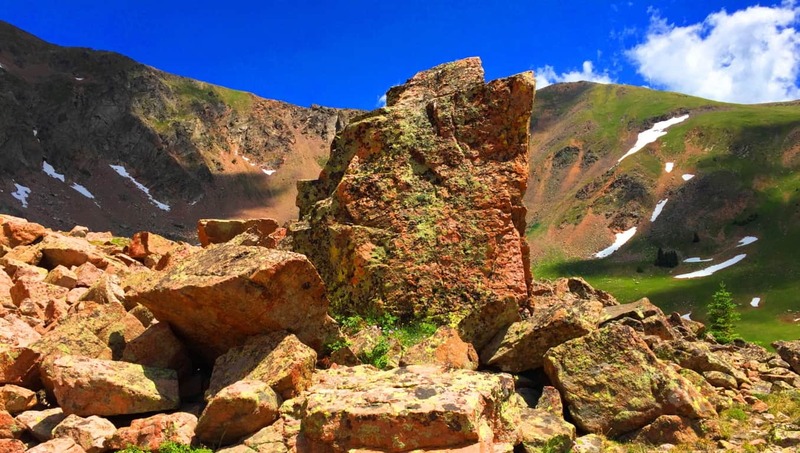 (Image/Below) Here at Clark Peak Trail there sits an auspiciously placed boulder which looks more like a “seat” then a random resting place from a rockslide. 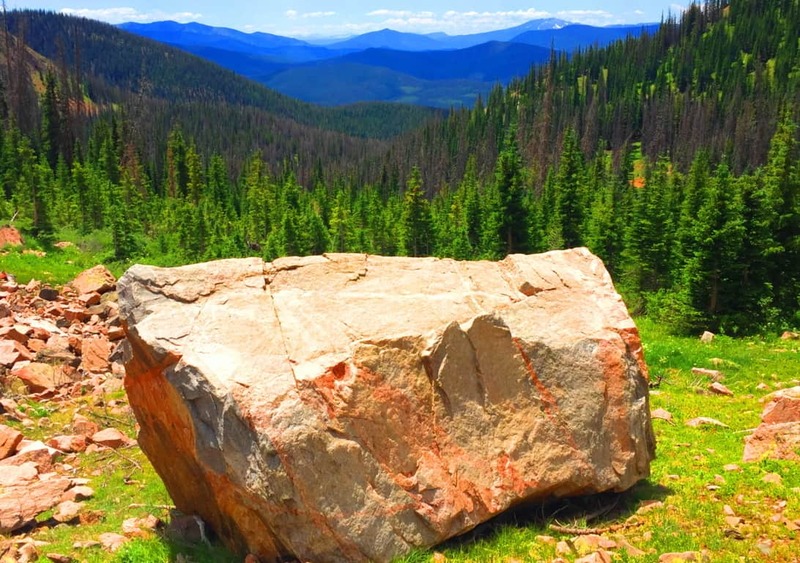 This ‘squared’ boulder is perfectly centered on the vision that is the brilliant view of The Rockies beyond. 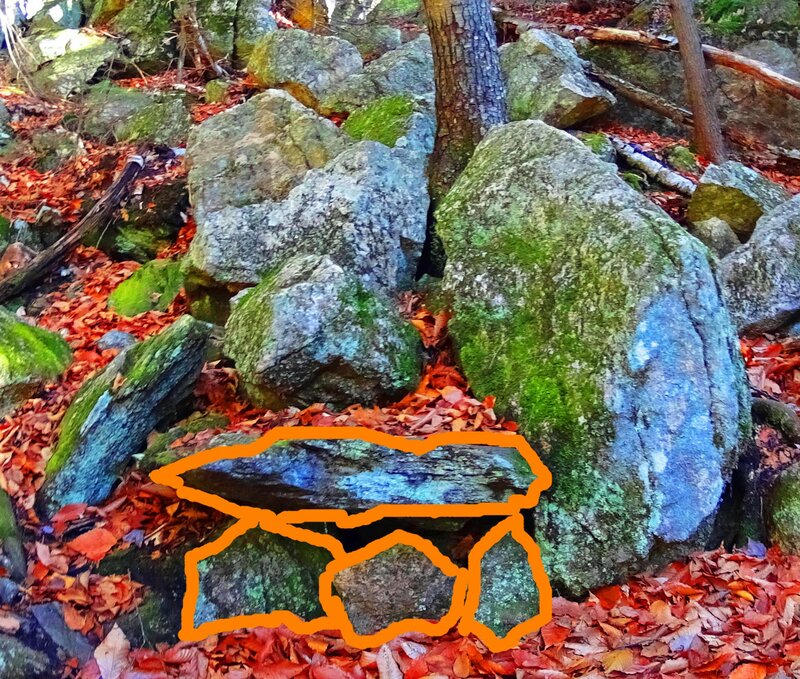 (Image/Below) The other stones of this scene are compiled in stacks, tightly packed together, way off to the side of this beautiful seat; and the possibility that it was intentionally placed there becomes very real after considering its perfect symmetrical placement at the dead center of the valley. Only the Neolithic culture, the culture that had the strength and skills to build New Grange, or arrange massive stones in The Mourn Mountains; or masterfully craft the Sarsons at Stonehenge, has the capability to do something of this scale in antiquity. Clark Peak Trail, as you progress, begins to show signs of Neolthic Culture. Clark Peak Trail may very well have been home to the very same Neolithic Culture that marked and roamed the peaks of ancient Europe. From this gorgeous spot the Trail runs over the landslide stones and into the curvature of the upper basin, where the scene becomes truly surreal. Beautiful fields of wildflowers decorate the mouth of the basin. Campers pitch their tents here on soft glowing beds of grass and singular Pines. The view is like trekking the natural porch taking you straight to Valhalla. 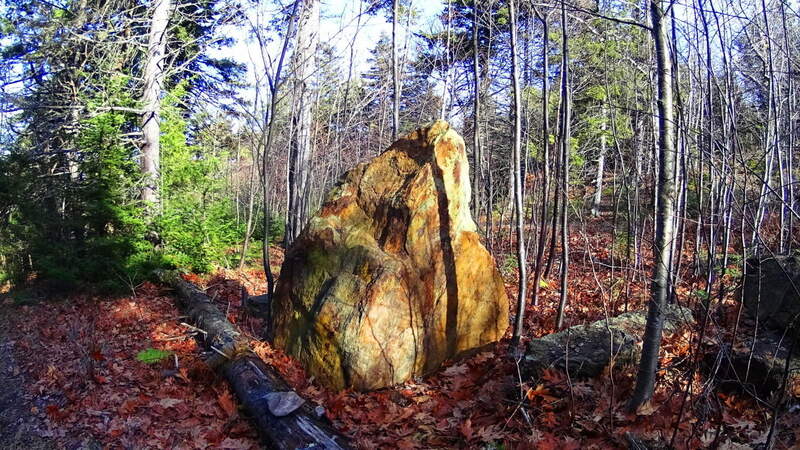 This Standing Stone is 6 feet high and 4 feet thick, looming on the left ridge just above the main Trail along the upper basin fields. The most distinct crafted cut of this Stone’ is along the entirety of Its right side. At the top of the Stone’ there is a distinctly straight top ‘cut’, with an indented ‘top’ slant above it. The left side contains two smaller ‘levelly’ crafted indents. It is so distinctly different than any of the other stones in the basin that I was left to wonder how it was possible that not one person had acknowledged it before?! Additionally, like so many Standing Stones, there is a distinctly marked Cairn on the ledge below, a fairly large crafted cavern where the designers of this Stone would’ve kept objects of value tucked-away. 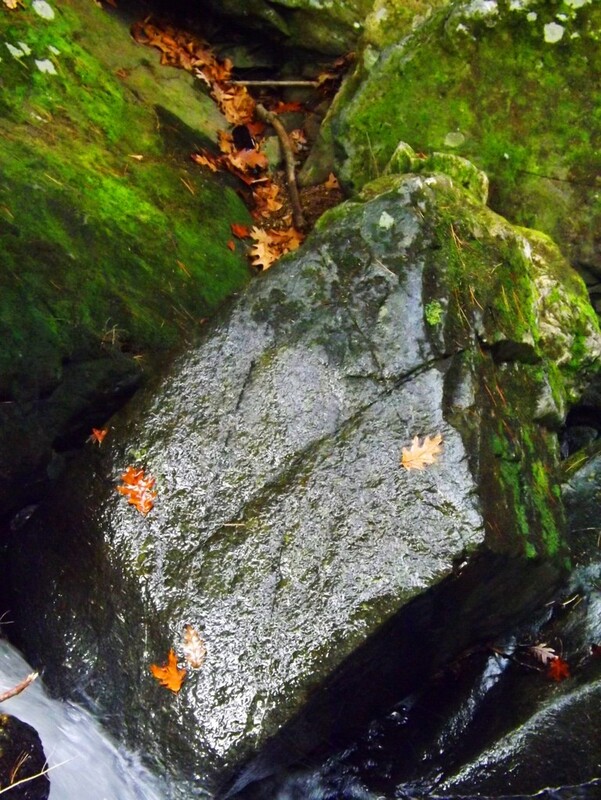 A set of large parallel streaks marks the stone above the trademark opening at the bottom right of the boulder. 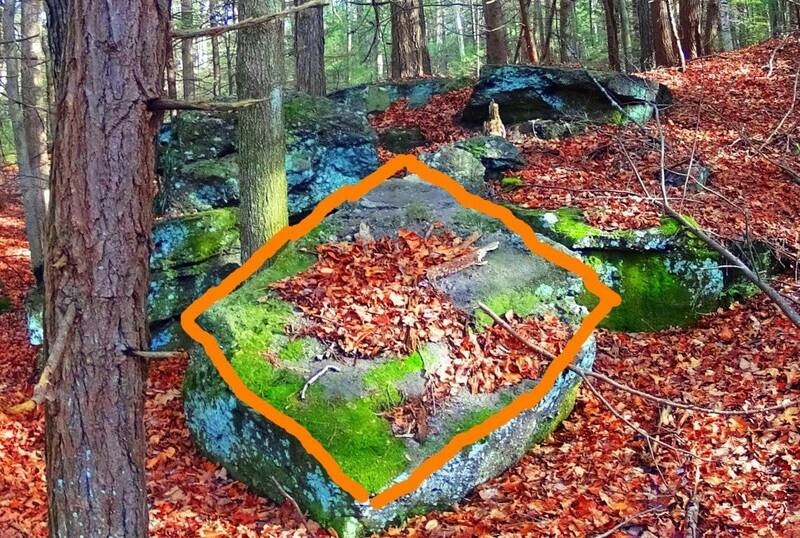 Do you see any streaks in any of the stones around the area? No, you don’t. The stone is marked for a reason, it was obviously a valued setting in the basin for whoever claimed it. This Cairn Colorado was one of the largest I had ever seen. 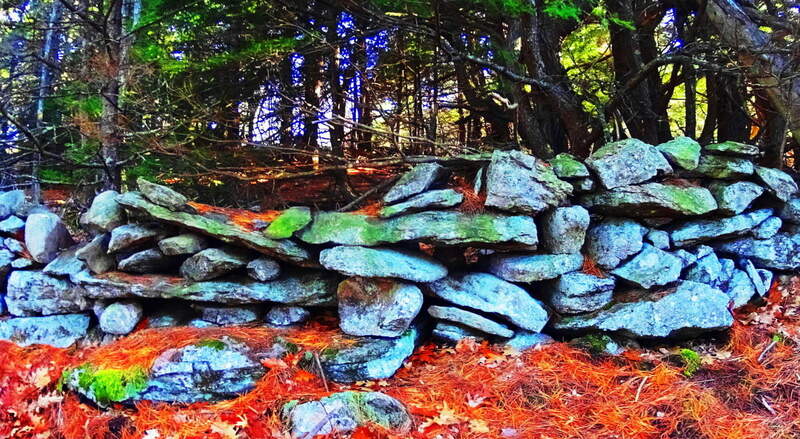 Other Cairns of this nature could be found in Ireland, New England and practically ever other Celtic peak. 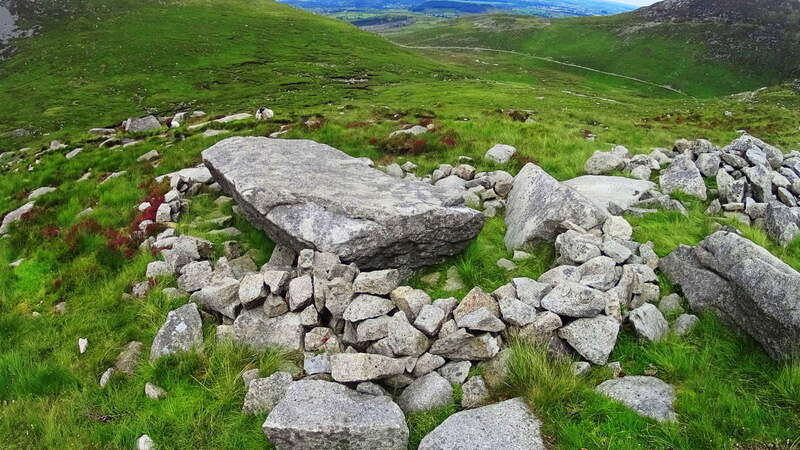 Take a look at these very similar Cairns to be found in Ireland and New England: It is true that they look very natural, but their attributes are almost always the same, containg an emblematic “side” which covers a specific gap on the right side, and are in areas where other amazing stones have been blatantly crafted. 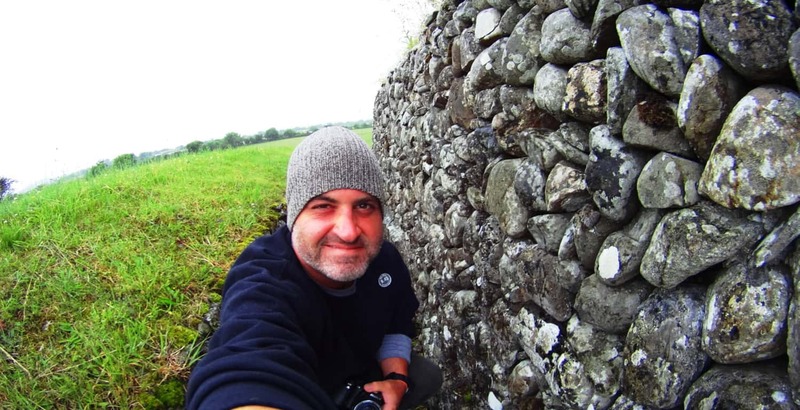 These Cairns are almost always found near sacred stone statements in the landscape, meaning they are indicative of a specific area that was inhabited by craftsman of the Neolithic Era. From the Standing Stone here in Colorado, the last portion of the Trail runs up the Basin. Tucked into the Basin is a lovely hidden lake, which at one time would’ve been a perfect source of drinking water for anyone trying to occupy these heights. All the elements for survival are there. Make your way up the final narrow pathway, where beneath a ledge of millions of stones, none of which look anything like the ones that we have identified as ‘crafted’, sits the stellar pool. Here is the final elevated path into the high basin the image below: And here is the reflective pool. Imagine looking down on this pool on a clear night to look at the stars! 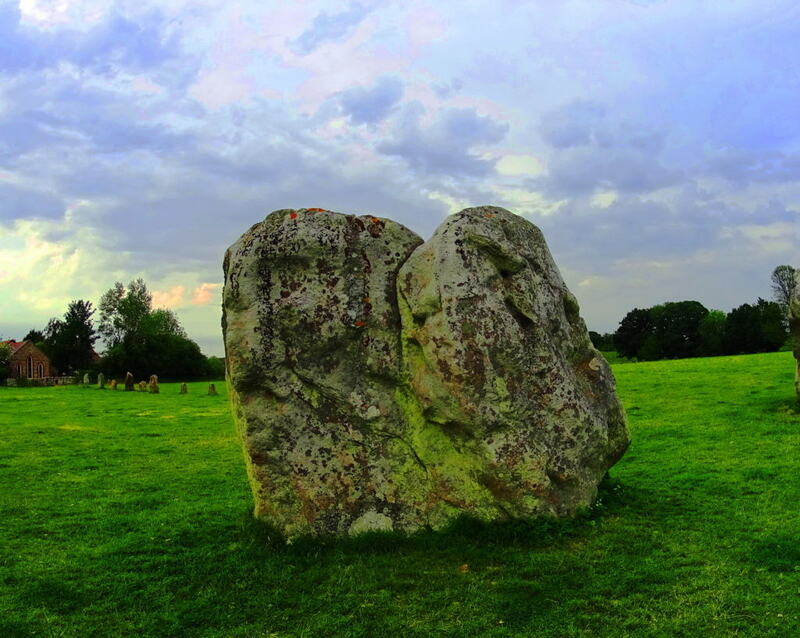 It may very well be that the Standing Stone is pointing to a specific constellation in the night sky, or some meaningful designation of that nature. It would require more time than I had on this fine day to discover such things. 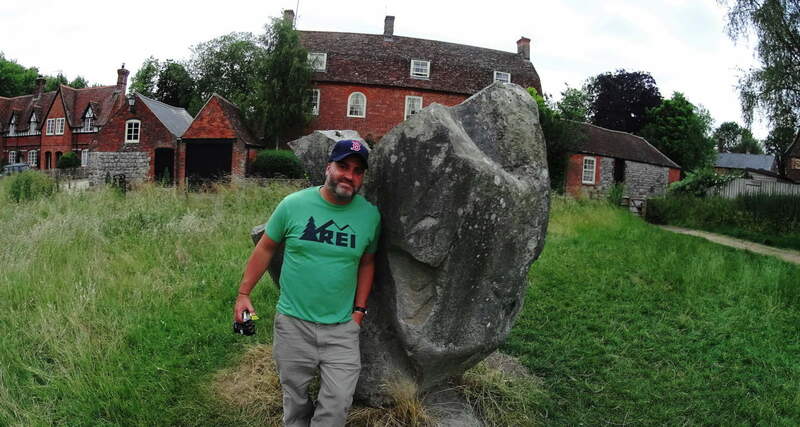 But it is truly safe to say that most Standing Stones have a multi-contextual meaning, and here in Colorado, with a crystalline clear sky in July, that possibility is very real. 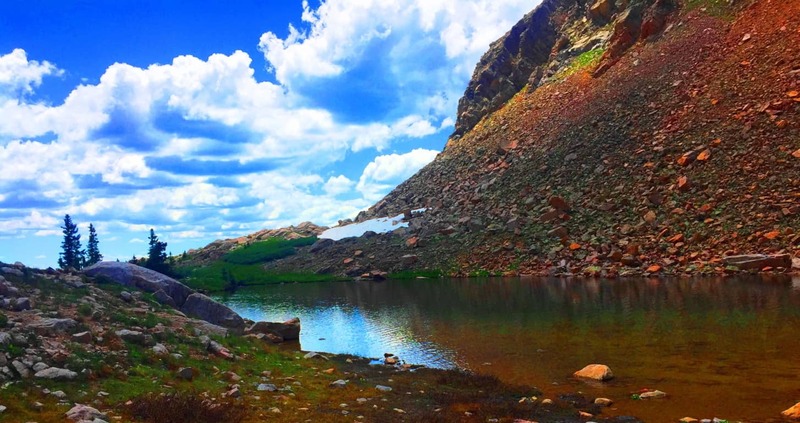 This is one of the highest basins in Colorado, and the country. Like so many beautiful Celtic trails, things here slowly blend into child-like wonder. You are humbled. A look back from the Lake displays a gorgeous jade animation of the entire basin, with the High Plain of the Rocky Mountains beyond, along with drifting clouds that practically touch the upper crags. There is a very real temptation to break all convention and remain in this place, however reclusive it may sound. If a Neolithic individual did decide to live here, the set up for a fantastic existence seems perfectly clear; you could keep a flock in the lower basin, keep a fire by the upper lake, drink a never ending supply of water, and monitor the entire scene from the Standing Stone vantage. Logically it makes sense here. As someone who was trying to scale the heights of Glen Coe Scotland while caught in a rain storm exactly one year earlier, I could not help but feel that Clark Peak Colorado is one of the most comfortable challenges you will ever engage in the month of July. The air temperature and quality in near perfect, pristine, and so delightful. 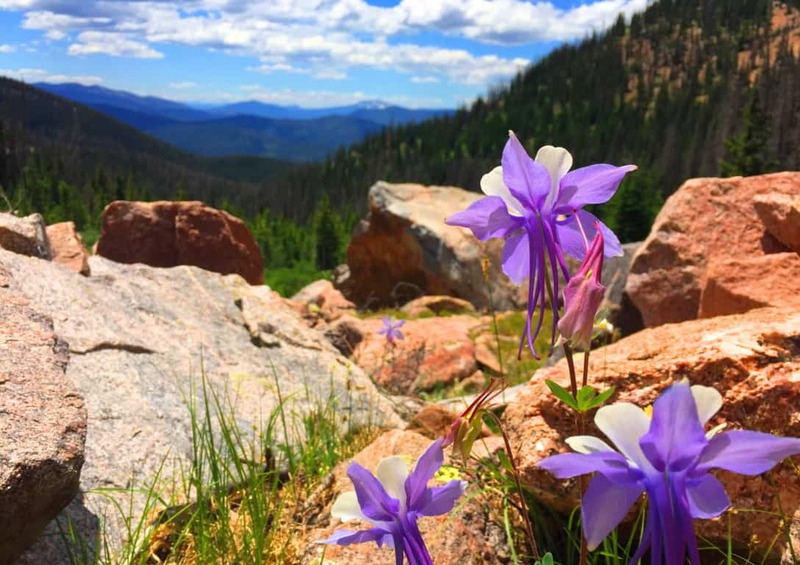 The wildflowers exude an overwhelming spectrum of statements, where entire mountain glens are covered in violet, steel-blue, glowing wild yellow, and subtle bits of auburn. (Image/Below) It is understandable if readers are still not sold on the idea of a Neolithic Culture in the heights of these mountains. To some people they might see a mere stone where there is an actual cultural statement. 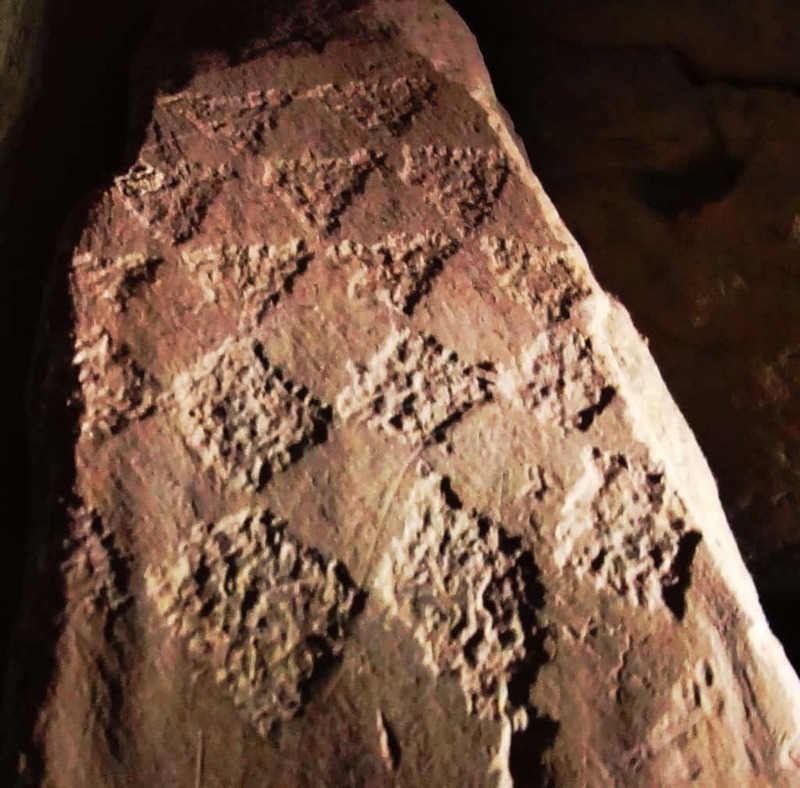 It has taken six years of challenging research in some of the most off-the-grid locations on earth to finally begin to see the patterns of a very real Neolithic Culture. Only after dozens of expeditions have the specific memes begun to reveal themselves. It is not just the evidence itself, but the context of the evidence: the position of a stone in a particular way in a valley; the paring of stone statements in not just one valley, but dozens. There is a very real consistency. It is hard to tell if the Standing Stone here at Clark Peak was there before the rockslide, and was later engulfed by the rush of stone, or if it was placed squarely into the stones after the fact? But the most important, and truly obvious thing, is that there is no other stone even remotely like it in the entire basin, which is what I mean by context. 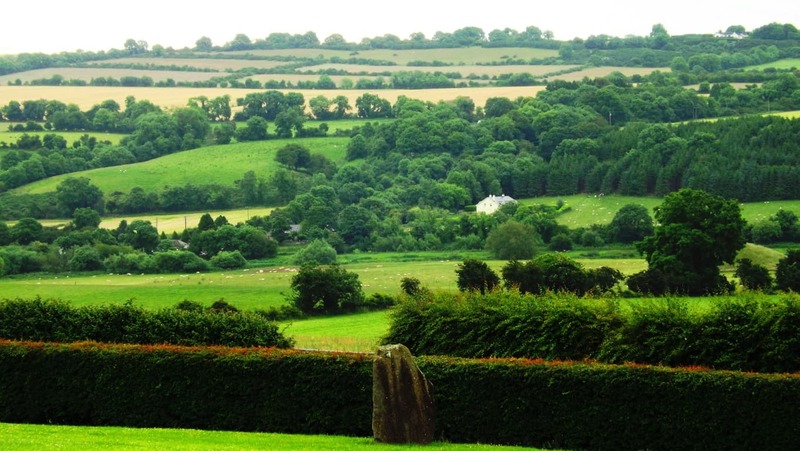 And moreover, the place where it stands, like so many other Standing Stones across the world, is most likely the most advantageous, as well as beautiful, vantage on the entire valley; it’s as if someone wanted to claim the best of what the valley had to offer. I’ve seen this in literally dozens of mountain ranges. The overall point is that hiking and ‘striding’ will take YOU there. You can go and size up the strangeness of these megaliths for YOURSELF. You don’t need my opinion, you can get there and judge on your own! When you do I believe the realness of these statement will hit you….will make it real. Clark Peak, from the second level trail-head, is one of the single most relaxing and cool hikes in the entire world.The reward in this place far outweighs the work, which is not usually the case for international hiking. Aside from the evidence, there is also that feeling of total tranquility in the Colorado heights, a feeling in all honesty, I have only felt once before in my life, ironically, by the Standing Stone in Wales, at the top of the gorgeous Conwy Valley. At Conwy, a Standing Stone and a Cairn both sit atop the heights, just like in this gorgeous basin in Colorado, paired together like a chair and table, but in an ancient-stone kind of way. 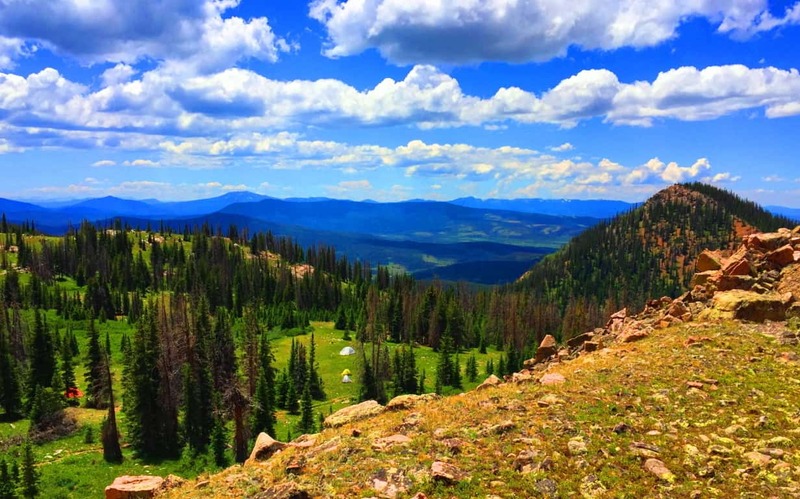 So… plan a week or so at the cottages of the tiny American hamlet of Walden Colorado. 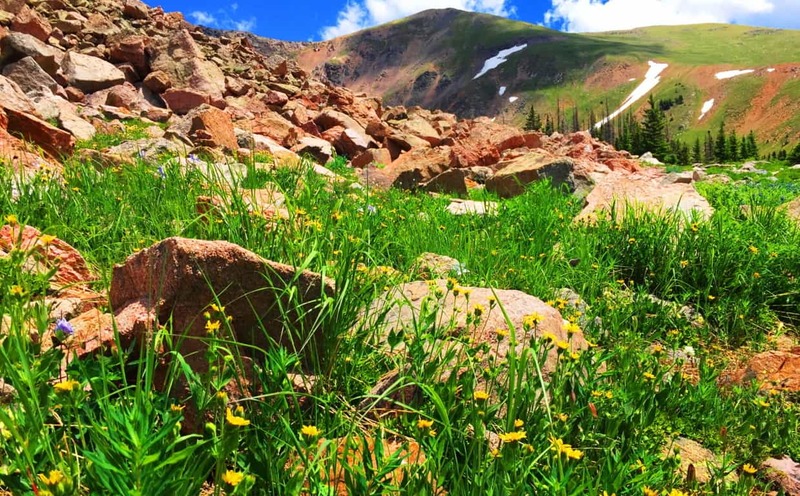 Take the time to do what it takes to get to the trailheads for Clark Peak, which sits at the eastern edge of Medicine Bow National Park, one of the most scintillated and stellar National Parks on Earth. Find your way, and the way, amazingly, will find you. Go strong. A special thanks to my great friend and confidant Christopher Frohlich for providing his style, skill, and understanding of the grand Colorado landscape. Couldn’t have done this without you Fro’, thank you. Note: Half a world away from the ancient Celtic Ranges, where Standing Stones guard the mythical heights of Wales, Ireland, Scotland, and England, are the epic mountains of the American West. Among the vast options of the grand natural spaces that dominate northern California, Montana, Oregon, and Colorado, are the mysterious high Ranges of Arizona. 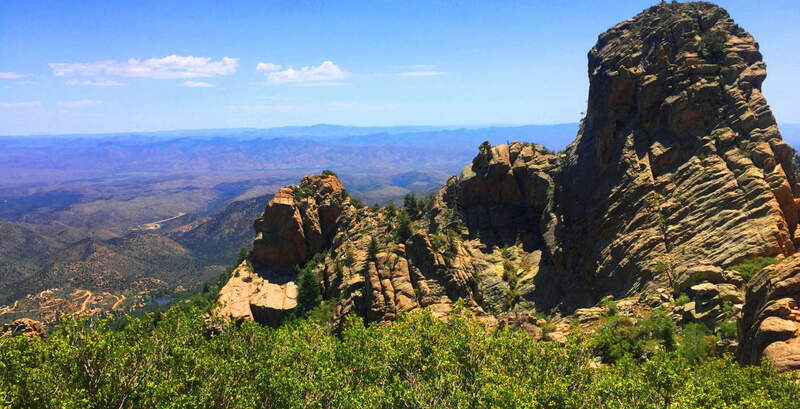 The Hulapai Range is a few miles south-east of Kingman Arizona. 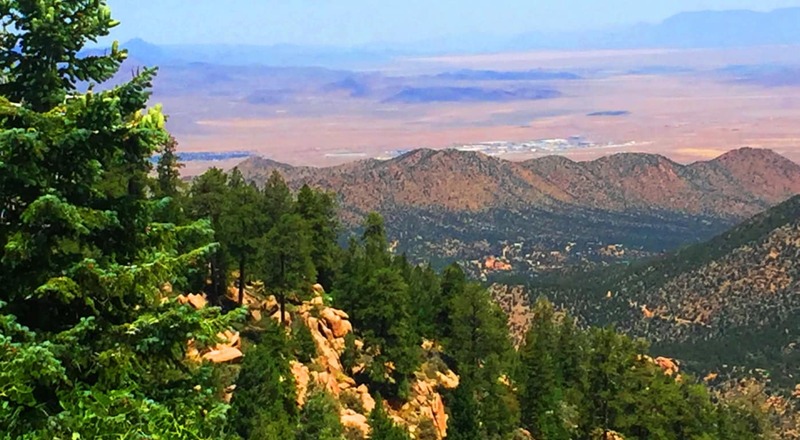 From Kingman you will take the ‘Hulapai Mountain Road’ straight into the heart of the Range, climbing slowly upward into a set of elevations that look like an American Mount Sinai. The comparison is a good one. The air here is absolutely void of humidity. With temperatures that climb up to 116 degrees in July, the trees, some half burnt, radiate a charcoal scent which carries on the wind; and you can taste that scent on the back of your tongue. Amazingly, there are some similarities to Celtic mountain ranges here, if you have the right perspective. 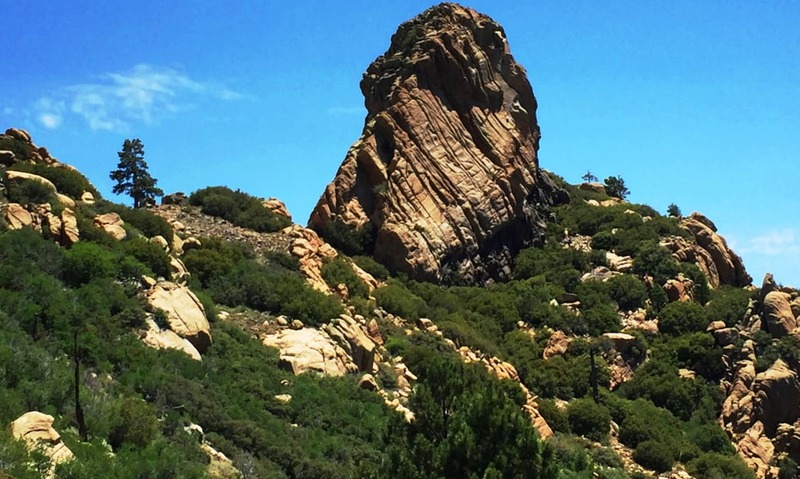 There are other-worldly rock fixtures, free standing boulders that stack the mountainside, and an amazing magical stone near the peak, which you will see in this article. 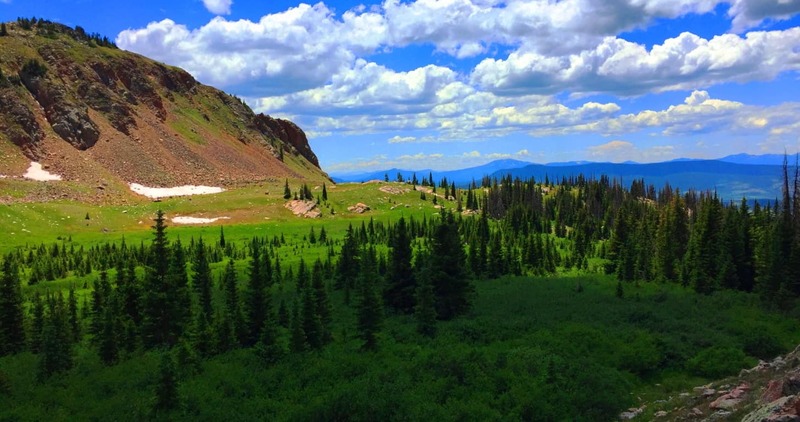 Aspen Peak Trail at Hulapai: As you approach the Range you will notice golden glades, not purely green zones. 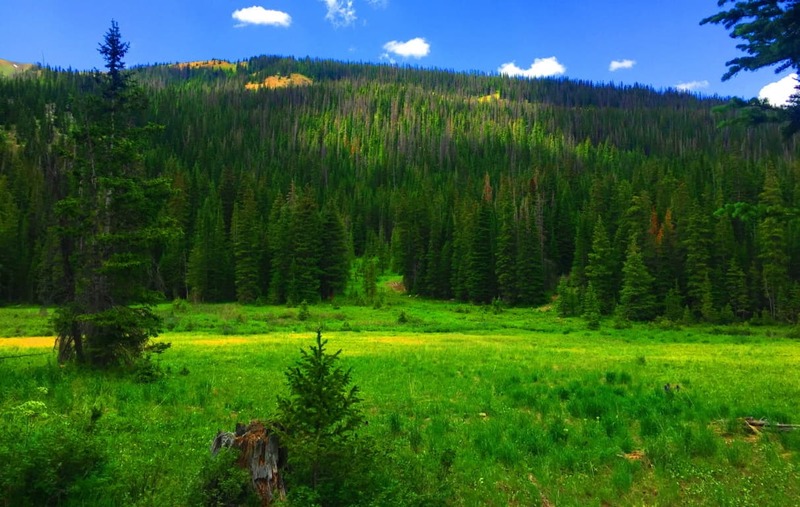 The bright Ponderosa forest at the belt of these mountains is spacious and inviting . In Celtic Ranges, the signs of the Neolithic Culture usually increase the further up you go. By this logic, if there is Neolithic cultural evidence at Hulapai, the highest peak would most likely yield the most evidence. 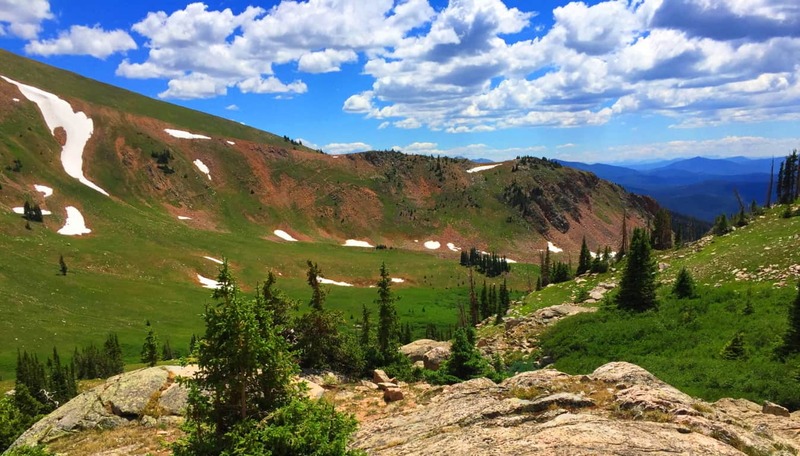 Aspen Peak is the highest vista in this range, and the focus of this hike. Make sure to bring at least 1.5 gallons of water along with a sports drink for necessary electrolyte/sugar replenishment. Ration your intake. Also bring an extra shirt due to perspiration, several granola bars/ carb eating options, including jellybeans for when you reach the peak. There are options for approaching Aspen Trail. There is a lower entry through the hills and woods off the Hulapai Mountain Road marked by a sign on the left, which is more of a challenge with an extra 1000 ft below the campground trailhead (and about 1.5 miles of extra trail through rocky glades and curiously rounded stones). If you want to cut that part of the approach off, you can make your way, by car, passing the Hulapai Ranger Station on the road, and then take the right onto the main campground, which is the more popular entry. After passing the numbered cottages and the RV’s in their designated areas, and you will see the marker for the ‘Aspen Trail’; here you will begin your challenge. Aspen Peak Trail’ is marked with signs on the way up, but remember on the way down to follow the signs that say “Campground” to get back. 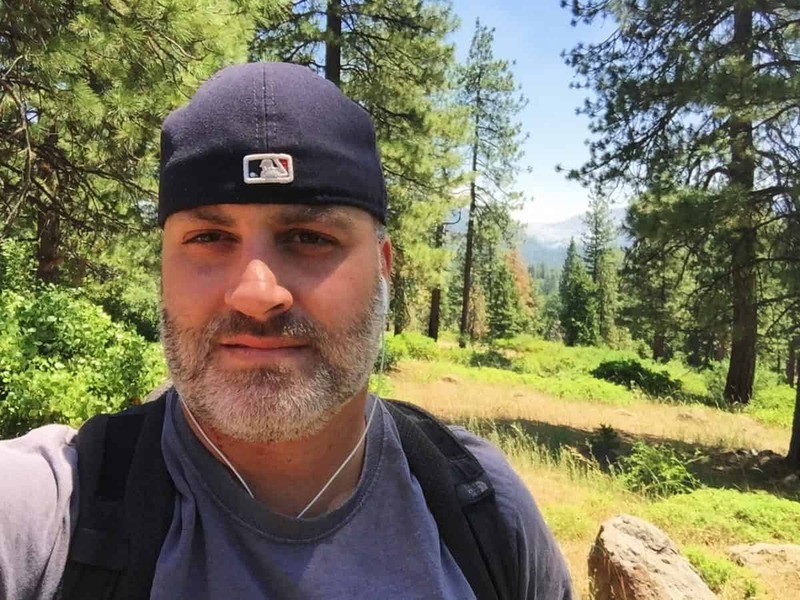 The first portion of Aspen Trail is a bold introduction to the Ponderosa Pine “vibe”. Dragonflies with a shiny blue armor orbit dazzling red cactus flowers beneath the forest. (Image/Left) This initial 1000 feet of incline is a winding set of switchbacks and vistas. The boulders here are rounded like leavened bread, adding a unique surreality to the openings in the glades, and there are hundreds of thousands of these rounded fixtures. How it is that these boulders came came to be rounded and stacked individually is hard to imagine. 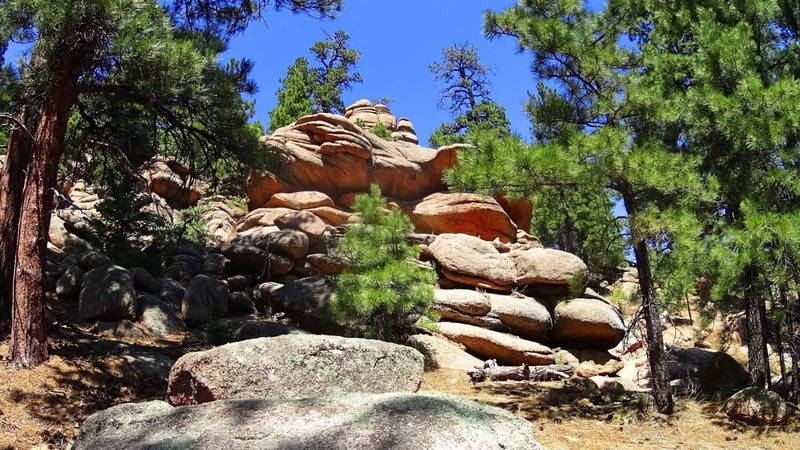 As you continue into the 1500 foot level of prominence you will come to the ridge which opens up on the northern view of Kingman and the overall desert plateau. It isn’t just the vastness of this view over the northern ridge, but the stillness that presides over the radiating gold that takes your breath away. 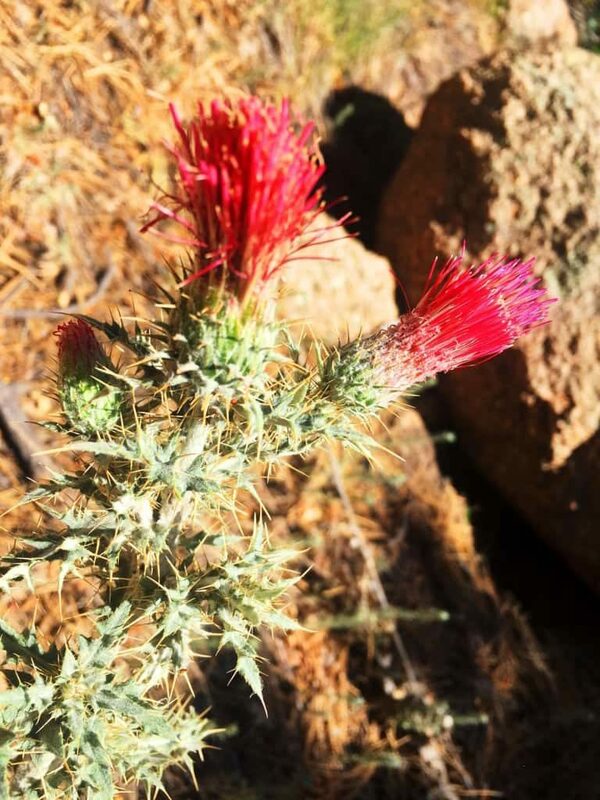 Arizona is like “spirituality that happens at a glance”; there’s truly an underlying force that imposes an evolved slowness over everything; it’s the ‘un-rushed’ spirit that survives among the high desert winds. If you move too fast, you just won’t make it. Everything you see is whispering “Pace yourself, and take your time.” The land feels like natures assigned setting for prophecy, which is one hell of a calling card. From here something otherworldly happens. Just like in the Celtic heights of enchanted places like the Rowan Valley in Wales, where massive ‘cut’ stones just start to appear out of nowhere, Hulapai seems to support similar ancient stoneworks specifically in the advantageous heights, where anyone approaching would be seen for miles before arrival. 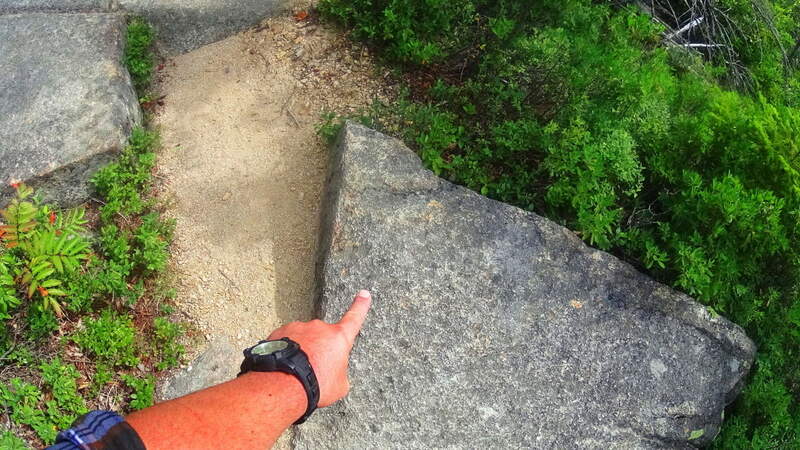 There are several stone-linings along the upper path. It is a good possibility that these stones were placed by the Neolithic culture, then supported by the Hulapai tribe, and reinforced in modern times. Clearly the area was sacred for someone if they were taking the time to create stones-works at 8000 feet, which is what we see here. 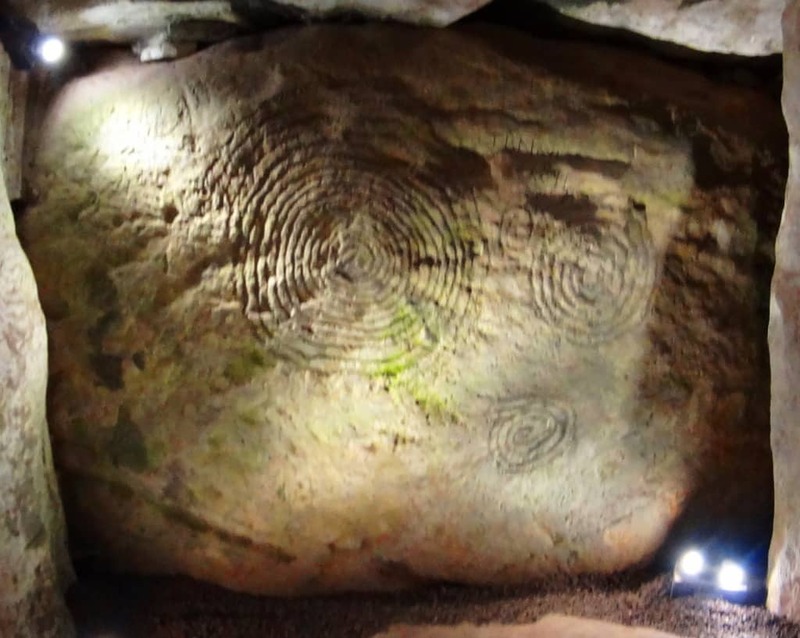 In Celtic elevations, often times when you find stone-linings that begins to announce a sacred zone, there is a singular solitary statement monumentalizing that sacredness. It is beyond astonishing that as you travel a little further along this last 200 yards of trail you will find a single Standing Stone unlike any of the other hundreds-of-thousands of rounded stones you’ve passed. 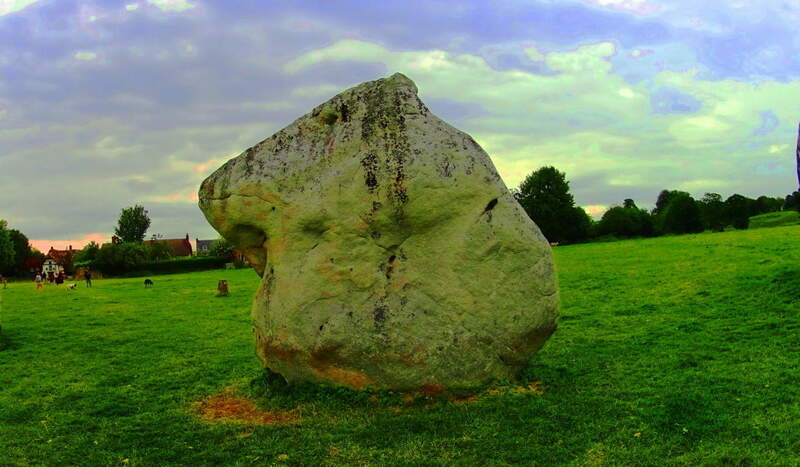 The Standing Stone is cut abruptly on the top, with a a right angle cut into its right side. It stands about 6 feet high, with an absolutely flat-cut face, like a table standing up at about 4 inches in width. 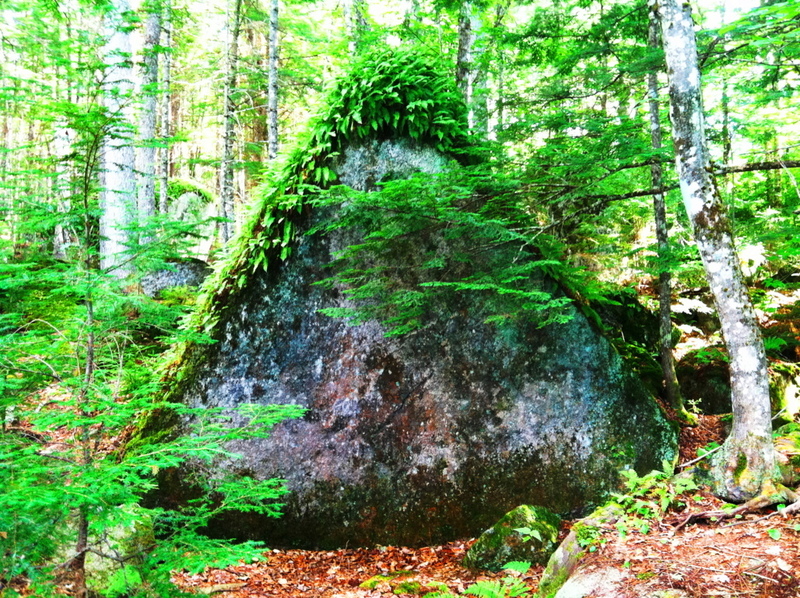 It is totally opposite the rounded features of the common boulders here, in every possible way; and it faces the peak. This Standing Stone is most likely one of the oldest sociological statements in all of Arizona, among hundreds of such statements. If it is related to the Neolithic culture of ancient Celtic places, then this stone is no less than 4000 to 6000 years old. It is truly priceless. It might very well be that this is what is known as a ‘Solar Stone’, marking mid-day on this mountain for eternity. 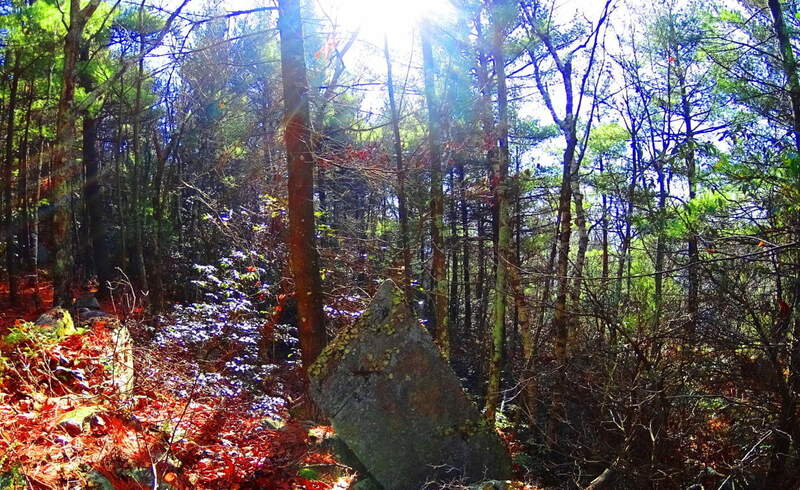 ‘Solar Stones’ appear in Celtic highlands, as well as the New England mountains. It is no mistake that from here you can follow the last portion of Aspen Trail towards a grand monolithic peak laid out dramatically before you. Continue towards this massive pinnacle to make the dramatic Aspen Peak. 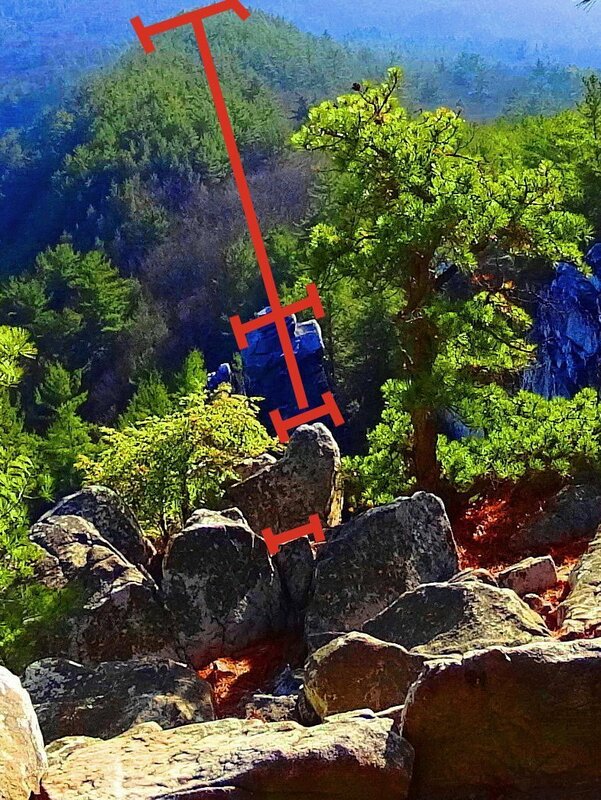 Even looking at the rock features in this uppermost area, you will see that there is not a single stone cut with right angles at the top and sides, like the Standing Stone that marks the upper trail. At the peak you are able to see a beautiful northern desert plateau. At this point you are 8,417 feet above Sea-level. Aspen Trail at Hulapai is a spiritual challenge. You will have to put aside your usual hiking tendencies and regular comforts. Plan carefully. This is a stellar place. There are deer running through the forest below, and a high wind rushing over the desert; it may carry all the way to the Pacific Ocean in California! The Peak here is like an epic guard tower for the entirety of the ‘American West’; Hulapai being on the western edge of the mountain ranges of Arizona, which continue all the way up to the Rockies of Colorado at its eastern edge. 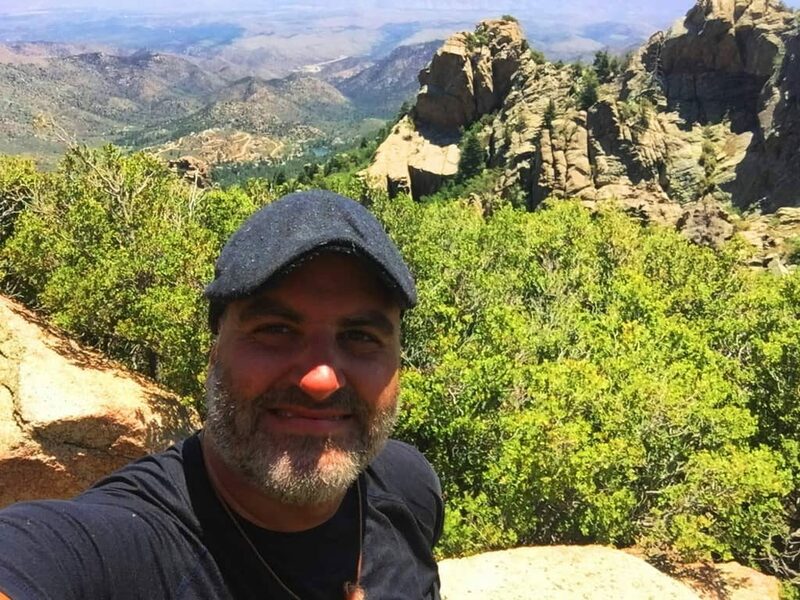 The wonders that exist deeper into the Arizona interior are astoundingly worthy of such a “tower”, where the ancients once dwelled, high above the world. Just let it all sink in. 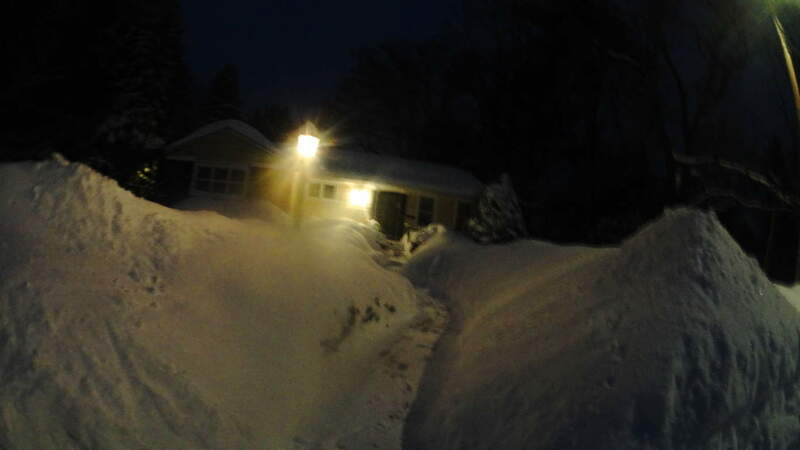 Note: During the winter of 2014 in New England, 107.6 inches of snow fell around Boston. An Arctic weather system blasted the entire east coast of the United States for six months straight. Temperatures dropped to an average of 30 degrees, and many times as low as -14. Massachusetts declared a state of emergency. Public transportation and public schools were closed. Piles of snow reached 15 feet high on every street corner, and the snow was level with the windows. It was grey and dark everyday. It was a full Arctic winter. Take a look at my home in this picture. Finding things to do inside became a real challenge. Reading is healthy but can get boring after a few hours each evening. Going on-line is fun, but it can give you a headache after extended periods as well. As the winter reached it’s peak in late January, I was going snow-blind, and stir crazy. I had become so accustomed to seeing bright-white literally everywhere, that my depth perception was completely blurry. I realized I needed to find something fun to do inside, something that involved bright colors, as crazy as that sounds. I went to Best Buy to find something playful to do. At the entrance, as if literally waiting for me, was a large poster of what I felt, at that particularly color-starved moment, was the most beautiful landscape I had ever seen. I was completely blown away. I asked the attendant about the poster. He told me that the landscape was from an Xbox ‘quest game’ called Skyrim. He told me the game was a ‘universe of landscapes’ to explore. I spent $550 as if it was 50 cents, and walked out of the store in less than three minutes with a new Xbox, and a single game, Skyrim. The Birth of Stonestrider: I went home and played the game. 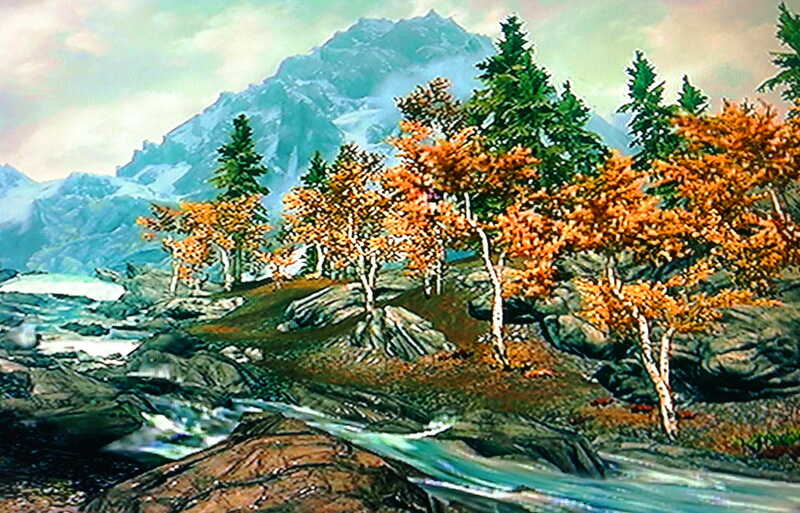 It was a Celtic fantasy ‘quest game’, with an epic interactive landscape. At this point in my life I had yet to even think of going to Celtic places, but as I played the game I began to wonder what it would be like. I am a college educated person. I have a Degree in Western Literature. I had read the essential Celtic myths, inclusive of Beowulf, Mallory’s Le Morte d’Artur, Gawain and The Green Knight, and Tolkien’s masterpiece novel The Lord of The Rings, and yet for some reason I had never galvanized my thoughts about the myths of Celtic places, and how much of it might be true. 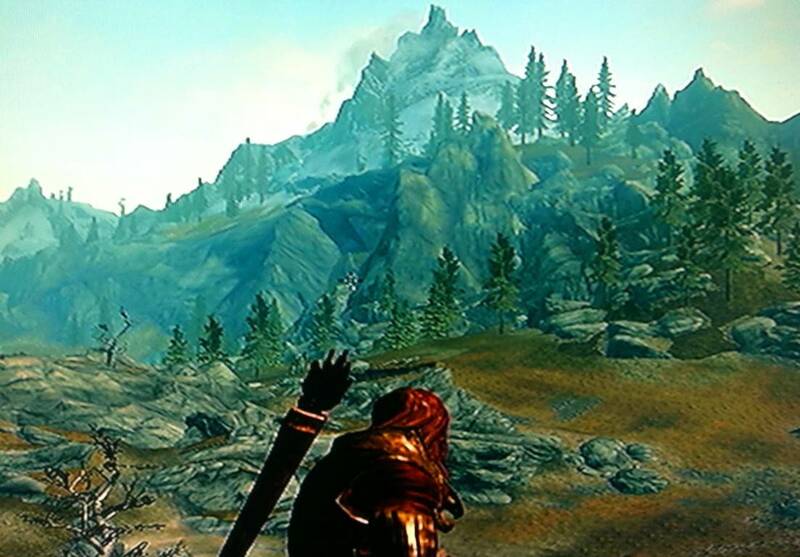 The range of subject matter in Skyrim is awe inspiring. It was obvious to me that the writers of this game did an incredible amount of research regarding Celtic myths. But the Skyrim writers went one step further and made cultural connections about mythical subjects that historians and anthropologists were embarrassed to talk about. 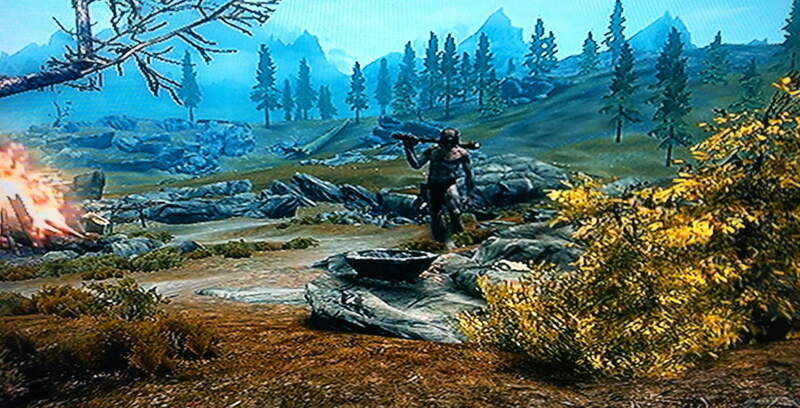 For instance, standing stones and free-sitting boulders in Skyrim were not placed at random, presumably from glacial displacement, but were found in places specifically designated by a culture. Those designated spaces were inhabited by giants. Where did Skyrim get that idea from? Certainly not from academic history, although religious history texts have an abundance of content about giants. 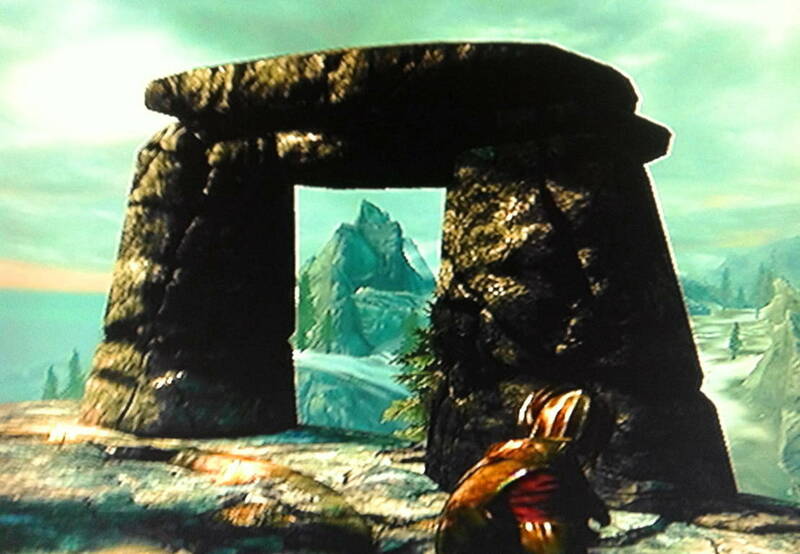 In Skyrim there are Dolmens, Standing Stones, Cairns, Free-Sitting Boulders, and Stone-Circles, all inhabited by giants, most of which also contain astrological significance. Suddenly Astrology, History, and Anthropology were ignited in my thoughts. It seemed to me that the designers of this game were signaling something to us, saying “wake up people, something amazing happened in the world once”. They had made a seamlessly logical scenario out of the Celtic universe, the ancient and half-forgotten world that we have only guessed at in this late phase of history. I began to wonder if these themes were really out there, in the actual world. If the Megaliths were cultural, then nobody could’ve moved them. I would just have to find them if I could. And that was my epiphany. I decided that when the snow melted, and the Spring finally came, I would go on my own real-time quest to find the Megalithic culture. Stonestrider.com would be born. My life has never been the same. I would like to use this post to just express some of the similarities between the game, and what I found in real time. 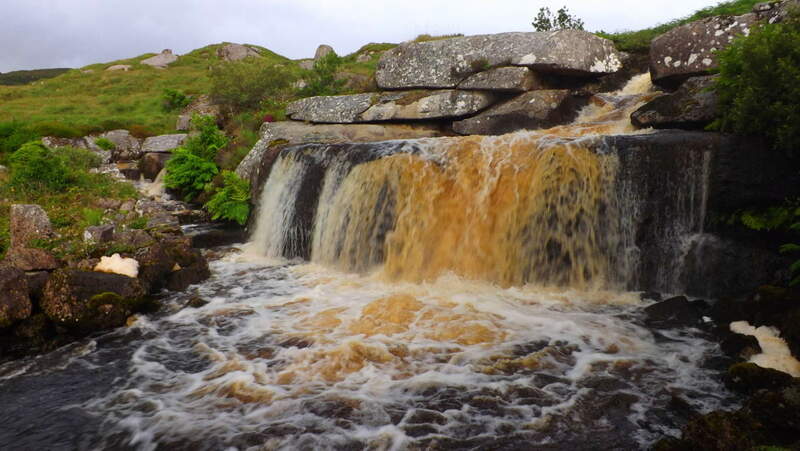 Waterfalls: Take a look at this waterfall I came across in the town of Mullaghduff, in Donegal, Ireland. It was totally untouched. No trails, signs, or markers of any kind. As far as I could tell, this Celtic waterfall was in its original state. More fantastic for me were the stones around the main Fall, which seemed curved, and cut, specifically into place, with smoothed arches and right angles actually hanging over the water. I couldn’t see how this configuration of stones would occur naturally. Look also to the left of the main Fall, there is a completely separate stone-cut path with beautifully crafted steps funneling the water. The level elevated bedrock of the main flow of water, combined with the crafted stones which are clearly curved and fitted above it, along with the separate funnel on the left, makes this seem like an engineered area, not a glacial miracle. That’s what I believe this is, an engineered waterway. 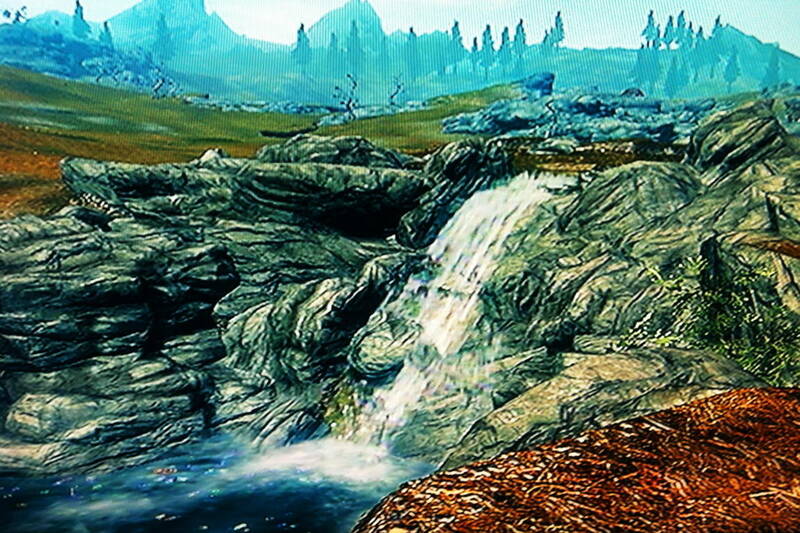 There are also free-standing boulders that look more like markers heading progressively up the mountain directly beyond this waterway, which makes the area a prime candidate for an ancient Celtic, megalithically cultural center, just like what Skyrim depicts in the game. What’s even more interesting, is that this very real waterfall in Mullaghduff has more mysterious components to it than this very fictional waterfall in Skyrim. The main similarity between the two waterfalls is that they both focus on the idea that the water is centered and flowing through a specific, and elevated, rocky precipice, while otherwise surrounded by gorgeous grassy brush and hilly topography beyond. It’s as if both scenes are trying to tell us that something special happens at the rocky points of water-flow. Mountain Streams: Here is a look at a mountain stream headed towards a Celtic alter in the heights of the Black Valley in the southern portion of Killarney National Park, Ireland. 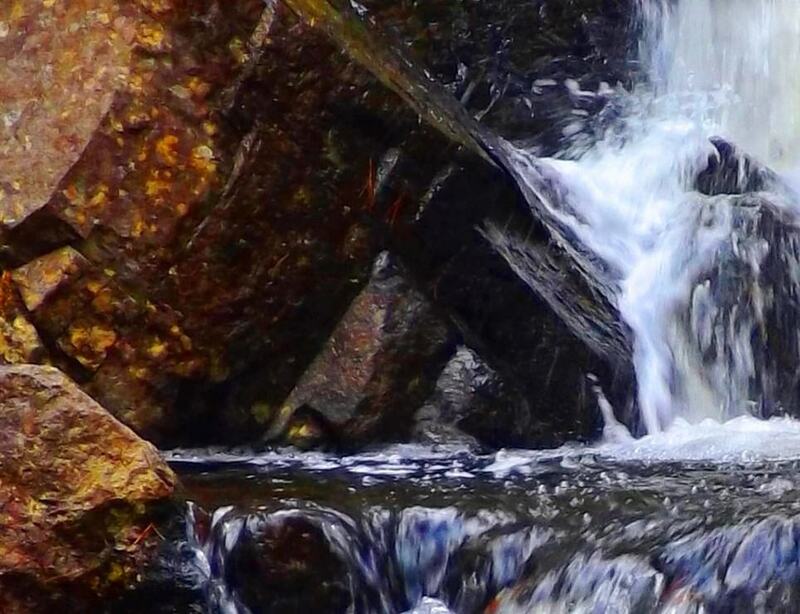 Take a look at the stones on the outer edge of the run of the water. The stones are not rounded, but they’re cut distinctly, seemingly directing the water in a funnel towards the center. The most obvious example is the largest stone in the center of this image; it is clearly cut, and with the directional purpose of funneling the water inward. I would also like to point out, that if you were to follow this stream up the mountain, you will come to a massive cut alter, with Celtic rings etched in its side. 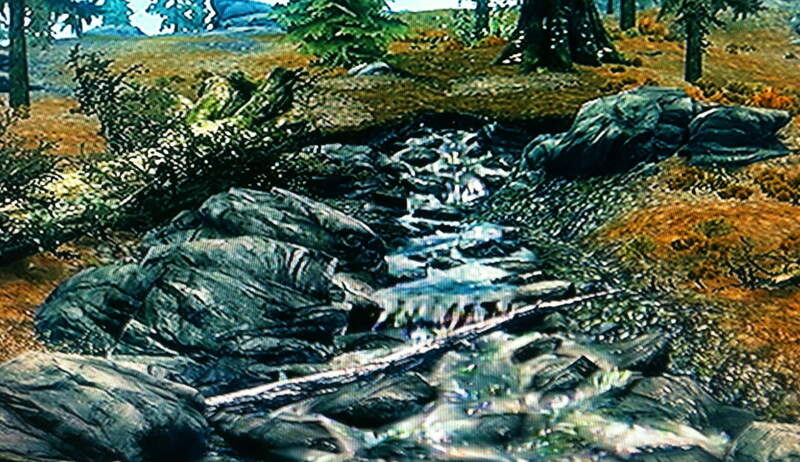 In Skyrim there are waterways that appear in the elevations, and they follow the flow of specifically dotted stone paths. I really feel that the game’s engineers noticed the stony designation of Celtic waterways. Whether or not they knew that the real life waterways were in many instances engineered, is for us to decide. 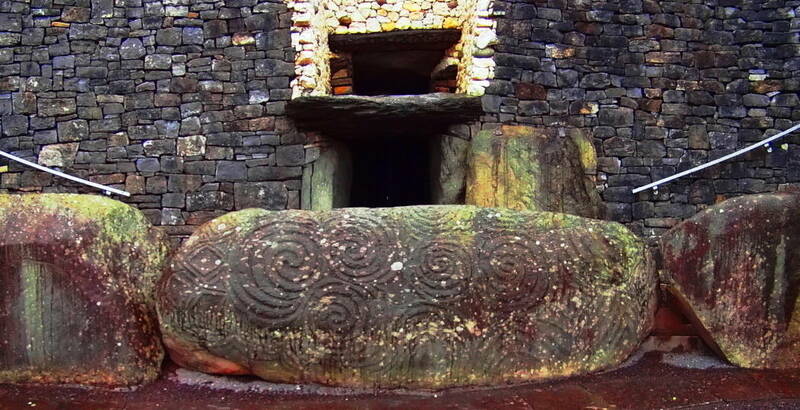 Celtic Rings in Stone: Here is a look at the alter to be found at the top of the mountain stream in the Black Valley in Killarney. The rings cut into it are smooth and perfectly concentric, and hardly look like the work of a chisel at all. The rings are thousands of years old and hard to see now, shown just below center of the right slab, if you look close. It is clear that this slab was carved into linear sections, and ‘squared’. Even more incredible is that its location is near the top of a mountain. None of the other stones near by look even remotely like this. One last thing to take note of in this scene is that these slabs seem to be facing directly towards the central feature of the valley beyond, which is the beautiful lake Brinn, splitting the two mountains. 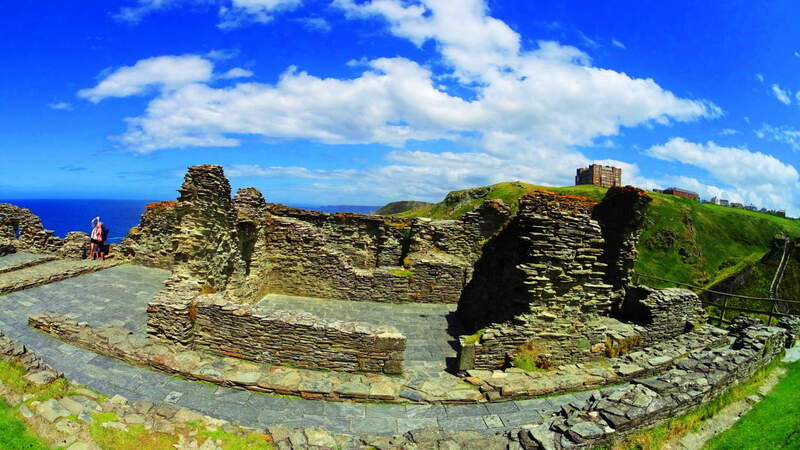 There is just so much to consider when looking at Celtic ruins. It seems to me that they are far more than primitive markings. There is meaning in the direction in which stones face, what they depict, and where they are found. All of this is far from primitive, it’s actually elegant. Now here is a view of a squared stone slab with semi-concentric rings on its face in Skyrim. Yet again, the more amazing and mysterious stone, is actually the real one. Free Sitting Boulders: I am sure that there are boulders that have been moved by glaciers. But I am equally sure that there are boulders that have not been moved by glaciers. 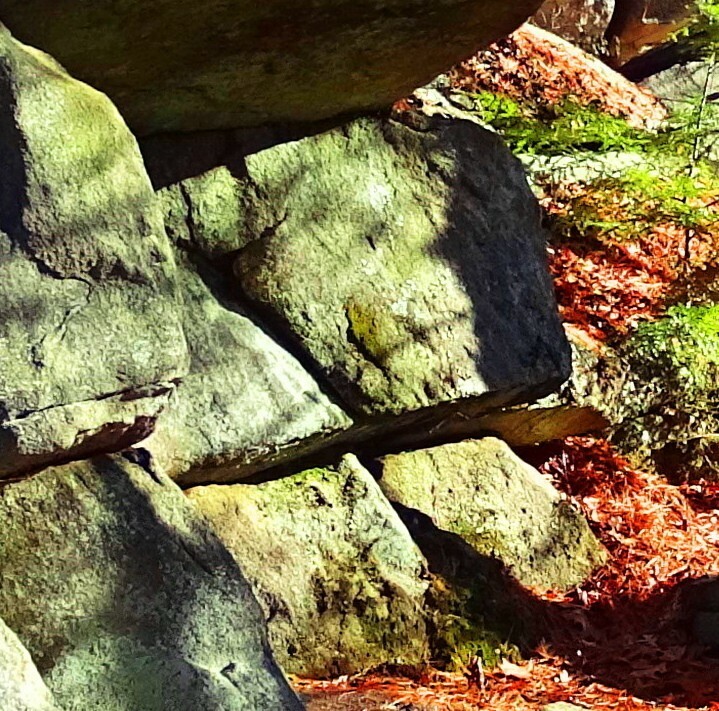 Free-sitting-boulders can most often be found guarding areas where sacred Dolmens or Wedge Tombs are directly near by. Here is an example of a free-sitting-boulder that I came across placed 30 yards from the incredible Wedge Tomb at Cavan Burren National Park in Ireland (Image on Right, click on it to look closer/Additionally, at this Wedge Tomb, are three stone-linings all converging directly on it/the linings are energy transfers, not walls). I am absolutely certain that this boulder was placed here as a marker to display the area as ‘occupied’. I imagine that this was a fair warning, a way of saying, “if you cross this massive marker, you will have to deal with the individual who is strong enough to put this here”. Notice how the boulder is placed exactly over another granite face below it. Scientists want us to believe that this boulder came to rest exactly on top of this other rock face beneath it, moved at random by glacial displacement? The odds are beyond gastronomical. I’m sorry, but no. 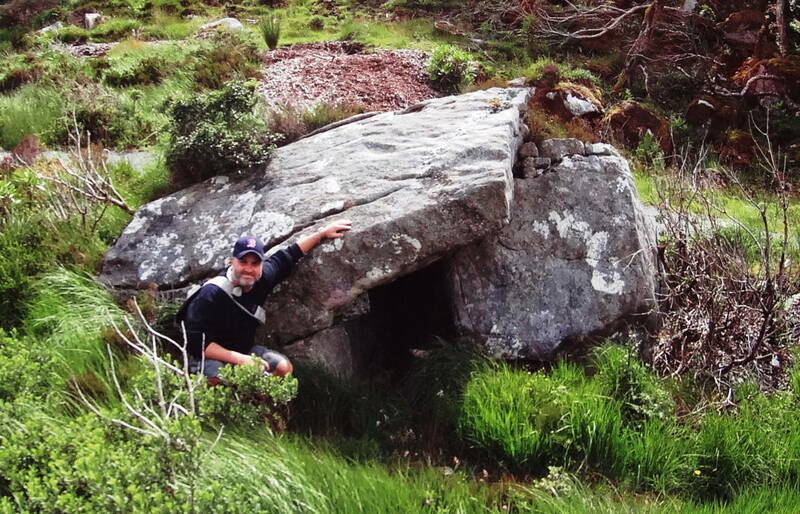 This is a megalithic cultural statement, a boundary, near a Wedge Tomb. Here is the equivalent in Skyrim. 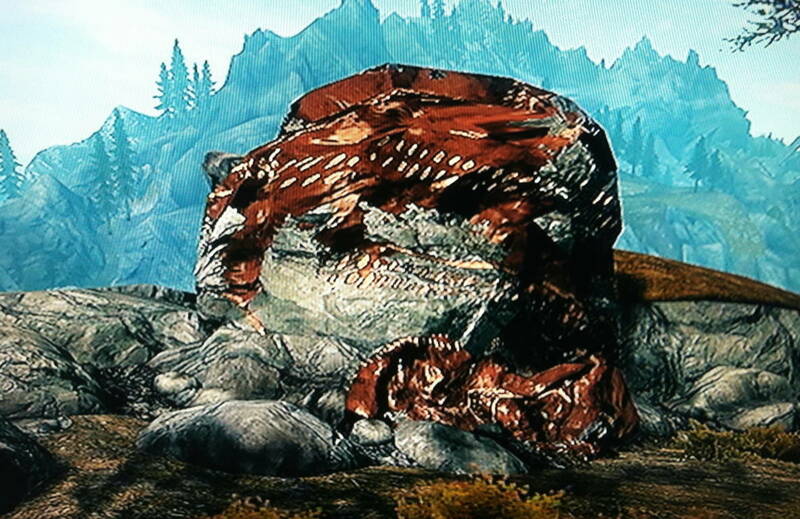 This free sitting boulder is directly on the edge of a Cairn inhabited by giants in the game. It becomes increasingly clear that the Skyrim writers know something the general population has yet to imagine possible, or has perhaps forgotten. 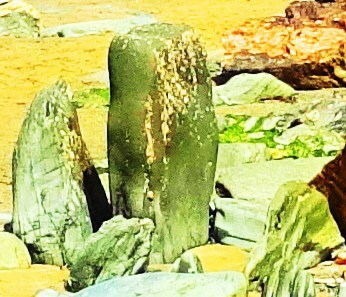 Standing Stones: The simple wonder of standing stones can move you. Here is an 8 foot standing stone in the heights of the Conwy Valley, Wales. Again, this stone weighs at least two tons. Moving this, and to such an elevation from the valley below, would seem crazy by human standards. I believe this standing stone is another type of marker, placed by the individual(s) who wanted to live away from the common collectives of people down below, and it served as a warning to them. More compelling is the fact that this stone is 100 yards from beautiful Dolmen just down the Roman pathway. 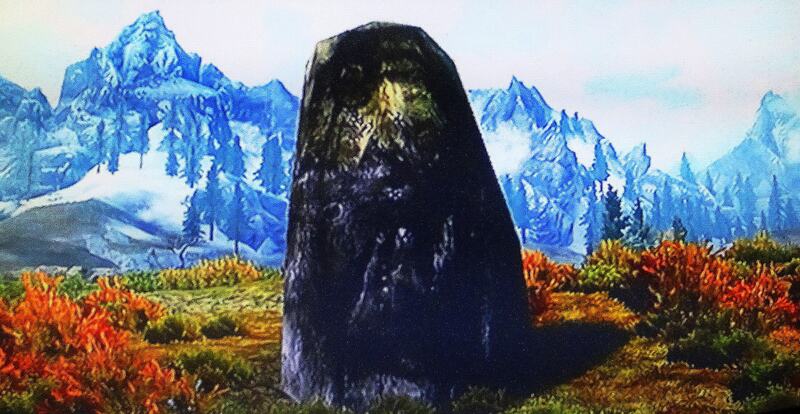 Here is an image of a nice standing stone in Skyrim with what looks like similar dynamics. 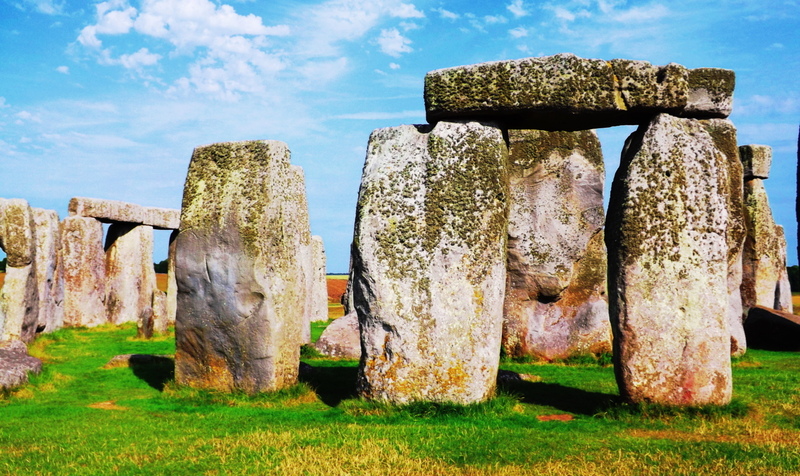 Stacked and level megaliths: The most obvious and famous example of stacked and level megaliths is Stonehenge. 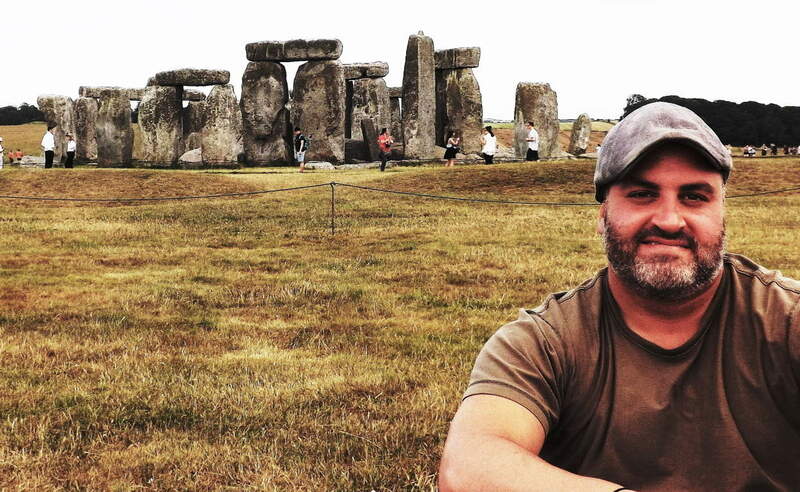 The mystery of Stonehenge is one of the most important and fascinating in the world. There is so much that goes into creating sections like these, including grand notches that are cut and fit to be fixed into place like Jurassic Legos. To do this with sarsen stone, the hardest stone in the world, is almost inconceivable for a primitive culture at the start of history. Here is a look at just one section of Stonehenge. 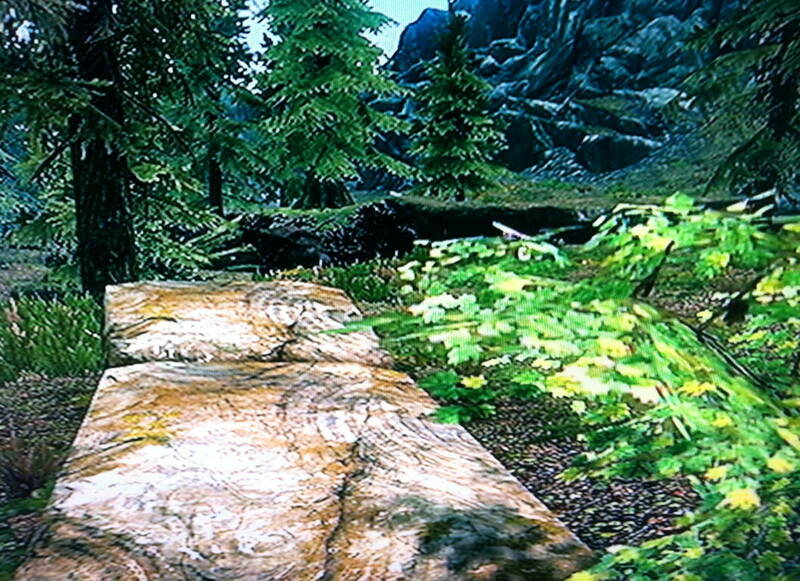 And here is a look at one section of an entrance to a cairn in Skyrim. Same proportions. Same idea. 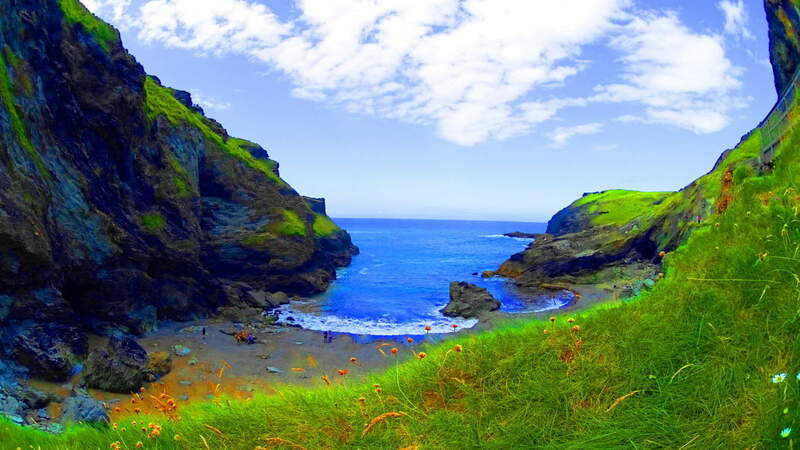 Amazing Natural Beauty: It is so important not to forget the natural beauty surrounding the mystery of Celtic culture. Mountains and valleys are simple and worthy reasons for celebration. I just want to mix and match some actual scenes that I was lucky enough to come across, with scenes from Skyrim below. 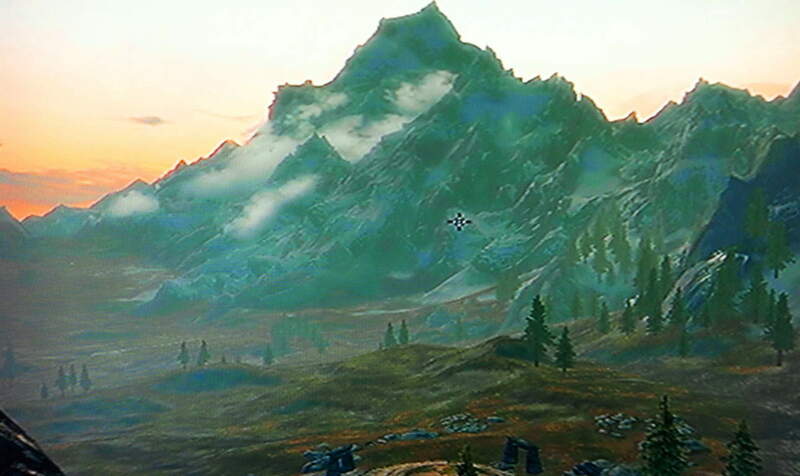 The fantastic images in Skyrim should inspire you to try to climb mountains and explore valleys, however distant from you. You can do it! Something tremendous is revealed when you get out and take a close look at wild natural spaces. 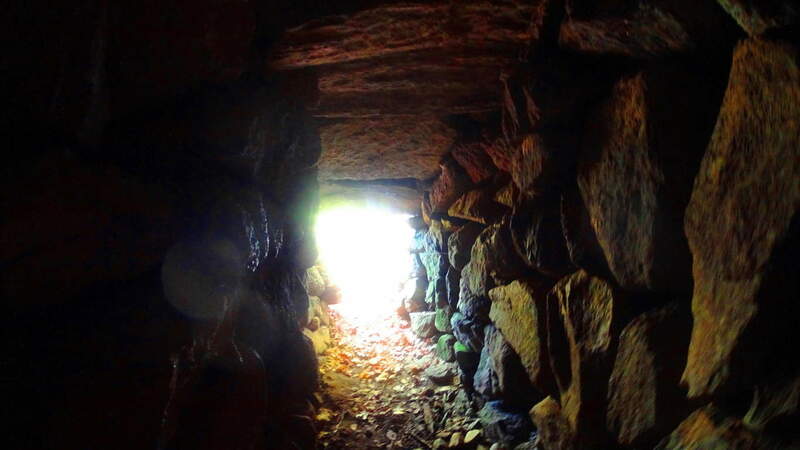 There is a hidden megalithic culture beneath us, and in some preserved places, totally visible. The Skyrim engineers have somehow put together a vision in their game that taps into the myths in a way that is almost signaling us, warning us, that there is more going on in this world than we are being told by commercial banks, governments, and people. I would like to thank the makers of Skyrim for inspiring me to think and wonder for myself just how much of what they are proposing might be true… ..which is far more than I would’ve known, had I not gone in search after the miserable winter of 2014. I will end this post with this statement: Biblical scriptures and the Dead Sea Scrolls speak of giants in the land, before, and after Noah. There are entire narratives dedicated to this premise about giants. “Seek and Find the Sacred” is not just a nifty cliche, its your personal invitation to understand the most mysterious and amazing things first hand, not relying on some other persons opinion, but developing your own. 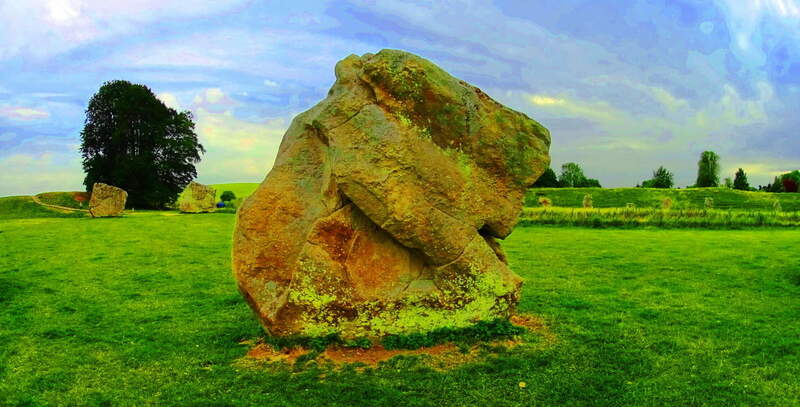 The megaliths are there, in dynamic positions, with symbols and angles, waiting to be understood. All of this takes place in a naturally beautiful, and often romantically distant places, far from the manic urban centers. You have nothing to lose by letting go, and going for it. I hope to see you out there. And however far out “out there” might be, the better. 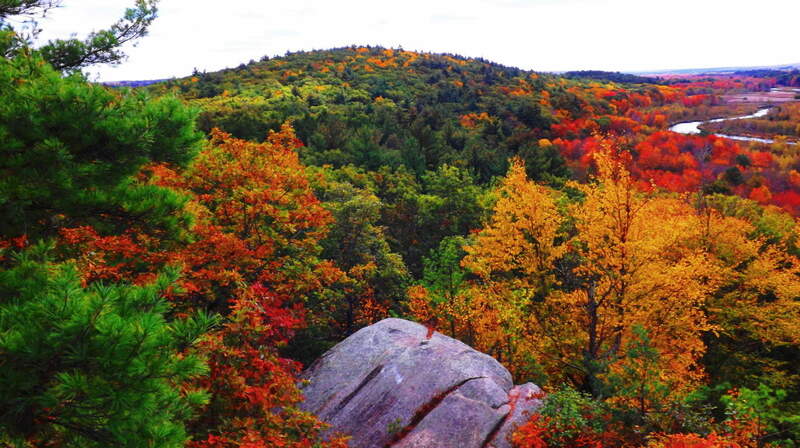 Note: Monument Mountain is a rare natural gem for Massachusetts. 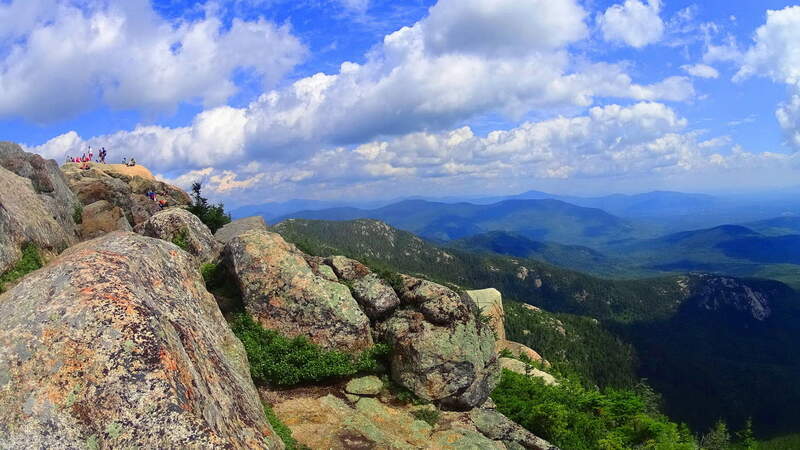 It is not connected to the rolling hills of eastern New England, but rather the beautiful Berkshire Mountain range, which runs through the southwest corner of Massachusetts, before continuing northwest into New York State. 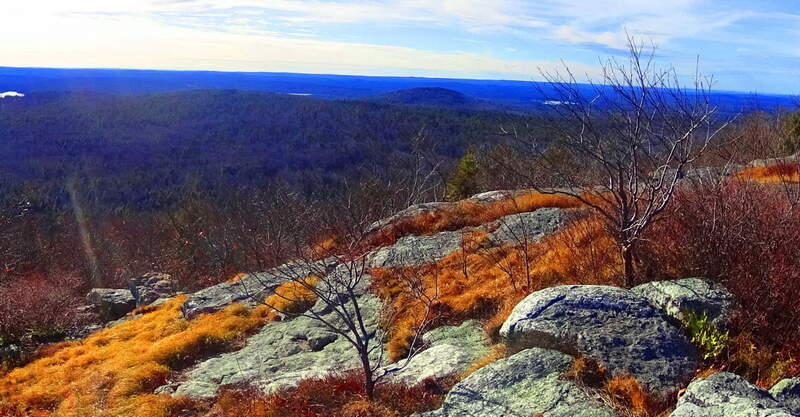 In early November the hillsides around Monument Mountain practically glow from the morning frost in the Sunrise, giving it a unique New England appeal… From top to bottom, massive shelves of white-quartzite line the mountainside, with jagged cliffs looming hundreds of feet above the trails, leading to what is known as ‘Squaw-Peak’. 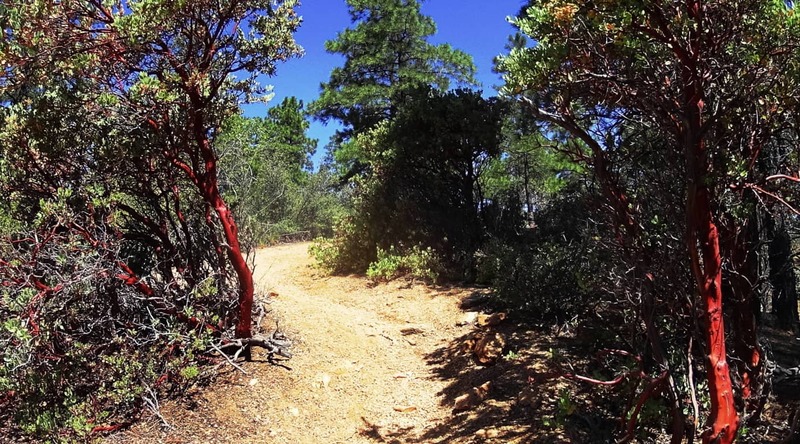 Alternative trails are known as “Indian Monument, and”Hickey Trail”, but are both essentially part of the same loop leading to Squaw Peak. 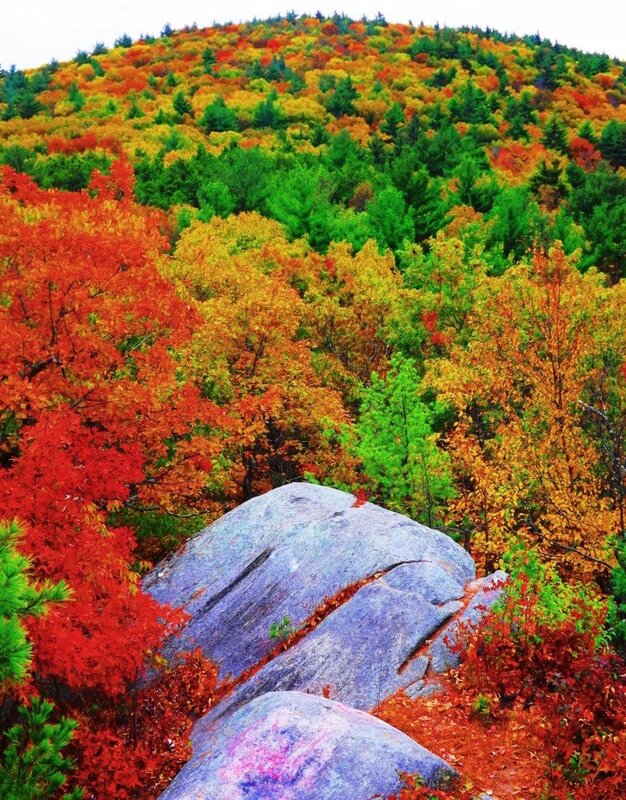 As hard as it might be to believe, this is the Macchu Piccu of Massachusetts. The trails here lead through glades of old growth forest and quartzite glens. There are White Pines, Hemlocks, Maples, and Birches in the elevated areas, that change the feeling of the trail as you go. 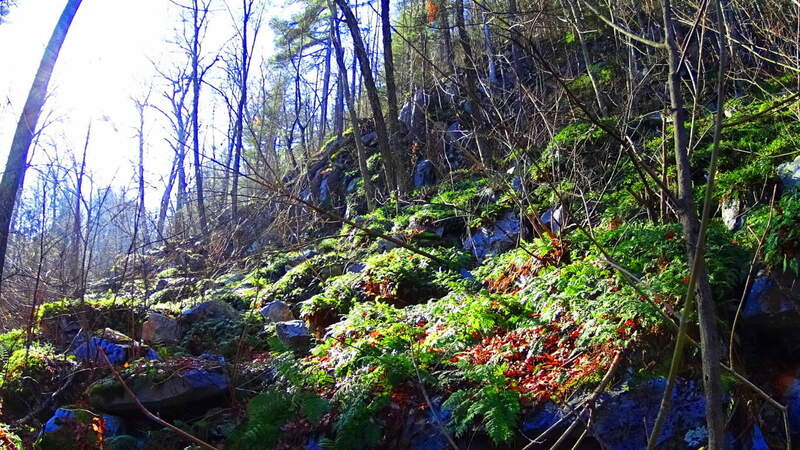 The forest is a barrage of overgrowth and ledges, with craggy shelves at every turn. Some fixtures were obviously toppled by a glacial game that was played over 10,500 years ago, while other stones do not seem random at all. 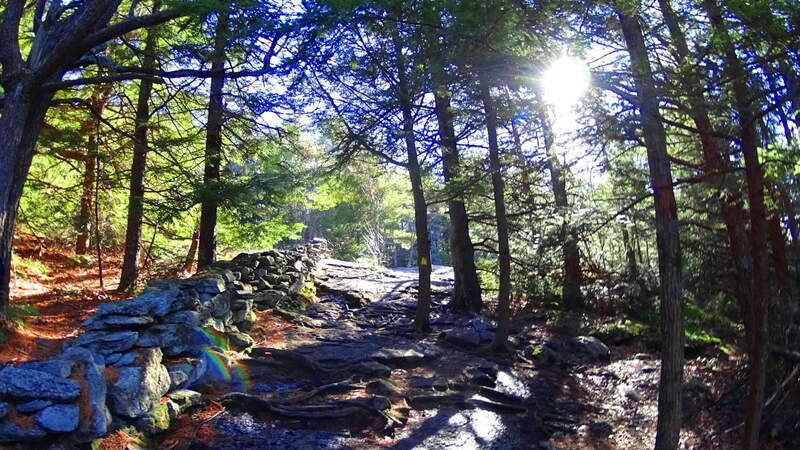 The Solar Stones: The initial trail runs through a glade of towering Pines for about a half mile. Soon you will encounter an incline in the path that will lead you into Birch groves, baby Pines, and stony footing. As the trail to Squaw Peak begins to elevate, there are stairs that are clearly cut out of the mountain, leading up to smooth rounded porches. On these porches are stones that have specific angular cuts that are pointing directly at the Sun at mid-day. 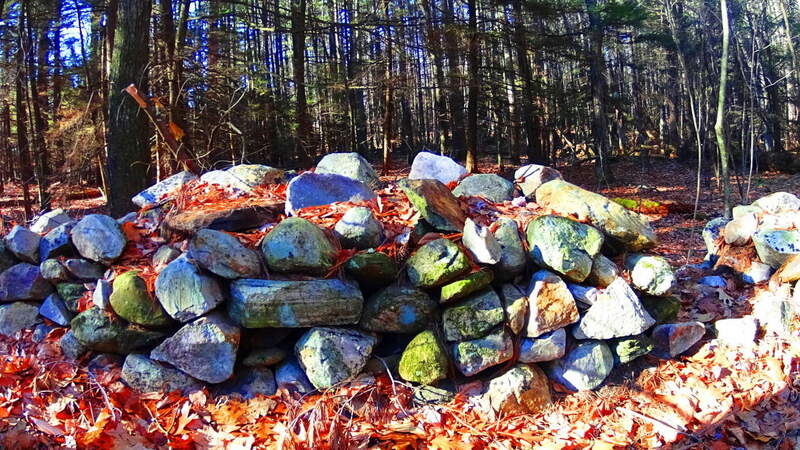 These stones appear at other sites in New England too. The image below is a prime example of the Solar Stone type at Monument Mountain, approaching Squaw Peak. 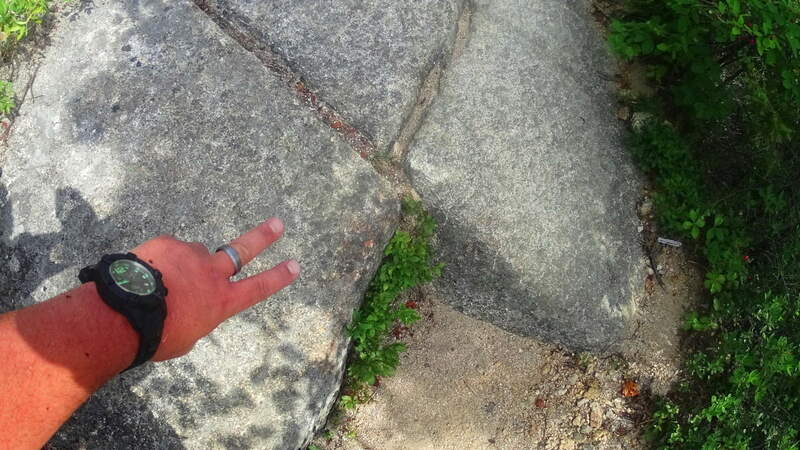 Before coming to Monument” I had found several stones that were cut exactly like this, shown below. I felt that if stones were cut specifically to be “pointing” at something significant, it would most likely be the Sun. So on this day at Monument Mountain I tested my theory. I climbed to reach Squaw Peak just before Noon, and using this method I came across this exact stone, which points directly at the Sun at Noon. These are the moments that hikers live for. Trail features become both an exploration into natural beauty, and anthropological. Standing there, as the Sun was directly above this stone, I felt as if I was momentarily peeking through a keyhole connected to a culture from the beginning of Time. The “Solar Stones” geometry is essentially: a single long-side leading up to a 45 degree angle, which is then cut, creating an arrow head, or apex, pointing straight up; Then the cut goes back down 45 degrees, to a shorter side, which runs parallel to the long side. These cuts are made in solid granite. Take a look below… If this were the only stone that I had seen like this, then I would hesitate to publish it here, but I offer some other examples of beautifully cut Solar Stones with the exact same angles and features. 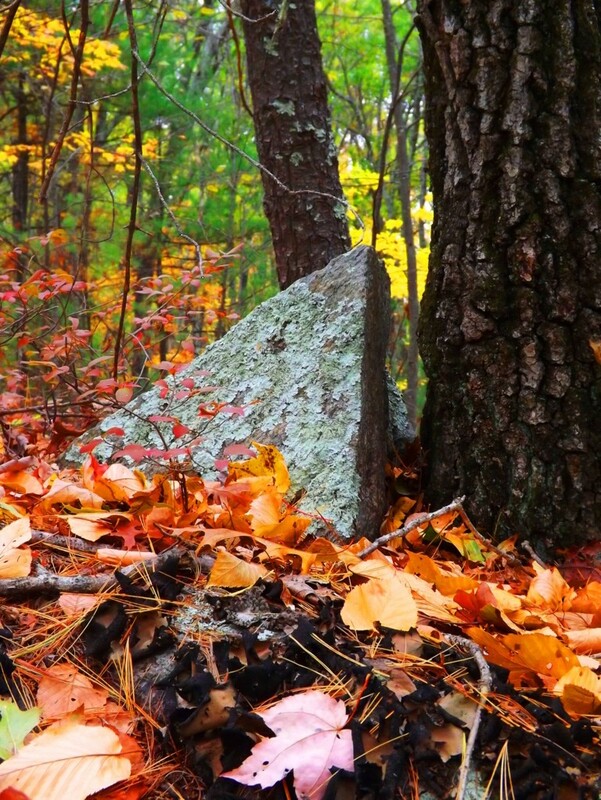 This Solar Stone pictured above is located near one of the most significant “Celtic style” alter’s in New England: the Heath Alter, of Massachusetts. 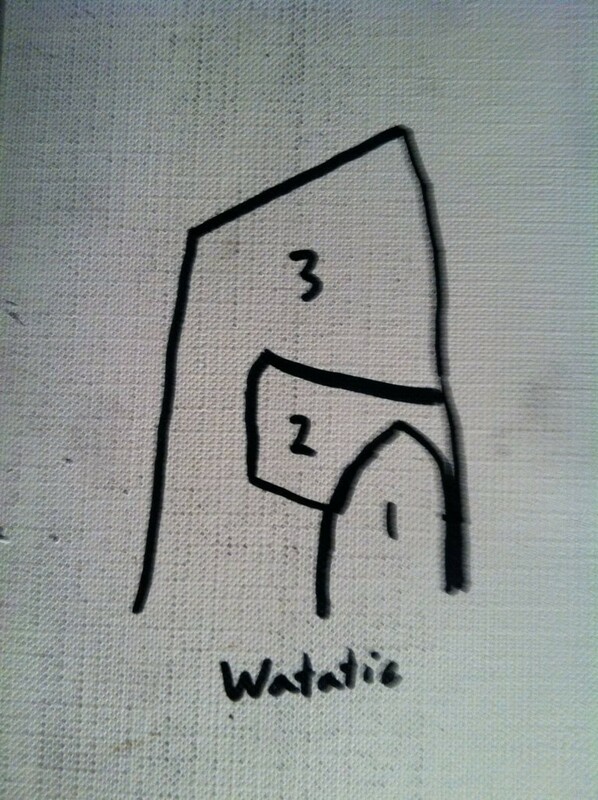 Notice the identical angles. Here again is a Solar Stone with the exact same measurements at a different location. We can at least conclude that whoever created these stones had a sense of ‘symbolism’, which in this case, was to convey how important they felt the Sun was, and that they were very much in tune with its properties. As you continue hiking along, the elevated stone porches emerge (image above) which head directly towards Squaw Peak. Your first clearing will arrive facing north-east, and its phenomenal. 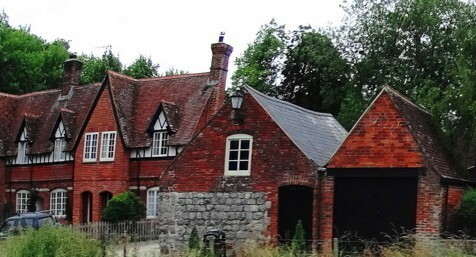 Aligned Stones: The edge of this porch has several stones that are centered and aligned with the massive square tower that stands almost 1000 feet high in the distance. This ledge also seems to be aligned to the peak of the mountain just beyond. If it weren’t for places like Macchu Piccu, where stones are aligned in amazing ways at high elevations to mountains and peaks, something like this would certainly seem impossible. But notice the stones running in a straight line directly down the center of this porch, with tops that are squared perfectly with each other, as if leveled intentionally. Makes you wonder. What could possibly have done this? (left image) This is the magic of Monument Mountain’s porches. 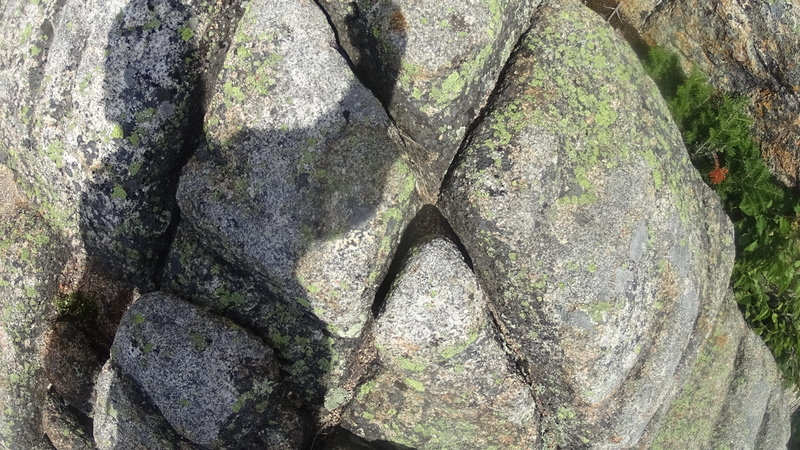 Pattern Stones: Along the trail at Monument” you will also see a type of stonework that fits a specific pattern. This can also be found at other sites in New England. 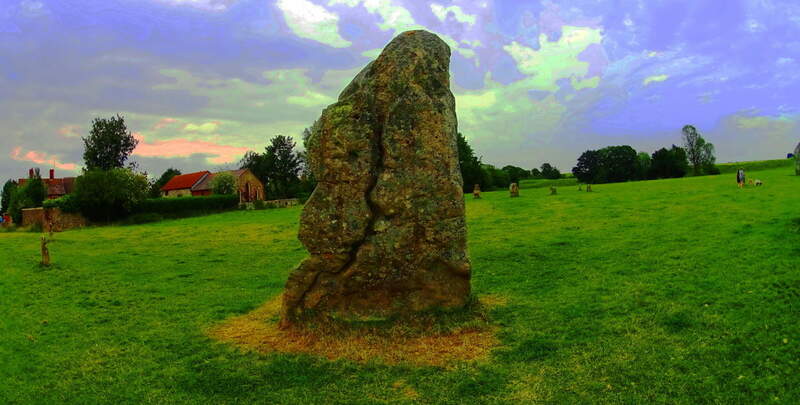 Here is an image of a long singular megalithic slab specifically placed above three smaller supporting stones. 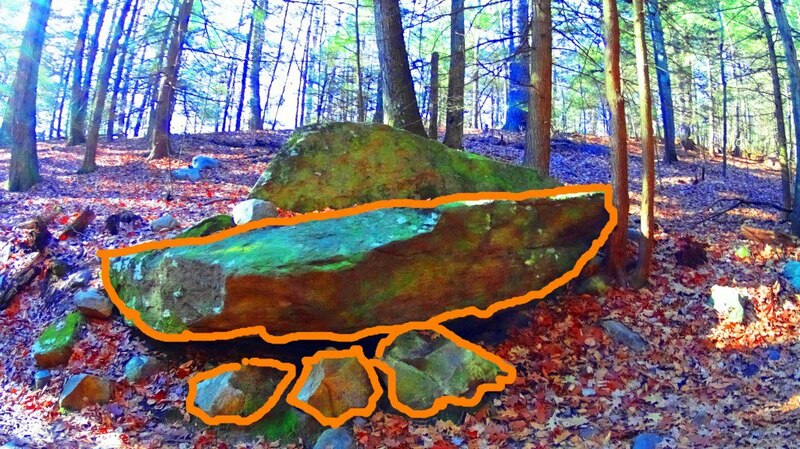 Below this are other spots at Monument”, and other places in New England, with the same dimensions of: the long slab on top, with the three smaller below. 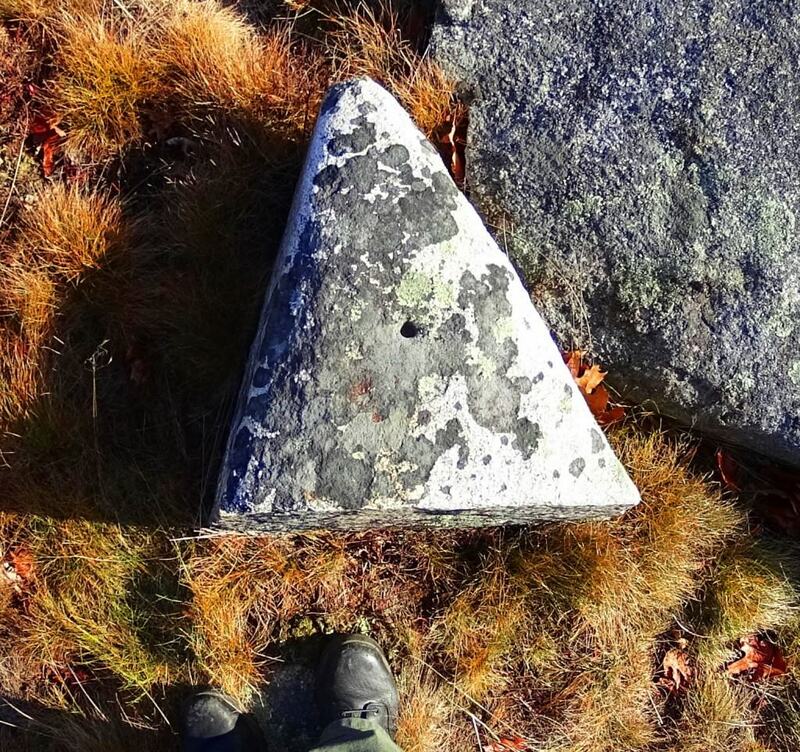 This is easily something you might pass by, believing it to be simple glacial displacement, but have a look at some other patterned stones in New England that fit this exact design. 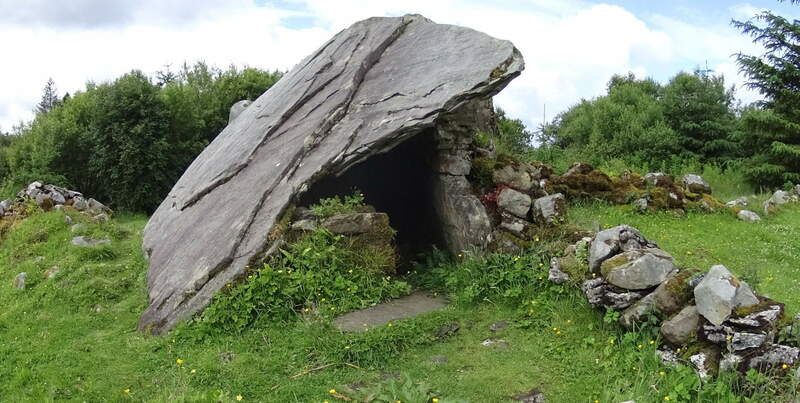 Interestingly, over 2000 miles away, there are Dolmens in Ireland that, in profile, fit this is exact numeric design: one long slab over three lesser stones This example is significantly larger, which is the Gaulstown Dolmen, with a capstone weighing 6 tons, suspended roughly 6 feet in the air. This relationship of 1 over 3 seems to be significant for these fixtures, and for the moment we can only guess at the significance of this. 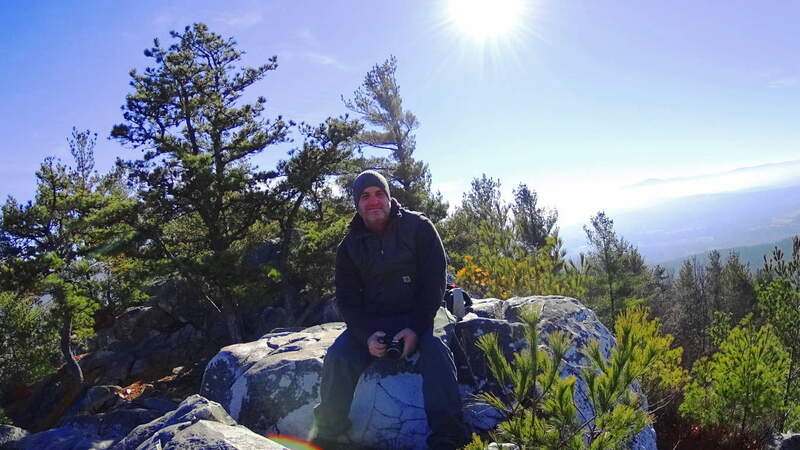 After continuing along the porch away from the north-east alignment you will find Squaw Peak, which has a wonderful 360 view of the river valley. On a clear day distant peaks cut the clouds at a distance. 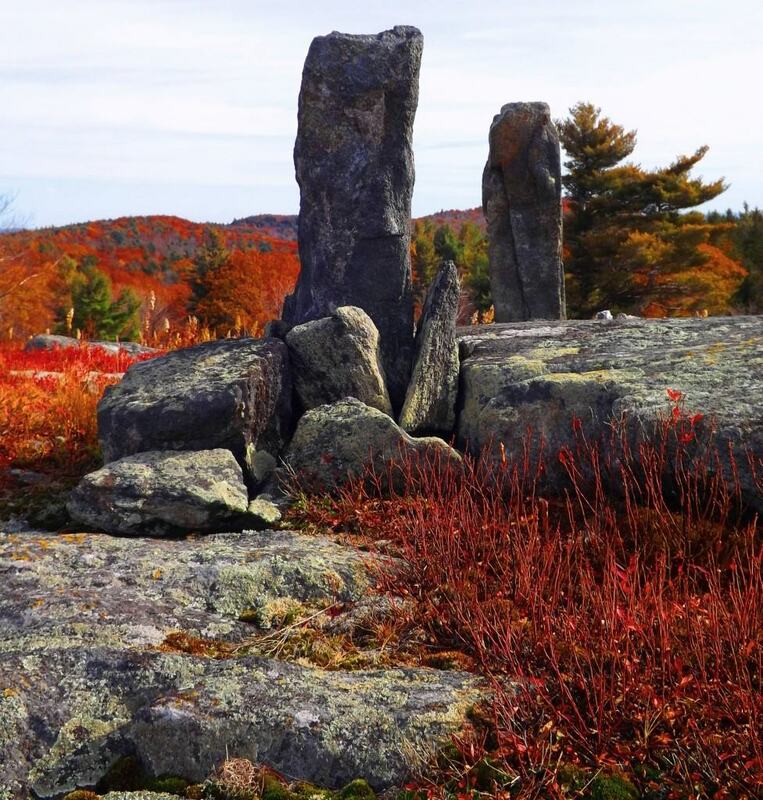 Monument” trails also sponsor some of the more common megalithic features found at places like Mount Monadnock and Mount Watatic. 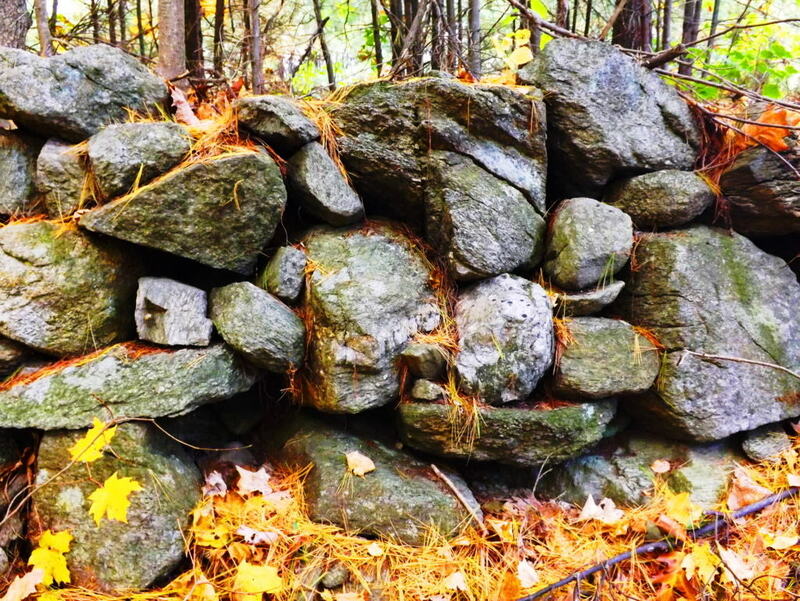 There are classic stone-linings that run straight up the mountain… and the mysteriously cut “X” sections, that produces the diamond shape stones that appear all the way into Maine and New Hampshire. All of these are found here at Mounument”. 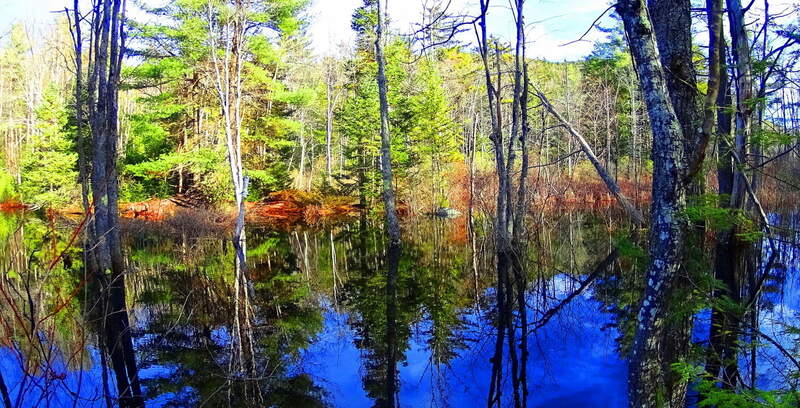 Give yourself an entire day to search out the pathways that lead through this wonderland in south western Massachusetts. 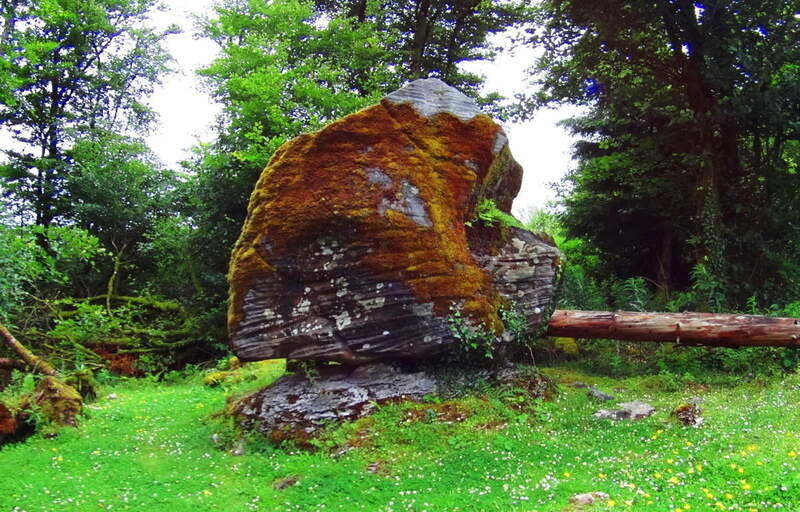 Feel the texture and absolute smoothness of the creases in these megaliths as you go. This is an absolutely wonderful hike that stretches for about 4 miles along the larger picturesque loop. Someone loved and appreciated this place in ways we are only just beginning to understand. See it for yourself, the sooner the better. 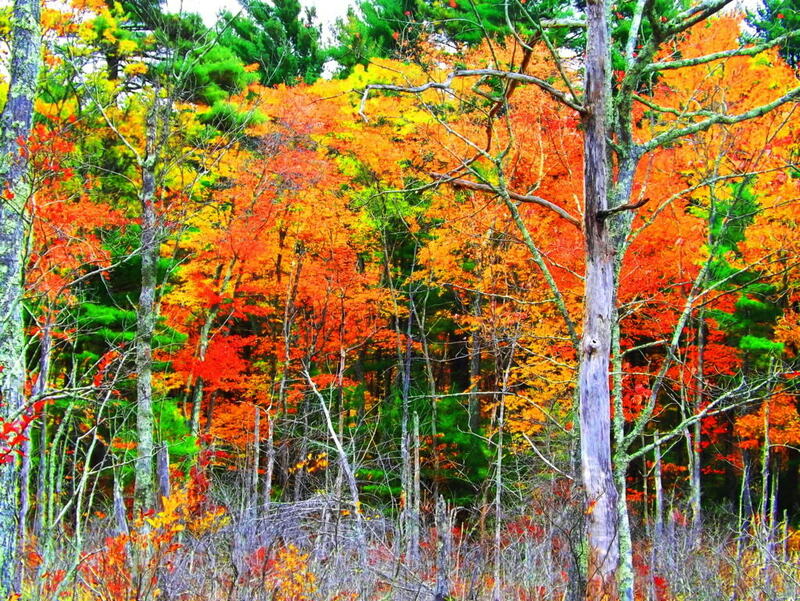 Note: In Upton Massachusetts The Blackstone Valley sponsors a full-spectrum ocean of foliage in the Autumn season. This is a classic New England hamlet that feels more like a rural village sitting just off the Ring of Kerry, rather than central Massachusetts. 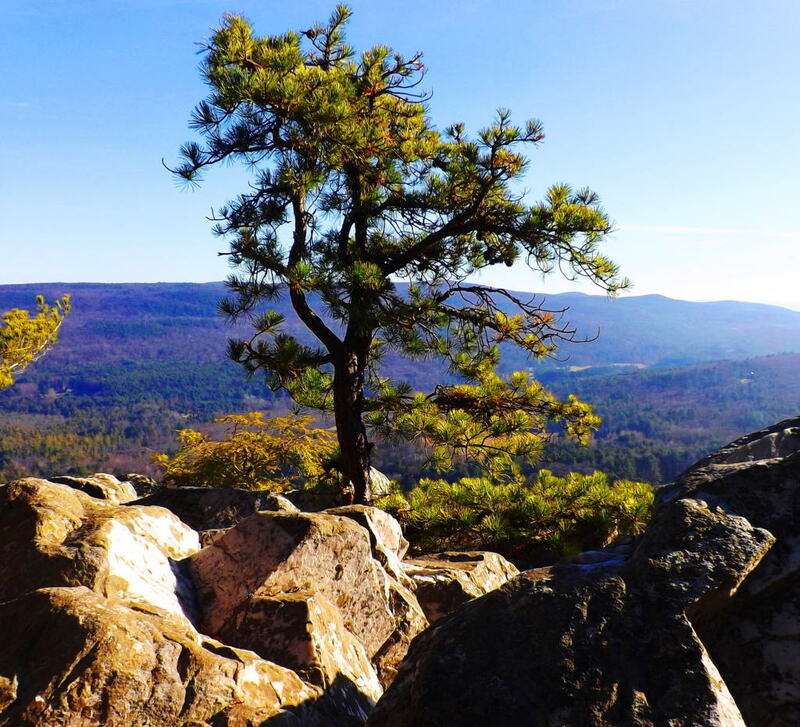 Natural features of the town include a State Forest with roughly 7 miles of trails, with other minor trails leading to stellar places like Look Out Rock (top image). 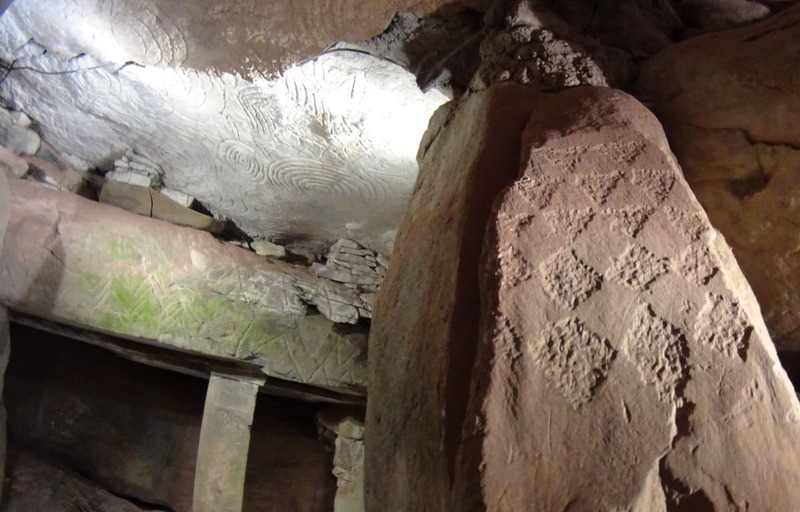 Upton offers-up an “Old World” aesthetic with some very real historical substance, containing one of the finest Wedge Tomb’s in the world, known as the Upton Stone Chamber (image below). 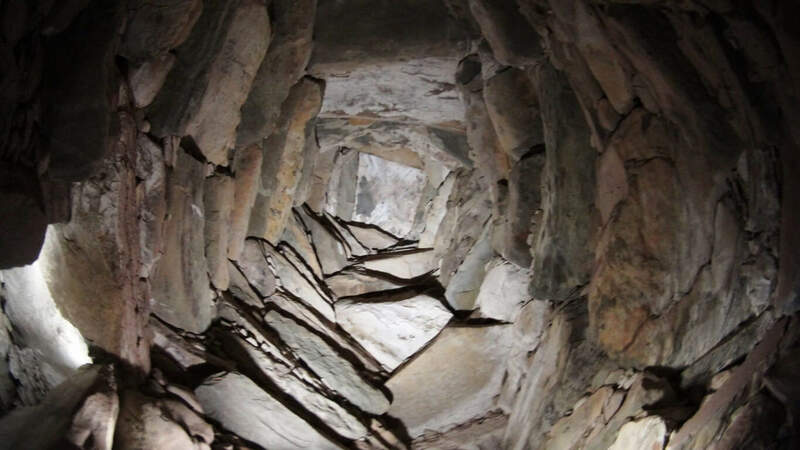 The scale of the Upton Stone Chamber is very similar to the Stone Chamber at the top of the sacred Hill of Tara in Ireland. The stonework of the Upton Chamber is exquisite, with dry-laid corbel roofing that opens up from an entry passage into a 15foot dome, crafted into the Earth! The roof has four 5 ton slabs holding up the passage leading to the mini-dome. 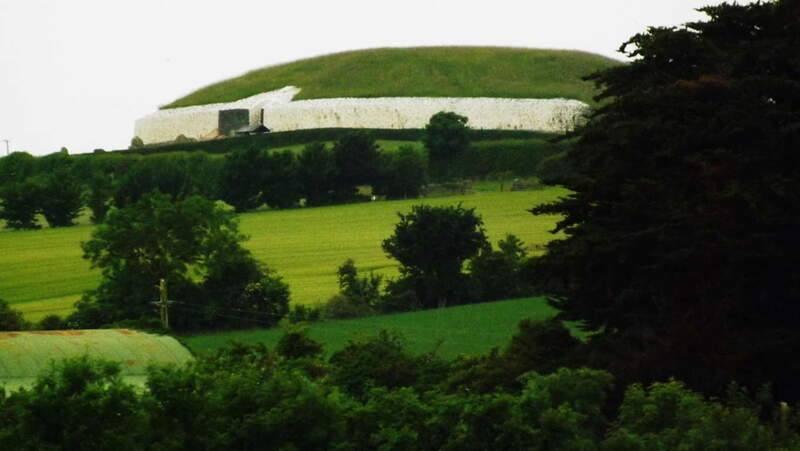 This is of the same style of roofing that was used, on a more massive scale, at New Grange, Ireland, the oldest megalithic site in the World (right image). When I entered the Upton Chamber and turned to take pictures, orbs started floating around. (left image) (Click it to look closer). There is energy in these chambers. In general, these are some pretty strong stylistic connections to some very significant places, for just a simple small town in New England. 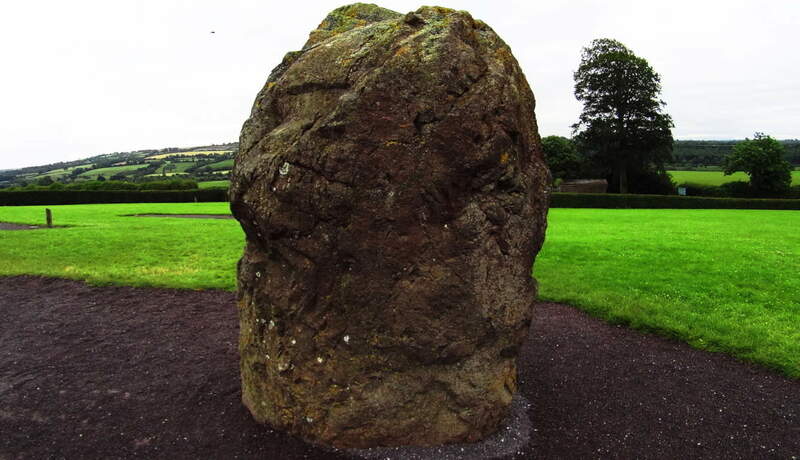 Just like in Glenveagh National Park, Ireland (left image), Upton has unique and complex megalithic stones that are beautifully mingled into various features of the landscape, with stone-linings that are much larger than Celtic linings (2nd and 3rd/left images/Upton). 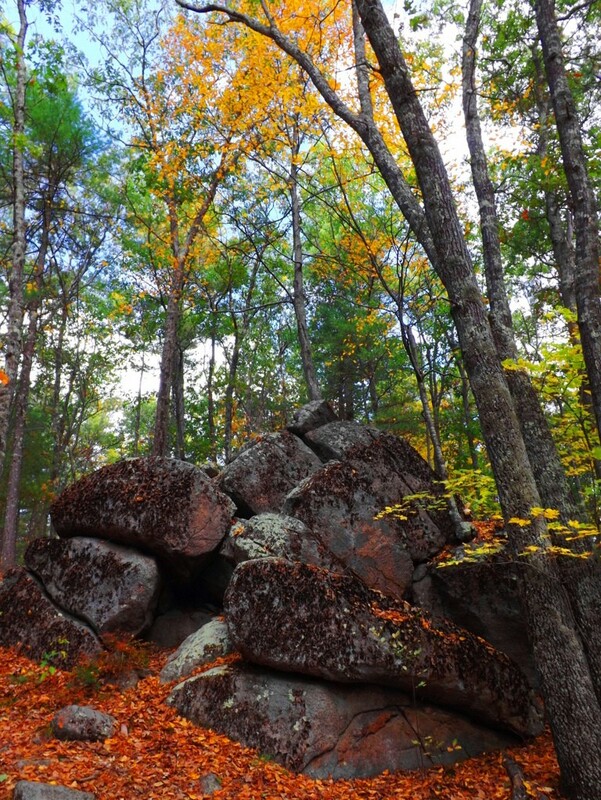 Massive granite boulders are stacked near peaks in the area, and all throughout the elevated trails. Some boulders, however hard it is to believe, seem to have been molded to imitate, and align, to the center of significant peaks in the distance. Look Out Rock is an amazing example this, with three parallel grooves carved into its face, seemingly calling attention to the boulder. It points, like an arrow, directly to the top-center of the mountain in the foreground, creating a kind of prismatic display (right image). From an anthropological standpoint this is significant information, indicating that this culture was clearly “symmetry conscious”, and not only that, but symmetry capable. They could make it happen. Scope and scale of megalithic work by a culture that is capable of these statements should be reconsidered entirely to understand what is actually taking place. 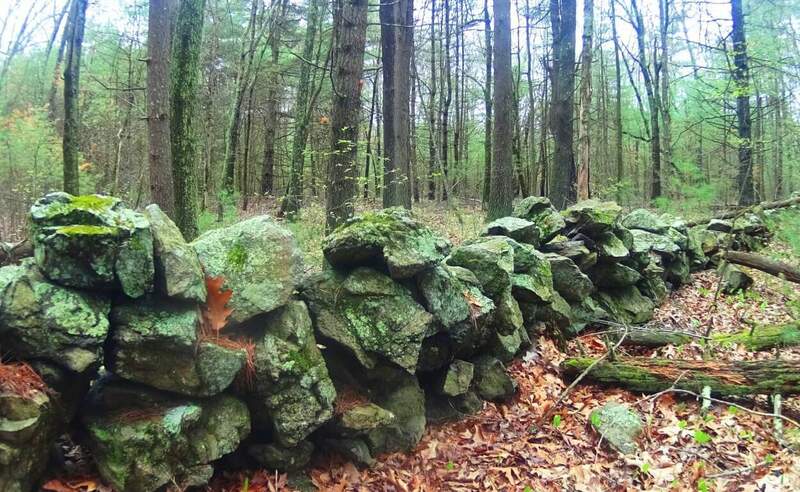 The neolithic culture in Upton, and all over New England, could craft granite boulders like a modern carpenter crafts wood. 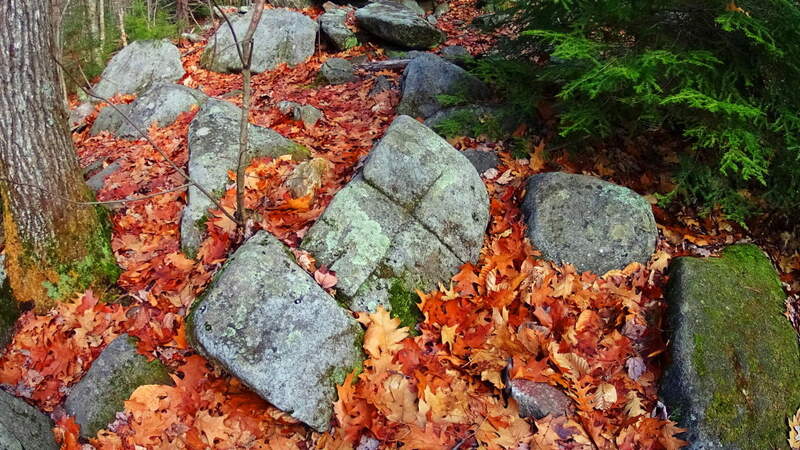 Forest floors in Ireland and New England look to be made up entirely of granite scraps that are cut from the larger boulders, eventually placed as statements further up the various mountains. 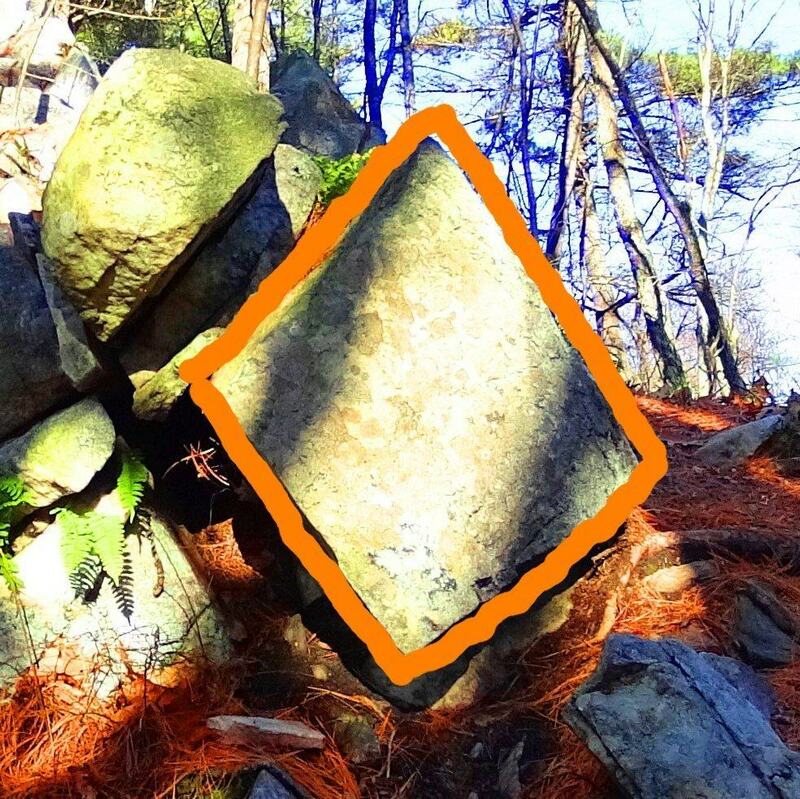 This is the reason we find so many stones on elevated trails that have obvious cuts, right angles, and squares. 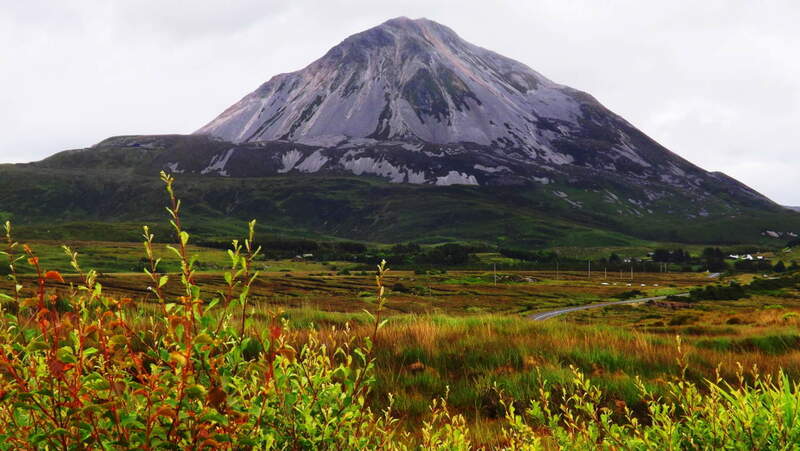 The Blue Hills in Massachusetts (below left), and Mount Bearnagh in Ireland (below right), are prime examples of this. 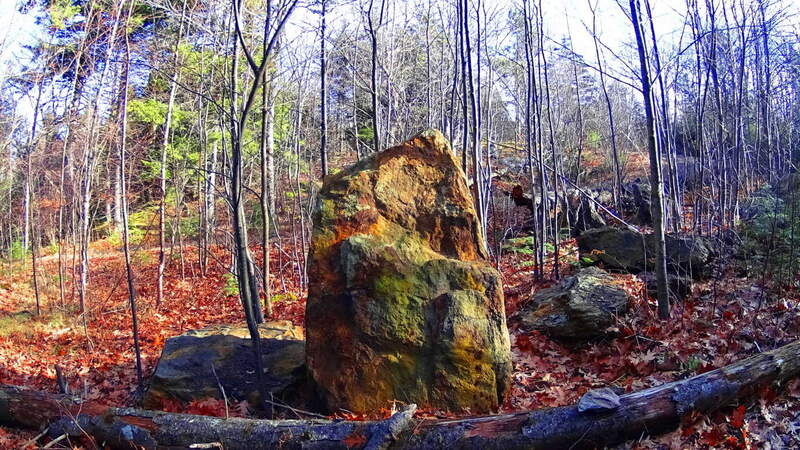 The trails in these sacred places are lined with the scraps of “megalithic carpentry”. If we were to look at the angles of the scraps on the floor of a carpenters cutting-table, the pieces, on their own, are a disheveled mess which doesn’t make any orderly sense, but the significance of each little piece is that they stem from the cutting of a ‘larger block’ on the table. The angled granite scraps are the overall proof that craftsmanship took place. 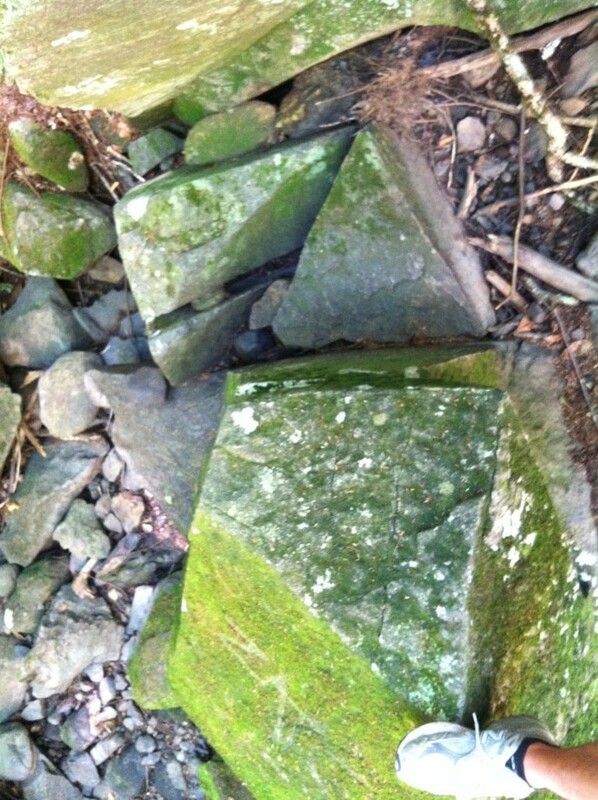 Entire trails are lined with scraps of angular granite cuts throughout Ireland, Wales, England, and New England. 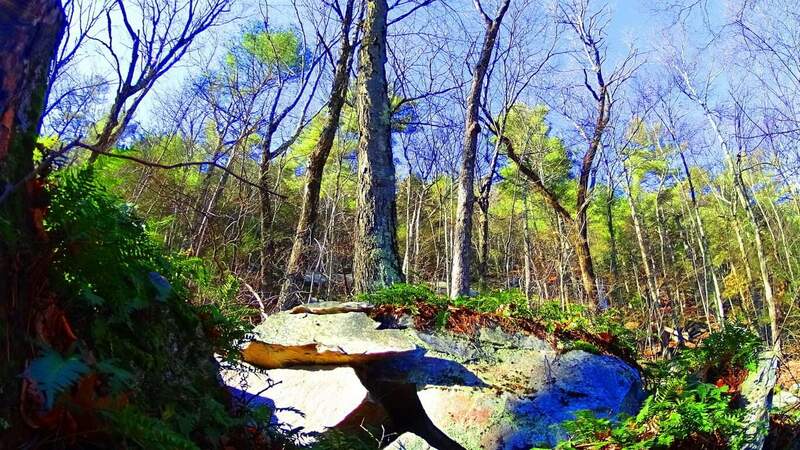 Returning to Upton, a New-England style Dolmen sits just thirty yards from the peak at Look Out Rock. 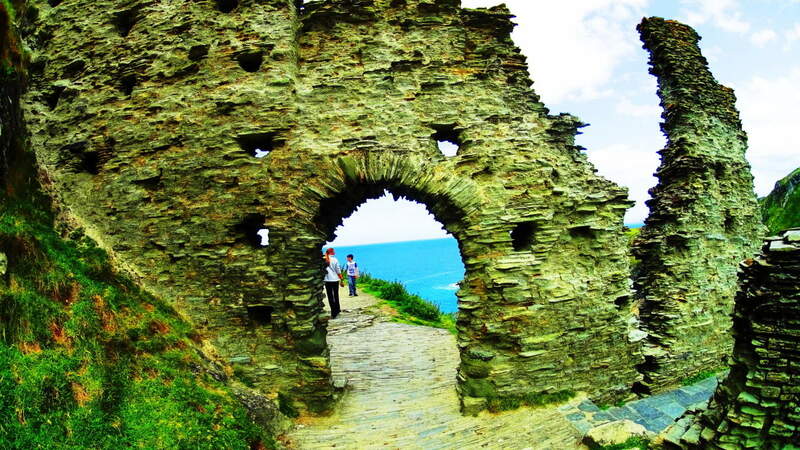 This is also a trait of sacred neolithic places. 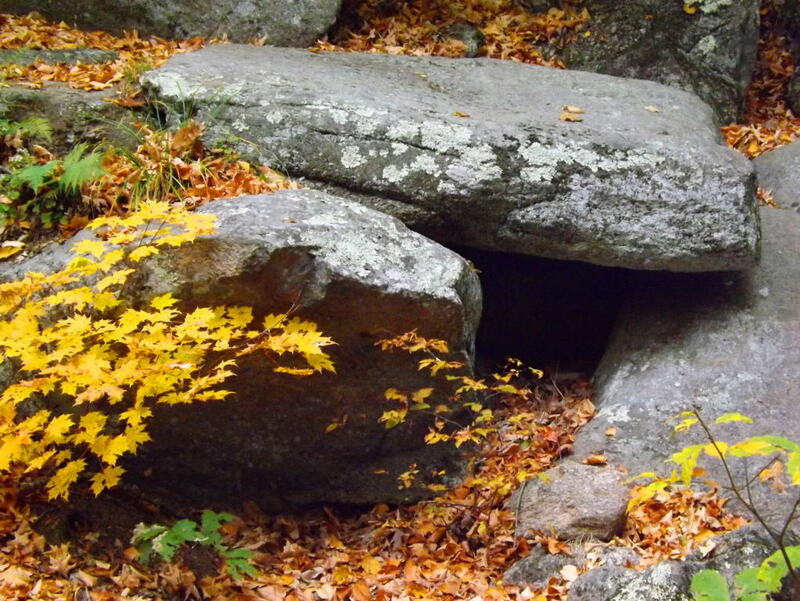 Wedge Tombs and Dolmens are often just out of view from the most advantageous spots of their specific site, very much like hikers and campers keep a tent out of the wind fairly close to the beautiful spots they want to photograph and camp near. 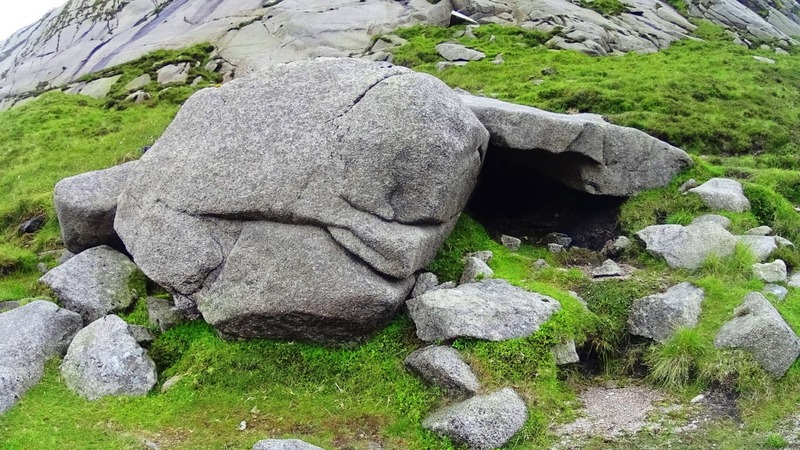 The Wedge Tomb in the heights of Glenveagh Forest, just like Look Out Rock, is centrally aligned to the mountain in front of it, with a Dolmen tucked just 30 yards from the best vantage in Glenveagh National Park. 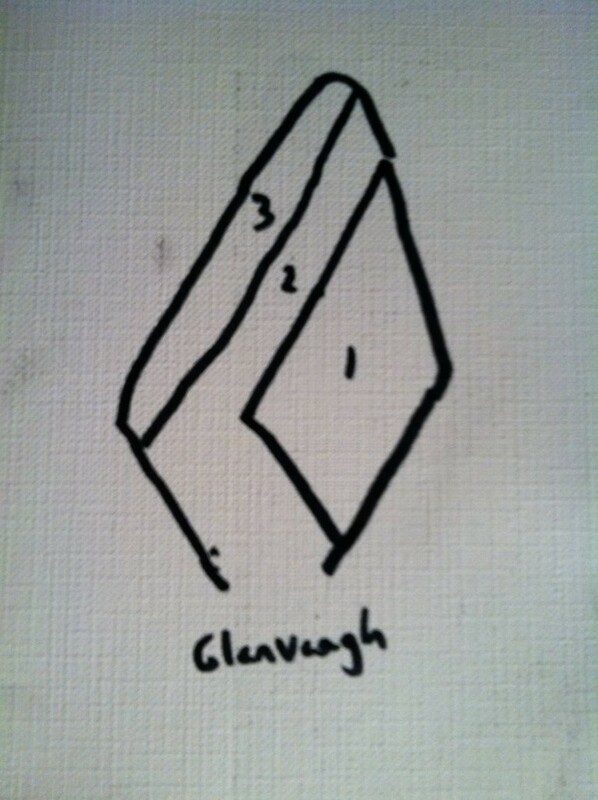 (image on right/Glenveagh Wedge Tomb). Something’s going on here. 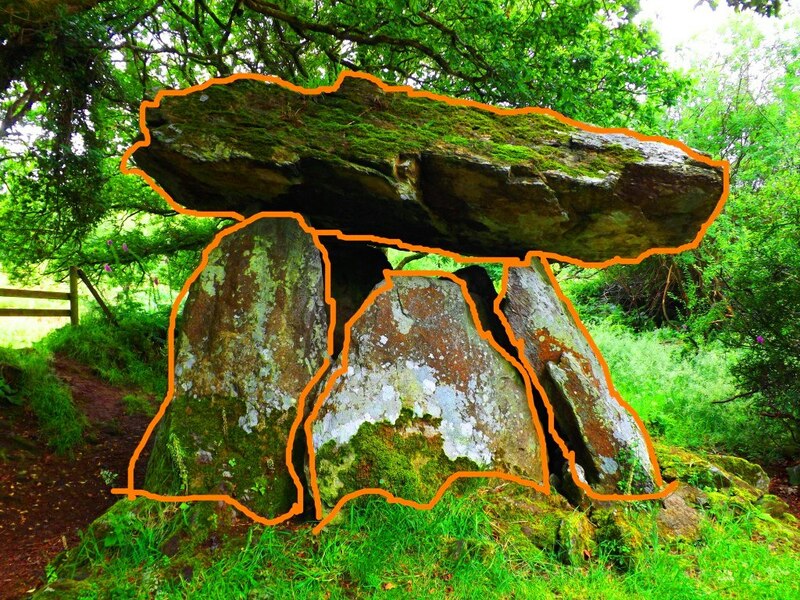 The boulders on this unique Dolmen (Image below) are cut utilizing massive and graceful lines, with long square boulders fit into each other, balancing perfectly into what looks like a primitive pyramid. The Stones are obviously cut. This Dolmen utilizes a ‘scale-scheme’ with the larger lower boulders, leading up to the smaller capstone at the top (image left). It is an incredibly thoughtful looking structure. In scale (not style) it is very much like the massive Proleek Dolmen in Ireland, which also shows nearly miraculous scale, and balance. (right image). Interwoven into the old colonial town of Upton, there are ledges with massive megalithic fixtures, huge quartz streaks and balanced boulders. The geological explanation for these features just doesn’t make sense. Scientists usually impose some theory of how glacial ice exploded, or slid, in a certain way to make events like this happen, but it just doesn’t hold up logically. Take a look at these massive quartz parallel shafts, with a free sitting boulder cut and inserted into the underside of the ledge. 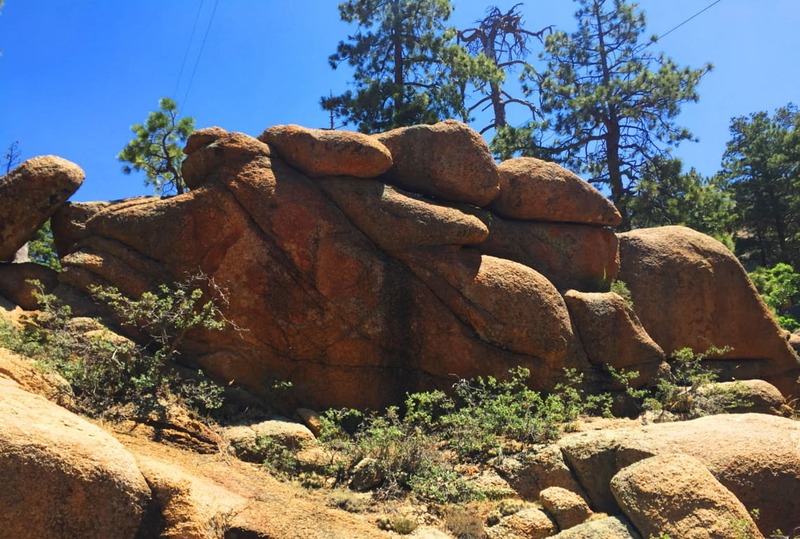 The boulders may have been cut with the intention of having the quartz grow into the parallel gaps, which reveals an amazing comprehension of how quartz responds to granite in certain positions and places. I wouldn’t put this capability past the megalith builders. It seems that they had total understanding of how to use the landscape, and had the power to mold it as they saw fit. Conceptually, it breaks our reality wide open. 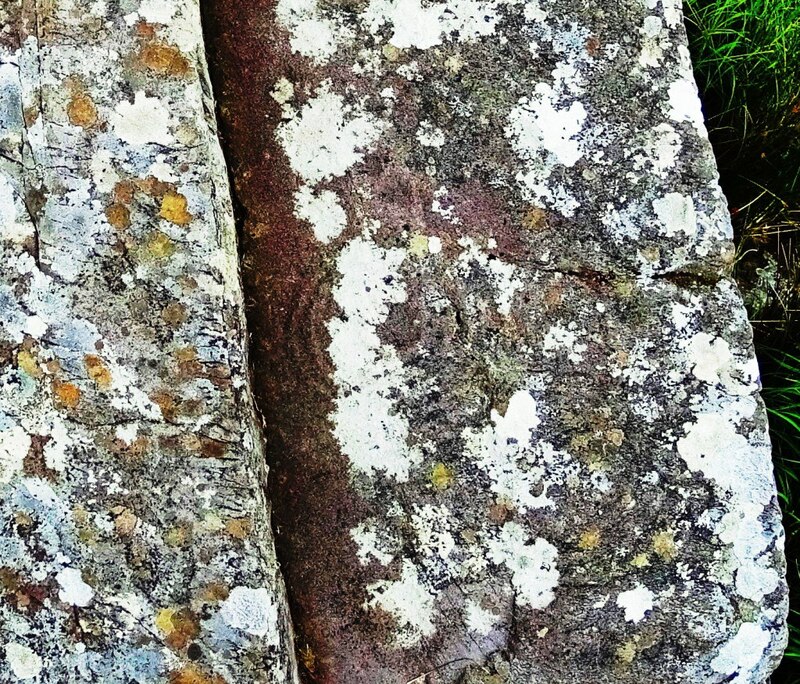 There are stone-linings so massive in Upton, that they look like they were intended to be walked on (image left below). 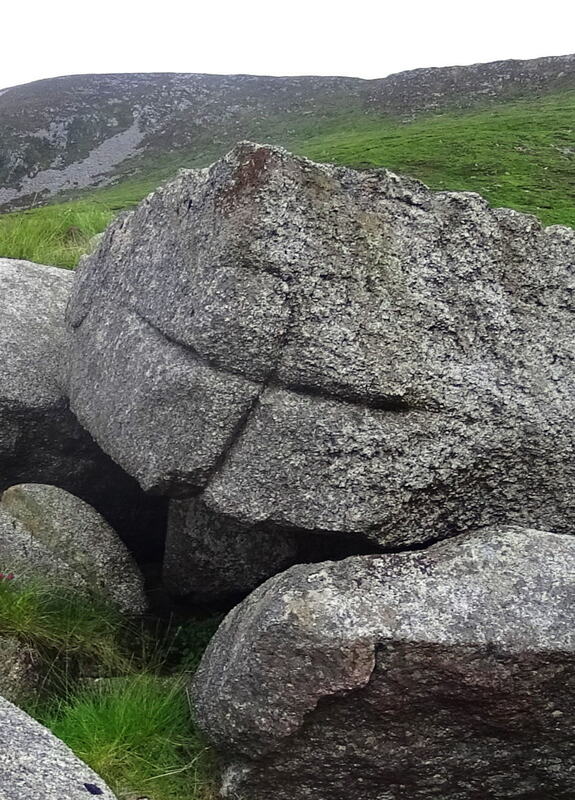 Stone-linings literally converge on a Wedge Tomb at Glenveagh National Park from three directions (bottom image) (Click to look closer). 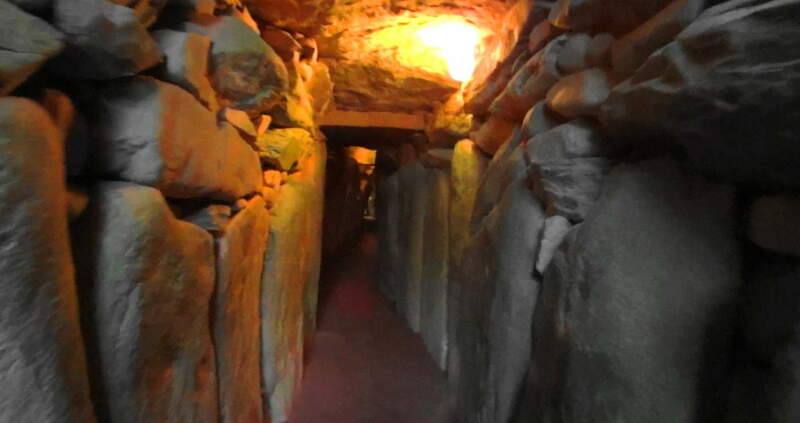 These are all indicators that these stones were being used as energy harnesses, connecting features in the landscape, transferring energy from the Sun, to the stones, into the chambers. The entire town of Upton is sitting on a geologically engineered landscape. Take the trails through Upton Forest in October for a ‘fantastic full spectrum’ experience, and hike up to Look Out Rock to see for yourself the aligned ledges and Dolmen. 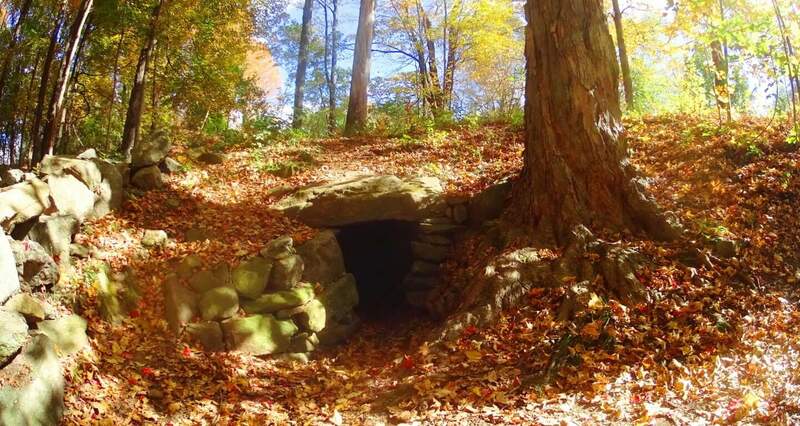 This is truly a sacred and enchanted place in the heart of New England, comparable to any Celtic site. Seek it out. 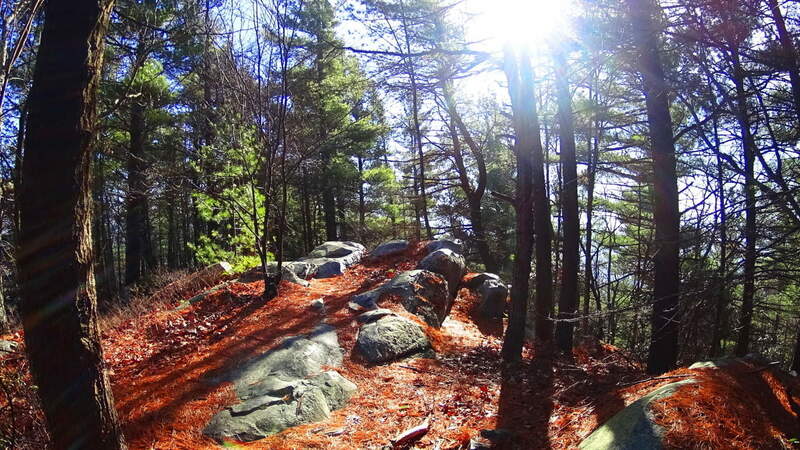 Note: Massachusetts is a haven for the ‘small mountain’ experience, with most trails peaking under 2,000 feet. 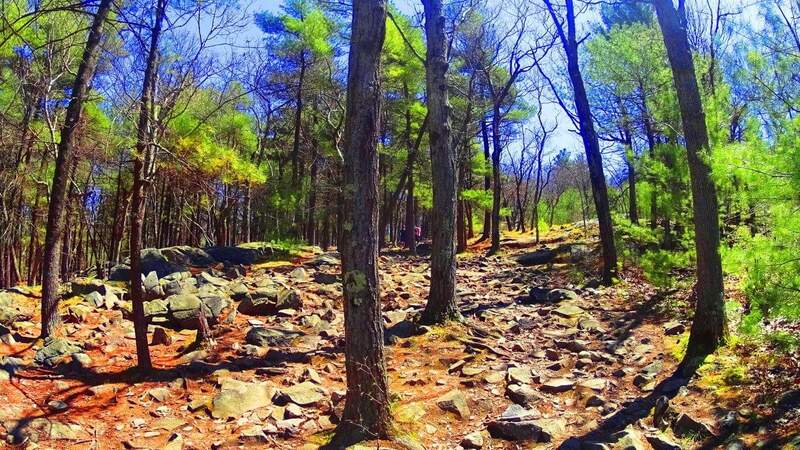 For hikers with the right vision, the experience on the trails is by no means small, however. 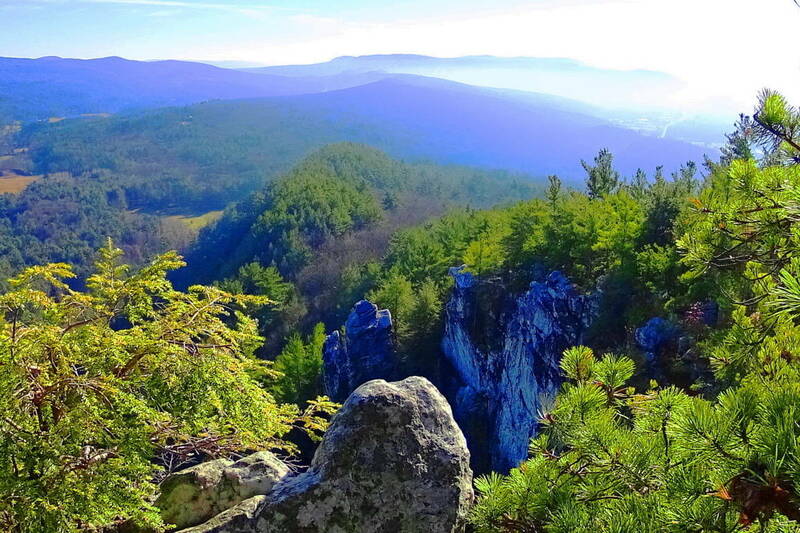 A mysterious megalithic culture existed once on the rocky peaks, pine forests, and hilly river-valleys of this area. Strongest similarities show up across the Atlantic in the ancient Celtic elevations. 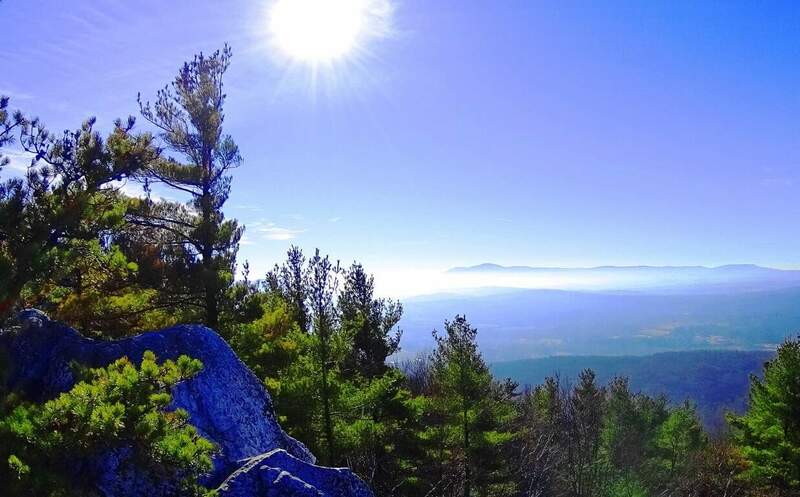 The climb to the top of Watatic Mountain will grant you a great view of the State of Vermont to the north. 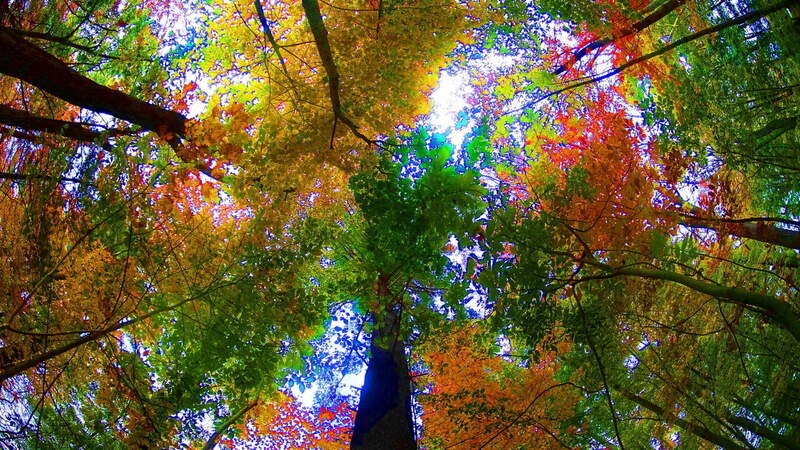 In Autumn it is a visual miasma of colors, increasing the value of the trail exponentially. The main trail is called Nutting Hill, which is just over three miles long, half of which is just about straight up, so be prepared. The megaliths are here too, making this an anthropological experience. To begin, at ground level a set of small ponds accept the run-off from the mountain. The rocky mountainside deflects the wind coming from the north, stilling the ponds surface like glass as you pass by. The level portion of the trail, just past the water, is only about 150 yards. Immediately strange stone fixtures protrude through the leaves all around. 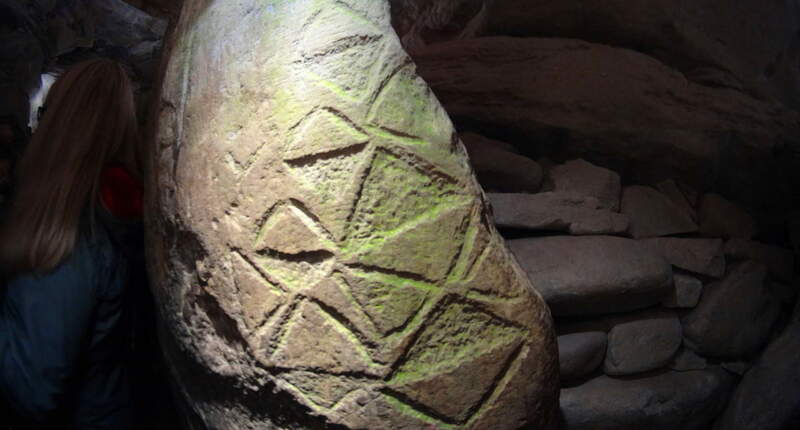 Among these fixtures are more significant signs of “signatures”, or specifically stylized workings in the stone. The ‘X’, or “diamond cross-section” is one of the most popular types. 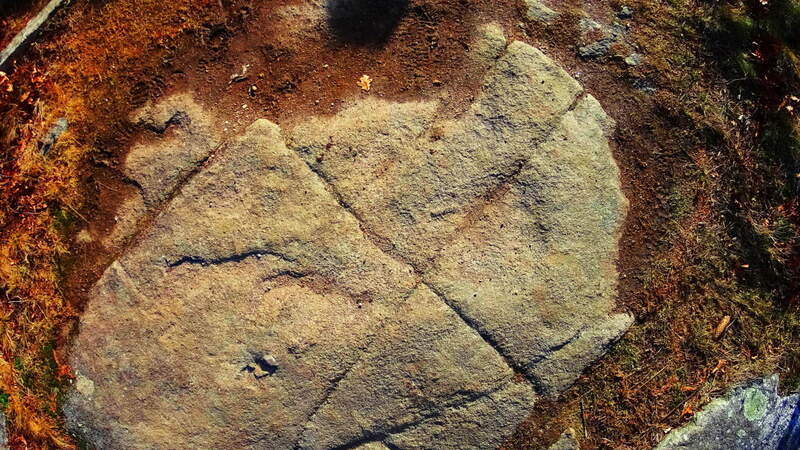 To look at these “X” sections it is nearly impossible to believe that they were created by ‘glacial displacement’. They create symmetries not only on the stones that they are carved into, but also in the stones within the vicinity of that particular signature. 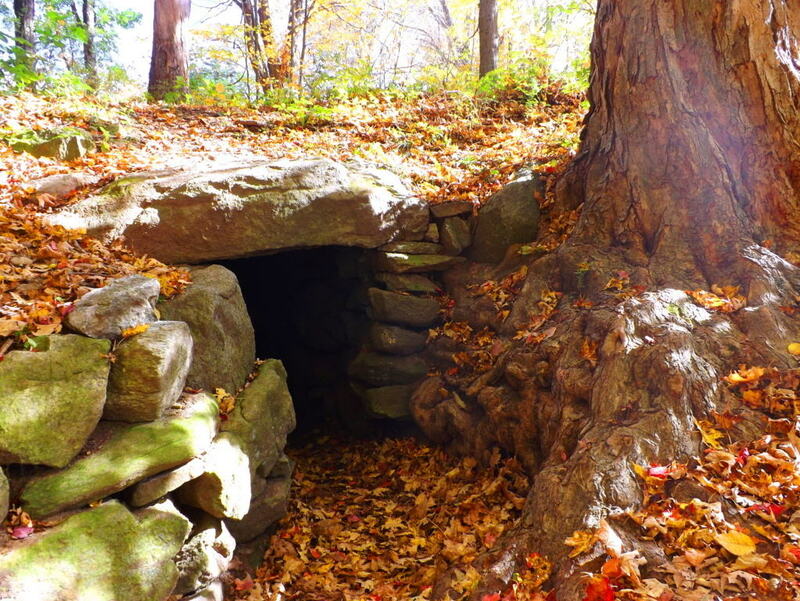 They are found on almost every Massachusetts trail where there is significant rock formations, both in the heights, and valleys. 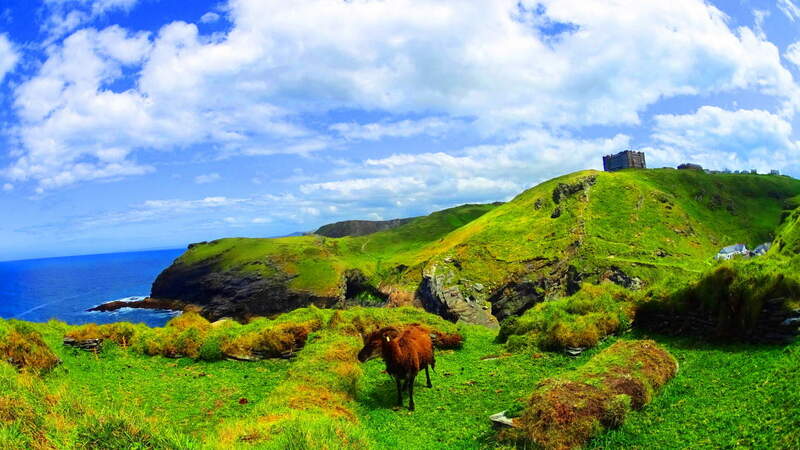 They are also found in the Celtic heights of Ireland. One possibility about the meaning of the “cross section” is that it is a type of utility that insures that if the section is cut, regardless of size, the remaining pieces will fit together if used to build other structures, such as stone-linings (“walls”), dwellings, or irrigation stones. Several examples of this “X” cross section from Watatic are shown here above, as well as one from the heights in the Mourn Mountains in Ireland (right). Before ascension on the trail begins, a classic megalith in the form of a smoothly split boulder, roughly 10 to 15 tons in weight, sits at the base of the mountain, like a gateway. 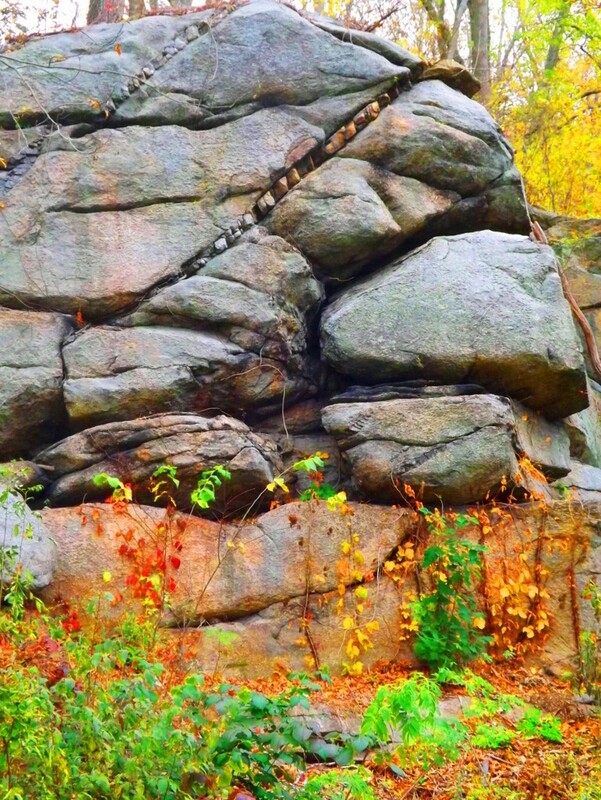 The stone path literally passes straight through this massive cut boulder. 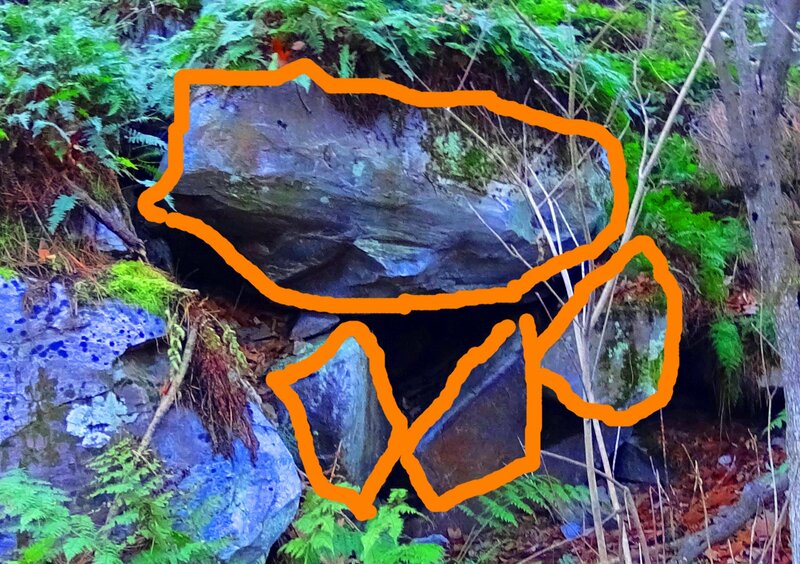 If you stop to examine the area around this megalith, you will find several “cross-sections” waiting to be observed. Continuing, as you begin to climb, a beautiful old-forest glade of pines emerges, and the path becomes wider and rockier. For roughly a mile you will work your way through these pines. 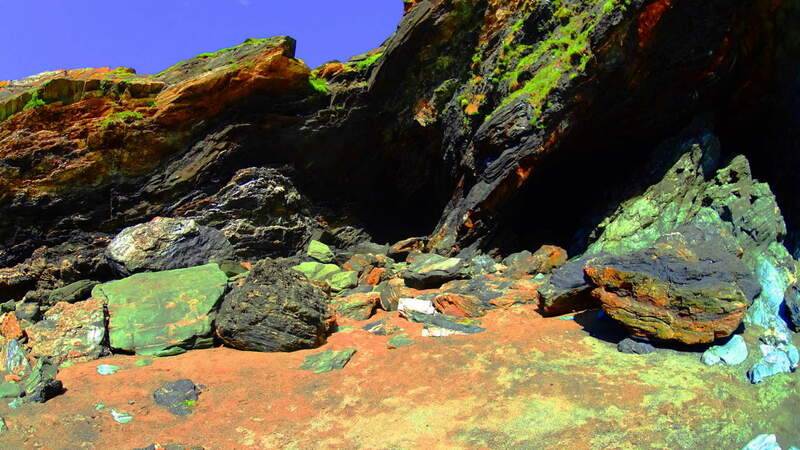 Interestingly enough, it is not until you reach about 1,400 feet in elevation, that a “stone-lining” emerges. This particular “stone-lining” is another strong piece of evidence against the idea that this type of feature is not a “wall” by any means. It became clear that this feature ran circularly around the dome of the mountain, like a crown on a head. No colonial farm has ever existed at the top of this fairly narrow set of circular porches at Watatic Mountain, where there is no elevated water reserve or pasturing possibility. The case for this being the work of a colonial farmer marking off his territory is illogical. It would be a triply arduous task for any laborer to first gather enough semi-megalithic size stones to lay a three foot high, two foot thick, pile of massive cut rocks around the full circumference of the mountain, at an elevation of about 1,400 feet. There are no signs that these stones were quarried at the top of Watatic, so they must have come from below. From below, after being crafted, piled, and gathered, the stones would have to be CARRIED UP, AND ALL THE WAY AROUND THE PEAK at an incline of roughly 60 degrees. If a laborer did manage to achieve this impossible feat, actually laying the stones, which weigh anywhere from 50 to 700 pounds each, it would take them a lifetime. Colonial living is an essay in practicality. Labors in Colonial times were conserved to efforts that yielded real sustenance, like digging wells for water, building barns for dairy and protein conservation, and clearing fields for crops. 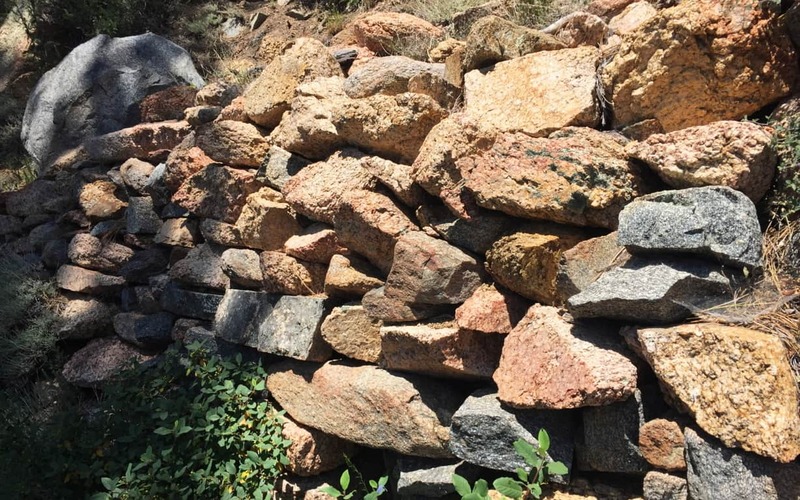 Building a stone wall for no reason around a mountain-side at 1400 feet, where there is no pasture, but only rock, would have been illogical, wasteful, and impractical to the point of preposterous. 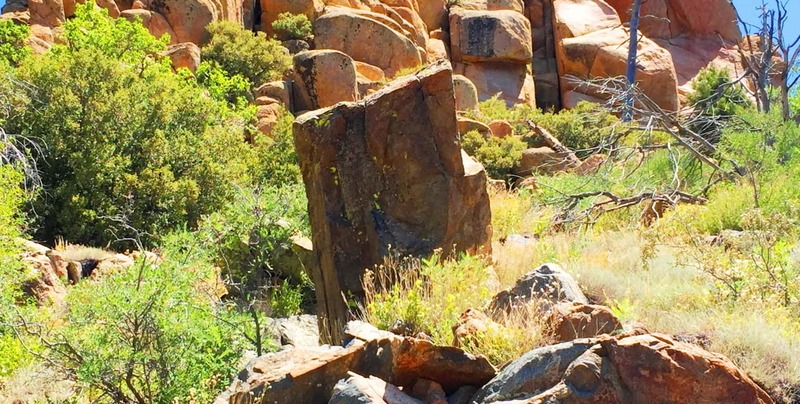 Something else is going on with these megalithic stone-linings. In places like Cavan Burren National Park in Ireland (Shown in green/right), as well as the Blue Hills in south-east Massachusetts (Shown in red and orange, below/left), and the Mourn Mountains in Northern Ireland (Shown in green/left) , stone lining seem to be energy connectors, or containers of energy in certain spaces. All of these linings are at significant elevations, and are not capable of containing any kind of herds; And this is what is happening at 1,400 feet on Watatic Mountain. Whoever set the stones in place wanted us to understand that the space created within the circle is a sacred energy center, charging the elevated dome of the Mountain with subtle energies. Continuing on again, after passing this 1,400 feet mark, your path will follow the stone-lining for about 100 yards until you cross-over into this special zone. At 1,650 feet there is beautiful Celtic style standing-stone just off to left of the path. It stands 6 feet tall, and perhaps 7 feet in width, with a distinctly cut ‘face’ supported by a rotund rear side. 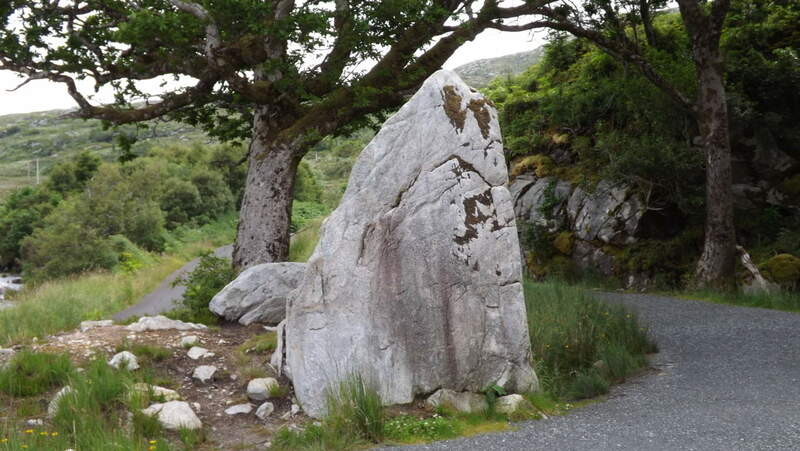 This exact style of “cut-facing with “rotund-rearing” can be found in a gorgeous diamond shaped, white standing-stone, along the castle trail at Glenveagh National Park in Ireland, (shown here in the next two images below). It is impossible to miss the distinctness of the “face” side with the “supporting rounded-rear side” in both stones, and therefor the similarity in craftsmanship. This is pretty solid evidence that the designers of these standing-stones had almost exactly the same knowledge about crafting them, as if they were from the same culture, although separated by an ocean. This is where the story of the Nephilim, as the first anthropological society on Earth, becomes relevant. 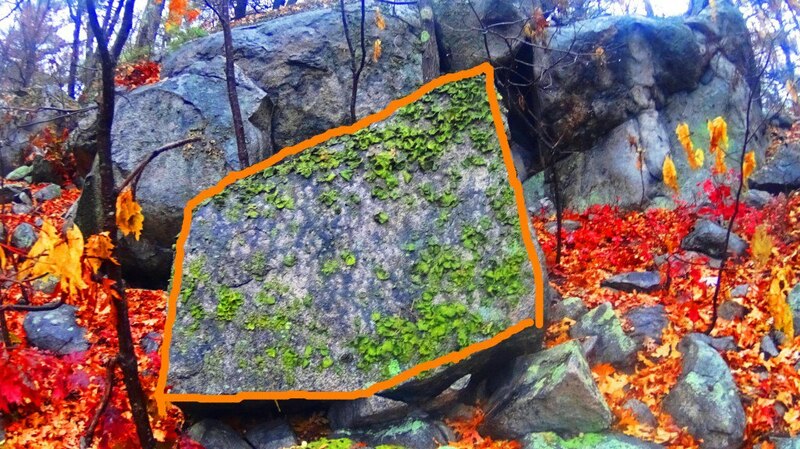 Obviously the standing-stone at Watatic is so weathered by thousands of years of foliage layered on its distinct face, that it is practically camouflaged into the overgrowth, covering what looks to be pink granite beneath the grime, as opposed to the marble clarity of the Celtic stone, that has not experienced New England foliage. The standing-stone indicates, especailly at such an elevation, that this was once an incredibly endeared and valued space to whoever inhabited it. Finally, a quaintly cut-stone staircase climbs up to the last portion of the heights. Here you will arrive at a grand porch with a 360 degree view. 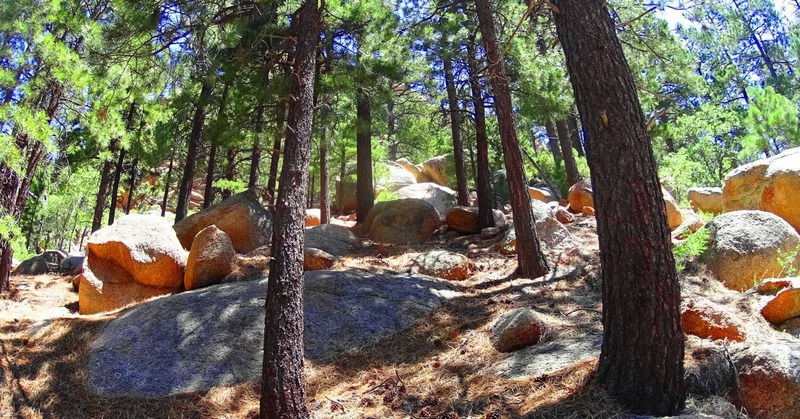 The rocky trail continues to a larger secondary porch, 50 yards south, lined with pines and rounded granite floors. It is well worth the effort to reach the top. 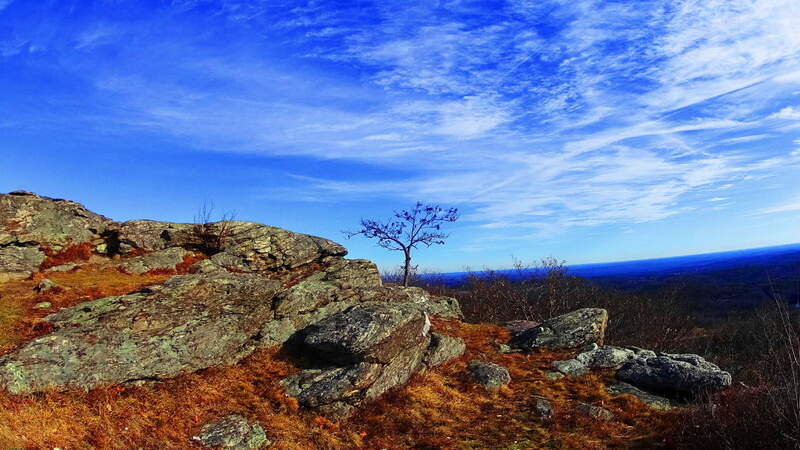 Watatic is an essential “small mountain” experience in Massachusetts, literally crowned by ancient megalithic stones. Take a day and see for yourself, you won’t be disappointed. 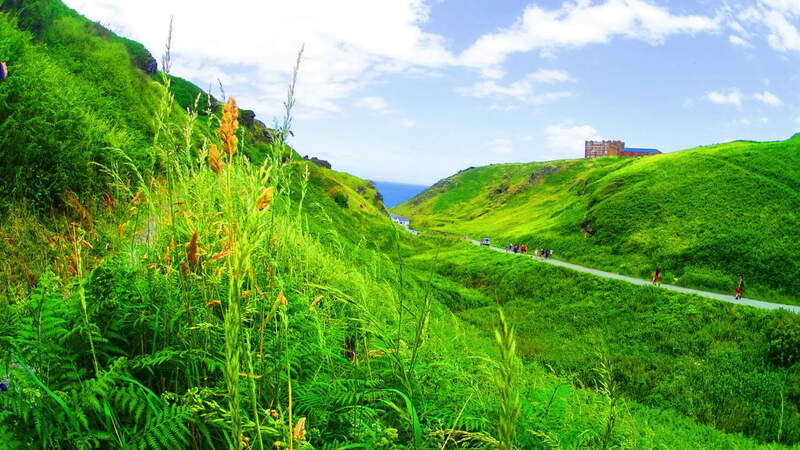 Note: Imagine yourself walking on a broad plateau surrounded by miles of grass and swaying brush. Continue to imagine that you are curious enough to seek out the best elevation among these vast fields, following the slight incline, continually heading upward. You begin to see something distinct just above the landscape, off in the distance. At about 400 feet away you glimpse something entirely impossible. There before you are several circular stone enclosures towering above you. The hallowed presentation of the area is hard to comprehend, even in broad daylight. It is not a disheveled scene, but rather, a highly organized, dynamic and symmetric presentation, like a temple. You then realize, all at once, that you may be looking at the first temple on earth. If you don’t turn away in fear, your mind, whether it is that of a passing farmer, saint, knight, Celtic king, or simple serf of times past, will inevitably reach for that first logical question asked for thousands of years before: how? How did this happen? Let’s fast forward and look at some of the modern observations. 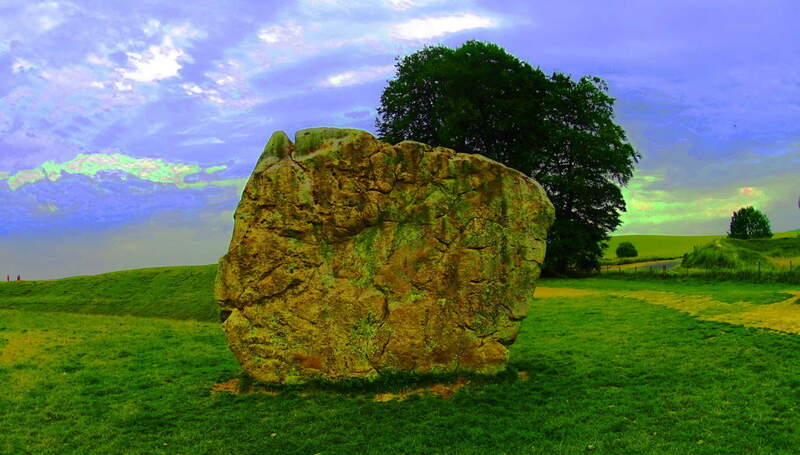 The external ring is made up of Sarsen stone, each standing 30 feet high, at 25 tons each. This exterior ring looks to be incomplete, as only 16 of the original Sarsen stones are in place, while there is a significant gap on the opposite end. Was the ring ever fully completed? If it was finished, how could some stones then disappear? A secondary ring of 43 Blue Stones are distinct but also obviously incomplete, within the larger Sarsens. 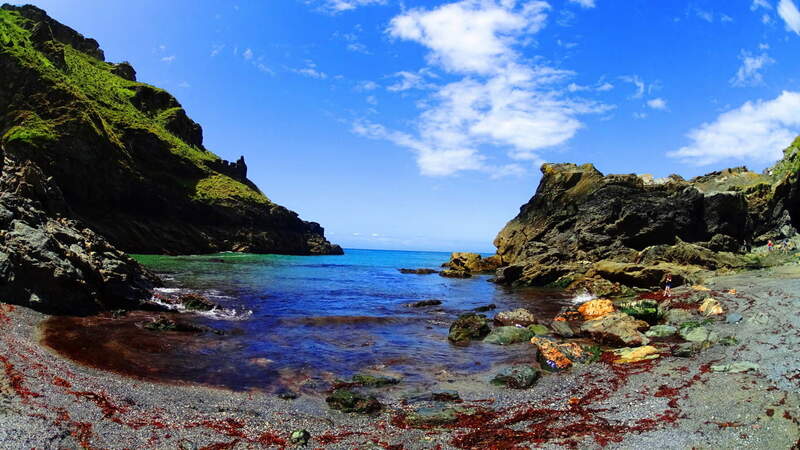 Some believe that there were as many as 80 Blue Stones originally. They weigh roughly 2 to 4 tons each, and were believed to be inserted thousands of years after the Sarsens. A third set of Lintel Stones are laid across the top of the Sarsens in different areas, revealing the intended circularity of the enclosure. The Lintels are not free-sitting, but are placed into grand notches that are carved into the top of the Sarsens, revealing yet another miraculous feat of engineering, besides the placement of the stones themselves. Lastly, at the innermost section of the rings of stone, are the five domineering Trilithons, set in a “horshoe” style configuration, including the lintels above them, weighing 50 colossal tons each. I was lucky enough to walk the grounds of Stonehenge on a sunny day, and got the best images I could, shown here. It was just as moving to step away and see others sizing up the scene, perhaps realizing, as I did, their own humanity; Perceiving that these stones have been here long before they were born, and will be there long after they are gone. Research continues regarding the meaning of this mystical place. Recent discoveries have revealed that Stonehenge is part of a grander overall context of ‘spiritual monuments’ once built into the land. Remnants of what is now being called “Woodhenge” has been found a few miles away, built in similar fashion to Stonehenge, near to the river Avon. 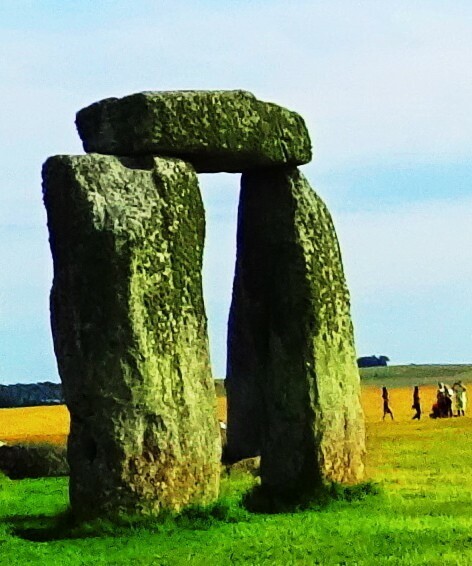 Compelling theories about the ancient Britons utilizing Woodhenge as a temple to the living (cultural association with wood), which moves up along the River Avon in a procession towards Stonehenge (stone being culturally associated with the dead) in a ceremonial celebration of existence, have been put forward. Many researchers also believe Stonehenge was built as a type of ‘celestial clock’, marking the Summer and Winter Solstices for eternity. Another feature of the area is a beautiful ten foot high Standing Stone perched roughly 70 yards away from the Sarson circle. 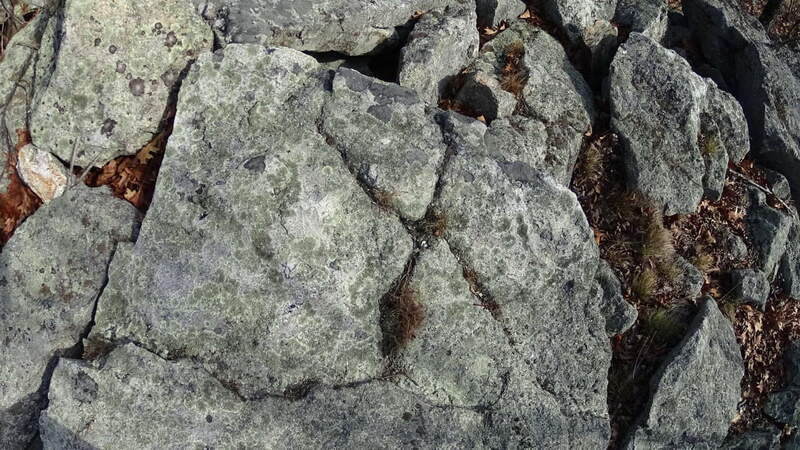 This stone, with its nodules and indented creases, looks somehow older than the Sarsons in the distance. It clearly looks as if it were standing guard over the area, warning passers by that the area is flat-out sacred, and to act accordingly. These “guardian stones” can be found near Dolmens and Wedge Tombs all across the Celtic world, standing at the periphery of sacred areas as warnings that visitors are entering a sacred space. 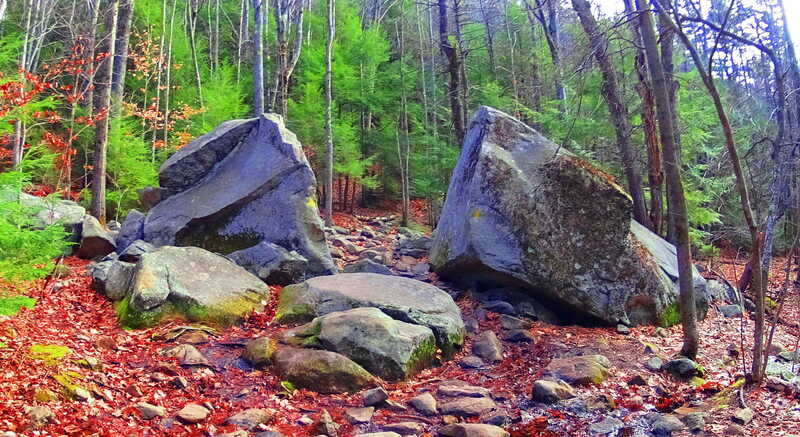 This phenomenon exists also in New England, but in the form of free-sitting boulders. 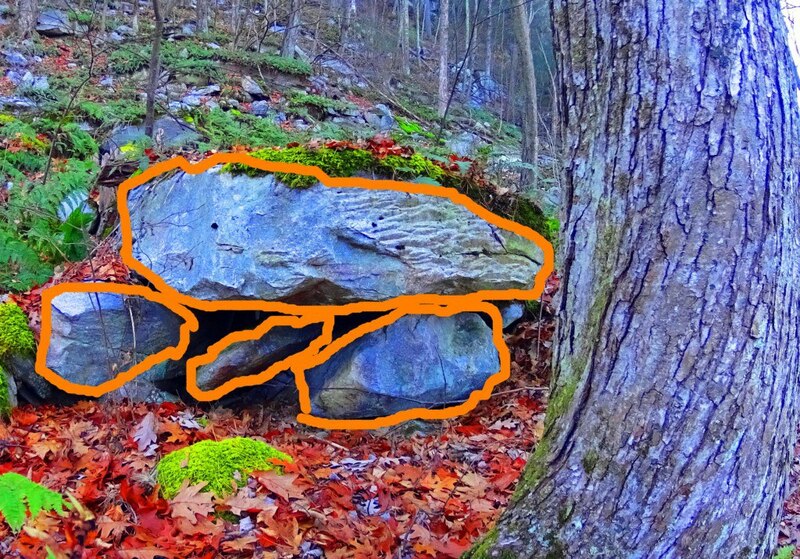 Boulders will be placed peripherally, strategically, to corner off a section of forest, cliff, or mountain plateau, in order to make passers-by aware that the area they enter contains sacred features. All of this could have originated at Stonehenge. 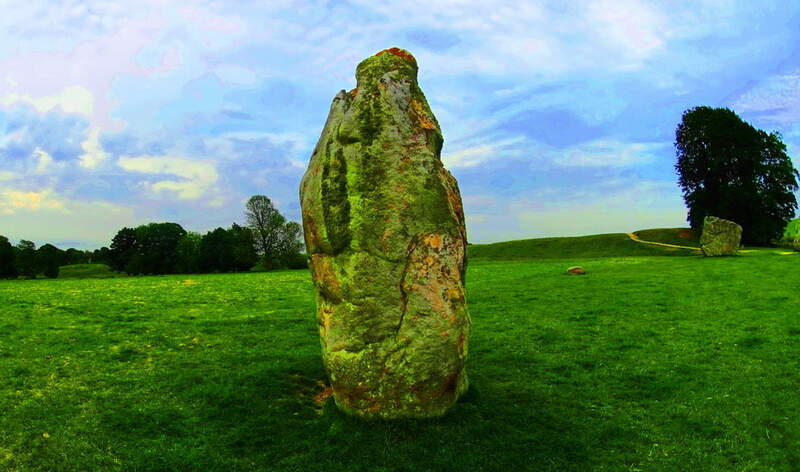 The original myths and stories of the English country-folk say that giants are the builders of Stonehenge. 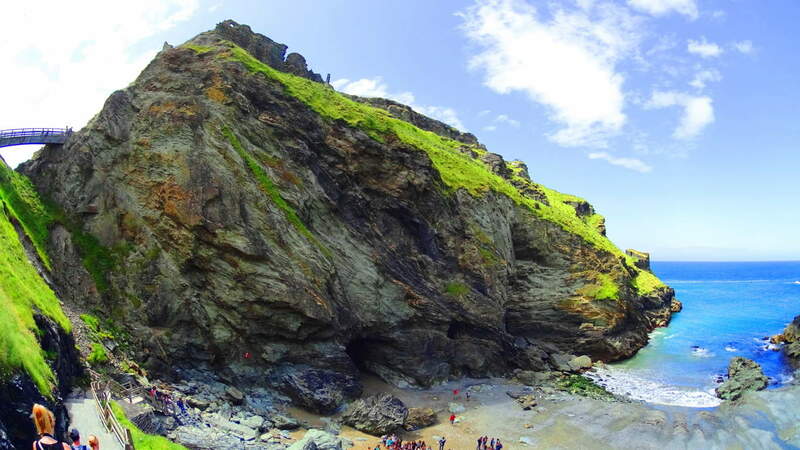 Ceremonies of Celtic Kings and tribal leaders have taken place within this sacred circle for as long as recorded time has existed, including fantastic tales of Merlin and King Arthur intertwined with the history. Today it is an internationally protected historical site, with a museum and bus that runs along the hills up to the site for a ticket price. You also have the option to walk if you so choose. 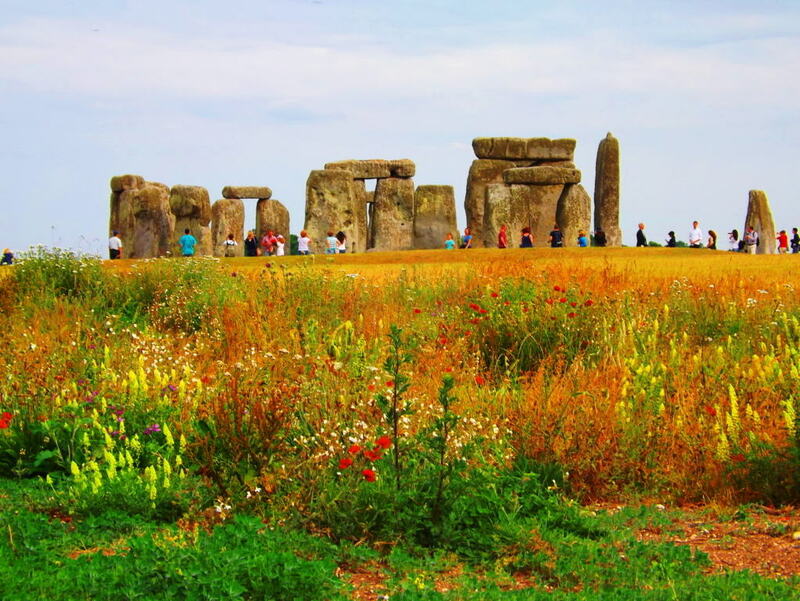 Stonehenge is the epitome and origin of everything magical about megaliths, once you see it, you cannot help but realize that so many wonderful things are still left to be understood. If you can, I hope you will give yourself that chance.